Q. Is Chanukah still relevant today? For the first time in Jewish history, the vast majority of Jewish people live in countries where they can practice their religion freely without oppression. If this is the case, is it necessary for us to relive the Chanukah story and reinforce its message? ​A. Chanukah celebrates two miracles. Firstly, the Maccabee's victory over the mighty Greek army. The Maccabees demonstrated that they would not allow anyone to dictate their relationship with Hashem. They were prepared to give up everything and anything in order to serve Hashem. The Maccabees had great Mesirat Nefesh (self sacrifice) and were willing to even give up their own lives for the sake of preserving their Judaism. The second miracle was the discovery of the flask of pure oil and its ability to burn for eight consecutive days. The core dynamics of this holiday have been repeated throughout Jewish history such as in the story of Purim, the Spanish Inquisition and the Holocaust. In all of these times, at great personal risk, the Jews succeeded in maintaining their beliefs against the attempts of others to forcibly change them. In general, when man is told not to do something, human nature dictates that he will get a kick out of doing that very thing which you know you are not supposed to do. It's natural to get a thrill from going against the odds and fighting for what one believes in. It is the same with Judaism. In Jewish history, Jewish people clung to Judaism when it was illegal. Therefore it is an even greater challenge for us today to cling to our faith because no one is opposing us or forcing us not to practice our beliefs. This is why we need Chanukah more than ever! Chanukah continues to inspire us to persevere and overcome great obstacles to living our Judaism. 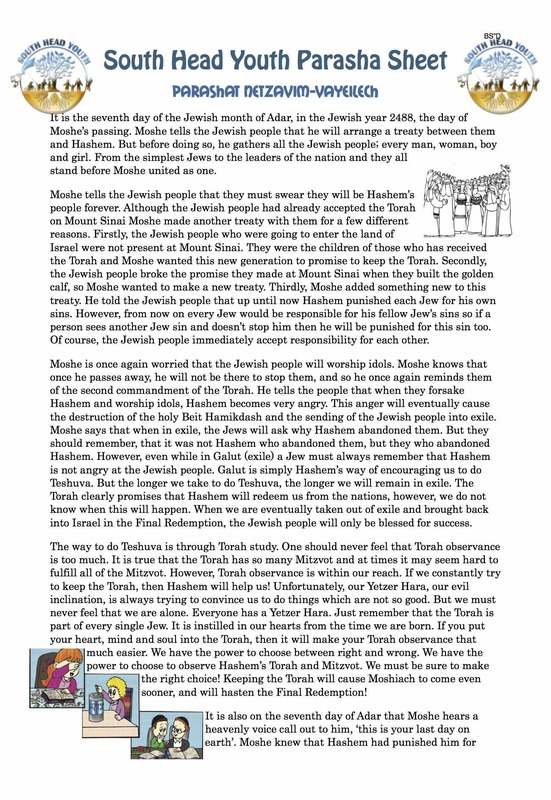 To learn all about the Parasha, download our Parasha sheet! Q. Yosef has some real big problems! His brothers had sold him into slavery and now he was imprisoned by Potiphar with no real hope of ever being set free. He had no idea if he would ever see his beloved father or any other member of his family ever again. Yet, when he saw the sadness in the eyes of the chief butler and baker who were thrown into prison alongside him, he was able to look beyond his own problems and offer them strength and hope. How was he able to do this? ​A. Even while Yosef was in the most miserable of places, he was able to focus on others rather than on himself because he realised that everything that happens comes from G-d. Yosef realised that everything that occurs is Divine Providence. Even though he was suffering in the prison cell and even though he yearned to be reunited with his family he realised that Hashem had caused him to be imprisoned for a reason. Yosef knew that while he did not currently know the purpose of his imprisonment, and even though his present imprisonment did not seem to be such a good thing, ultimately his imprisonment was for the good. This is what enabled him to offer the chief butler and chief baker hope even when he was in the most miserable of places. It was his faith in Hashem that allowed him to put his own problems aside and focus on others and help them in their distress. Very often we get caught up with ourselves and our problems. Our problems, whether real or imaginary are sometimes blown out of proportion and often take over our lives. However, we should not allow this to happen. We should be like Yosef. We should realise that everything that happens is Divine Providence and is ultimately for the good, even if we cannot see the revealed good. Having this faith in G-d is what will allow us to move further and help others rather than focus on our own problems. Having faith in G-d and believing that everything happens for the good will bring true happiness to yourself which you in turn will be able to share with others. Q. I am generally an observant Jew. However, I am involved in a business which makes it difficult to observe Shabbat. I am thinking of giving up this business, but this will not be an easy decision for me. What should I do? ​A. When Hashem created the world and when Hashem gave us the 613 Mitzvot to perform, He gave us the ability to perform the Mitzvot under all circumstances. Hashem also gave us the ability to overcome obstacles such as the challenge of working on Shabbat. Every Jew has the full capacity to be able to perform the will of Hashem. However, every person has free choice. It is therefore a matter of will and determination on the part of each Jew whether he will perform the commandments Hashem has given us. Living a Torah way of life is the only true way of life for a Jew and the only way for a Jew to be truly happy, materially and spiritually. A Jew should always remember that everything he has comes from Hashem. The money we have is also a gift to us from Hashem. Keeping Shabbat will not decrease your earnings. Hashem provides us with our wealth and Hashem decides how much wealth each of us will have. It is important to realise that the money one earns is not important, but rather that one should be able to spend it in good health and on happy things, and that is entirely in the hands of Hashem. Therefore, you should give up the business on Shabbat in order that you can fully observe the Shabbat. Place your trust and full confidence in Hashem and trust that He will take care of you, your family and provide you with parnassa that does not conflict with your observance of the Torah. 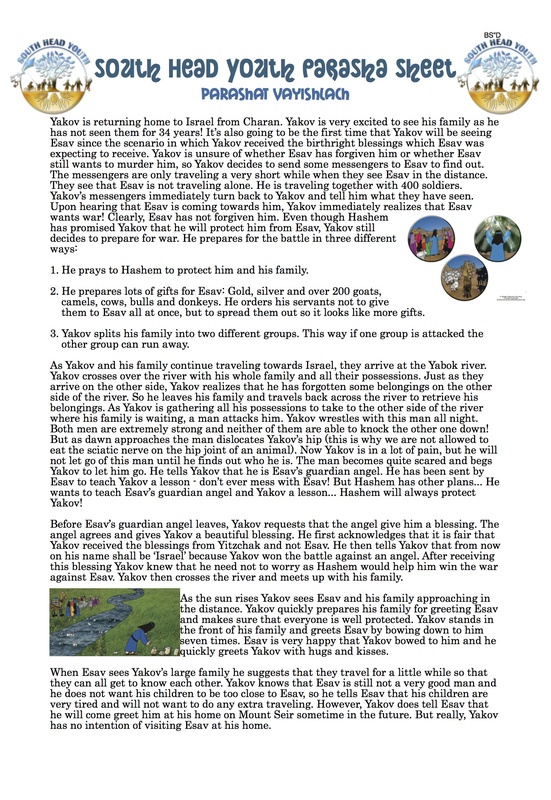 Q. Parashat Vayeitzei relates how Yakov found his life partner and established the ‘everlasting edifice’ of marriage. Many laws and customs of Jewish matrimony are derived from Yakov’s marriage. So what can we learn from this marriage? ​A. Our Sages describe the ideal marriage as an ‘everlasting edifice’. The prime requisite for establishing a firm and stable building is to ensure that it's foundation is strong and solid. When planning the rest of the building, equal attention is given to the external appearance as to strength; but when establishing the foundation, the emphasis is strictly on selecting the very best materials and the most rigid construction. The same can be said of the ‘edifice’ of marriage. It is vital that the substance of the foundation be suited to the needs of a Jewish home, and that it be rigid enough to withstand the many trials, tests and temptations of life. The ‘building blocks’ and construction materials which form the base of the Jewish home are Torah and Mitzvoth. In simple, concrete terms, the foundation consists of: Keeping a Kosher home, observing the Shabbat, observing the Torah laws of marital-relationships, having set time for Torah-study, giving Tzeddakah, displaying brotherly love to others. All of these Mitzvot should be done in a joyous and devoted manner! Q. The Parasha begins with the words, ‘And these are the generations of Yitzchak the son of Avraham; Avraham was the father to Yitzchak’. Why the repetition in the opening of verse of this week’s Torah portion? Since Yitzchak was the son of Avraham, it follows that Avraham was his father. What moral could there be implied by this repetition in the Torah? ​A. The expression ‘Yitzchak the son of Avraham, Avraham was the father to Yitzchak’ is the Torah’s statement of the ideal relationship between Jewish parents and their children, a relationship which we might term ‘two-way-pride’. We often hear children boasting about their parents and grandparents. In many offices and homes we will often find a picture hanging prominently on the wall of an aged couple, the man with a large Kippah, with wise and earnest eyes and a flowing white beard. The woman, her hair completely covered with a kind and noble expression. Our friend, makes no attempt to emulate his grandparents' way of life, yet he kvells with pride as he says 'these are my grandparents’ and launches a glowing description of the intensity of their religious life. Q. The book of Bereishit tells us about the lives of our forefathers, Avraham, Yitzchak and Yacov. Avraham was the father of Yitzchak, but also of Ishmael; Yitzchak was the father of Yacov, but also of Esav; but Yacov had perfect offspring. None of his children strayed from the path of Torah. How is it possible that Avraham and Yitzchak, two righteous men, our forefathers, each had unrighteous sons? ​A. Though Ishmael and Esav had fine parents and were born into Jewish homes, this was not a full guarantee that they would grow up to be a source of Torah pleasure to their parents. Hashem has endowed man with freedom of choice. Man has the right to choose between the path of life and goodness or the path that leads to the opposite direction. Ishmael and Esav chose the wild, unfettered path of devotion to world materialism, a path which led them to live by the sword to this very day. Yacov however, was a ‘dweller of tents’. Not only did he dwell in his own tent of Torah but he constantly saw to it that those tents should thrive. Even when his family moved to the land of Egypt, Yacov sent his son Yehuda ahead of the family to establish a Yeshiva, a place of Torah study, before the family arrived. In the merit of Yacov’s devotion to Torah he merited that all his children remained faithful to the Torah way. Some people might think that it was difficult for Yacov and his children to remain devoted to the Torah whilst surrounded by the hostile and powerful majority of the princes of Ishmael and Esav who were soldiers and hunters. However, the Torah teaches us and assures us that although in every period of history the Jewish people will always be a minority among the nation, the Jewish people should not be disheartened. As long as every Jewish parent maintains the attitude of our forefather Yacov, to be a ‘dweller in the tents’, and sets time for Torah study and sends their children to a Jewish day school or to Cheder, they have a guarantee that all their children will remain faithful Jews and the parents will have genuine Nachas from them, not only in the realm of the spiritual, but also Nachas in the plain material sense! Q. Parashat Vayeira begins by telling us that Hashem appeared to Avraham while 'sitting at the entrance of his tent, in the heat of the day'. Avraham had just had his Brit Milah. He was in a lot of pain. Why was he sitting at the entrance of his tent? ​A. 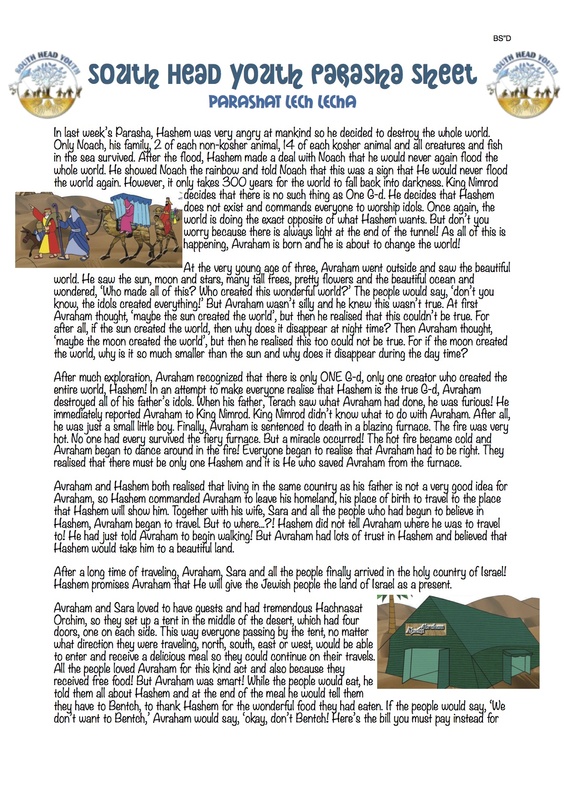 Avraham was looking for guests to invite into his tent. Avraham dedicated himself to deeds of kindness. He fed the hungry wayfarers in an effort to heighten their awareness of G-d. After feeding the hungry travellers Avraham would ask them to Bentch in order to thank Hashem for the wonderful food and drink which He had provided. When the guests would thank Avraham, he would tell them that it wasn't he who provided them with food, but Hashem. Hence, by providing the travellers with food and their physical needs, Avraham made them conscious of the spiritual reality. In every generation each and every one of us is hungry and thirsty, but not for bread and water, but to hear the word of G-d, and there must be Avraham's ready to host us and to provide us with our spiritual needs. At times, this thirst may be consciously felt, and at other instances a person may be unaware of his own thirst. But this lack of awareness does not change the reality. At the core of every man lies a soul that was created in the image of G-d. Every being seeks to express its fundamental identity. Therefore, when we emulate Avraham's example and extend ourselves to these individuals, we will discover a readiness to respond that reflects their inner G-dly nature. When we appreciate the world as one with G-d, our entire relationship with Him changes. Religion is not simply going to Shule or carrying out a certain body of laws, but an all-encompassing experience, affecting every element of our lives. Every situation in which we are found, every person whom we meet, gives us an opportunity to advance in our knowledge of G-d and our connection to Him. This is the heritage that Avraham gave to his descendants - to spread awareness that we are living in G-d's world, and that our lives are not intended merely to provide us with a little bit of enjoyment and satisfaction. Rather, we should see our life as a medium to make G-d's presence known to others. Q. The Torah only mentions Avraham briefly at the close of Parashat Noach, telling us that he was born, that he married, and that he accompanied his father on his journey to Cana’an. However, it is only in Parashat Lech Lecha, with the command, ‘Go out of your land, your native country, and your father’s house’ that the Torah begins unfolding the story of Avraham. Why is the emphasis placed here? ​A. Prior to leaving his homeland, Avraham had already attained a level of Divine Service. 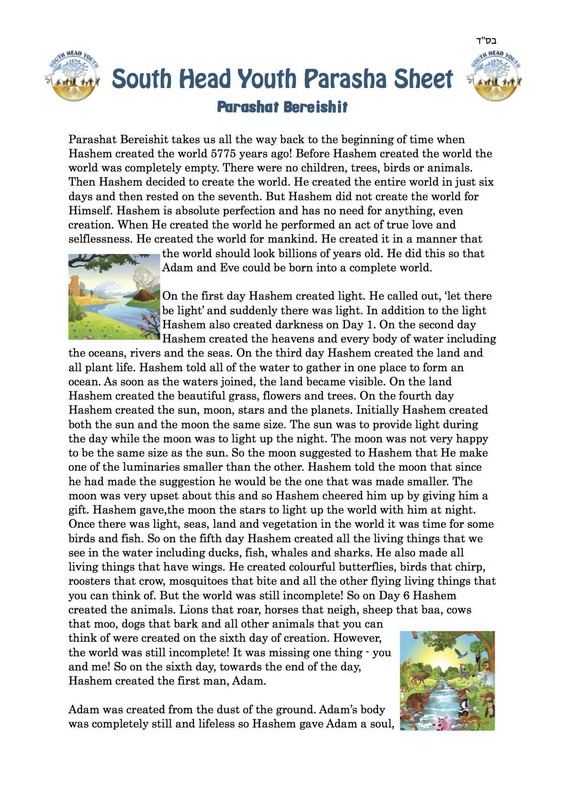 He had recognized that Hashem was the Creator of the World at the young age of three. He had been willing to sacrifice his life for Hashem (when he destroyed his father's idols), and a miracle was performed to save him. However, all this merely represented Avraham’s own striving to become close to Hashem. The command of Lech Lecha, ‘Go out of your land’, began a new and deeper relationship between Avraham and Hashem. For as our sages tell us, ‘a person who observes a Mitzvah because he is commanded to do so is greater than one who observes without having been so commanded’. The word Mitzvah had the same root as the hebrew word, Tzavsa, meaning ‘together’. When a person fulfills a Mitzvah because he has been commanded to do so, the act connects him to Hashem. In contrast, if the person were to perform the same Mitzvah without having been commanded to do so, the act, however worthy, would simply remain a good deed. Lech means ‘proceed’, referring to the beginning of a journey. This concept is alluded to in the Torah’s description of Avraham continuing on his way and traveling in the direction of Jerusalem, the place where Hashem’s presence is most manifest. Real spiritual progress requires that one leave one’s current state behind. Yet, as long as an individual’s growth depends entirely on his own power, his progress will be limited; no one can exceed the bounds of his own understanding. In contrast, when one’s progress is guided by G-d, there’s no limits to the potential for growth. The Torah and Mitzvot can take a person far beyond his natural horizons. To accentuate this point, Hashem tells Avraham to proceed ‘to the land that I will show you’ without specifying a destination. The expression ‘I will show you’, arecka in Hebrew, can also mean ‘I will reveal you’, meaning that through the journey to the land of Israel, Avraham’s true self was revealed to him, This is also indicated by the expression Lech Lecha, which literally means ‘go to yourself’, i.e. ‘to your essence’. As we proceed through life, each of us if given the chance to discover who he is, what G-d is, and that the two are one! 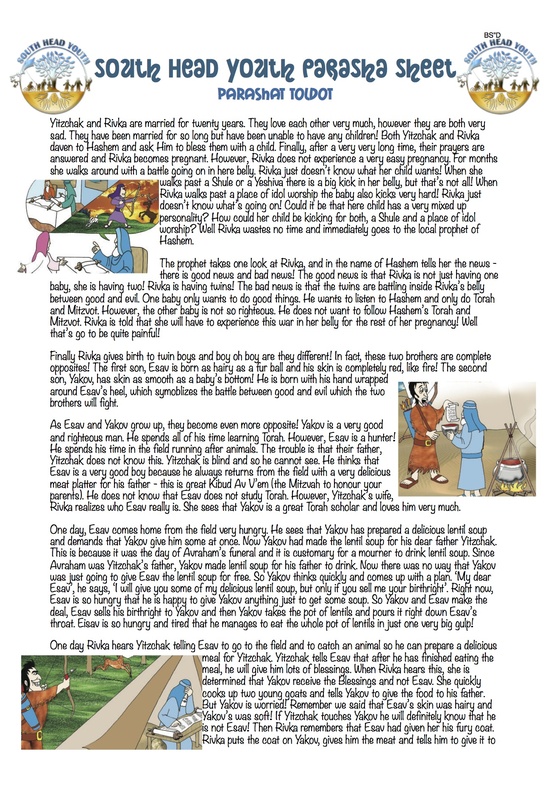 The Torah portion relates how G-d tells Noah that because he was righteous he and his family would be saved. Although all mankind would be punished for their wickedness and annihilated in a terrible flood, Noah and his descendants would be saved. It was for this purpose that Noah built an ark according to G-ds specifications. When the rain waters came, Noah and his family entered the ark. ​Noah and his family’s time in the ark was far from a pleasure cruise. During their time in the ark Noah and his family brought food for the animals, cleaned their stalls and took care of their needs. This teaches us an important lesson. No person exists for himself. We were all created for a purpose. According to Jewish teachings, we have a World to Come, the afterlife, where the souls bask in Diving light. However, until a person reaches that stage he must work! He must fulfill his mission on earth. We have all been given a mission - to create a dwelling place for Hashem. And to be complete, that dwelling must encompass every element of creation. Therefore, every element of our environment is important and deserving of our concern and attention. This means, that a person cannot seclude himself in a Synagogue or in Torah study and claim that he is creating G-d’s dwelling. For if Hashem only wanted prayer and study He would not have created a physical world. He would have made us spiritual beings with heightened intellectual potentials. However, Hashem did not do this. Rather, He created us as mortals and placed us in a material environment. Therefore our lives should be dedicated to caring for every entity created within the world and revealing the G-dly spark it contains and the reason for which it was created! Man’s task in life is to take the abstract ideal and make it actual! 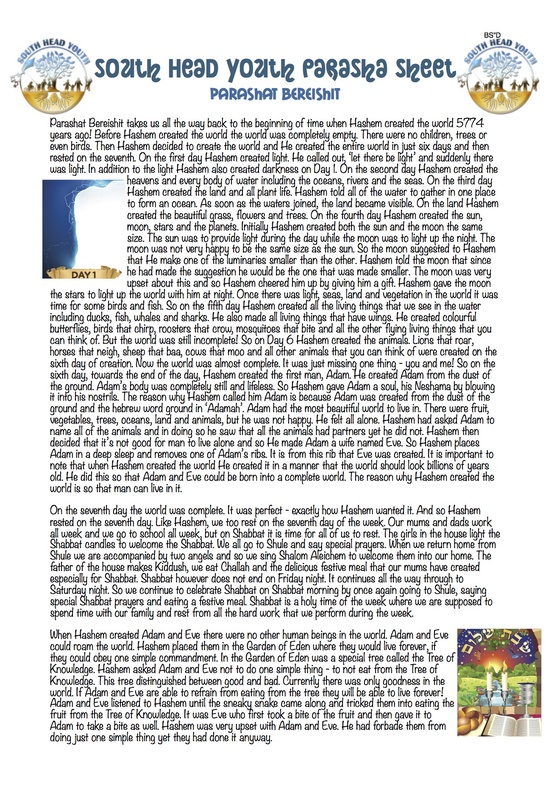 Q. Adam’s life in the Garden of Eden was considered the epitome of ‘good living’. Yet Adam never had a chance to enjoy complete rest or relax free of duties and responsibilities. Even before violating G-d’s command, Adam’s job was to work and watch the Garden of Eden. Could G-d have not shown greater kindness by creating a perfect world where nothing would be lacking, work would be superfluous and labour would be unnecessary? ​A. We are told that man was created after everything else so that he should find all his needs already provided for. Nevertheless, man is still required to work! This is because G-d did not wish to shower upon men undeserved bliss and good. He did not want to leave no area for men to work at and exercise his creativity. On the contrary, G-d wanted to give man a sense of fulfillment and accomplishment. Something man could consider his own! There is definitely greater appreciation of that which man earns by the labour of his own hands than what he would receive as a ‘handout’. In fact, a person would prefer a single bushel of his own to nine bushels received as a give away! Of course, things would certainly have been easier and less complicated if we were to receive everything on a silver platter without the effort and sweat on our part. But as the Zohar says, that would be eating ‘the undeserved bread of shame’. There is a saying ‘it is hard to be a Jew’, a minority in an alien society, where one finds the goings rough, discouraging and hard. Nothing comes easy; yet this too is for our own good! Only that which we rightfully earn through persistent work and effort gives true satisfaction; the sense of victory comes only after a challenge. Perhaps, if things were easier and hardships would be eliminated much more would be achieved. But, then a gain, the ‘examination papers’ of life are marked for effort even more than for accomplishment! Q. This week’s Torah portion begins, ‘You are all standing together this day before G-d… the leaders of your tribes, your elders, your officers, all the men of Israel, your children, and your wives… to pass into G-d’s covenant’. What is the intent of a covenant? ​A. When two people feel an attraction to each other, but realize that with the passage of time, that attraction could gradually disappear, they establish a covenant. The covenant maintains their connection even at times, when on a conscious level, there might be reasons for distance and separation. This Torah portion is read each year on the Shabbat immediately preceding Rosh Hashana because on Rosh Hashana the covenant between G-d and the Jewish people is renewed. On Rosh Hashana, we all stand before G-d. Our Neshama and the essential G-dly core which every Jew possesses rises to the forefront of his consciousness and the fundamental bond between G-d and Mankind surfaces. It is on this basis that a covenant is renewed for the entire year to come, including the inevitable occasions when these feelings of oneness will not be experienced as powerfully. Additionally, the Torah states that this covenant is established when all the Jewish people are standing together. This implies that the establishment of a bond of oneness with G-d is also mirrored by bonds of oneness within our people. For the same spiritual potential that motivates our connection to G-d evokes an internal unity which binds our entire people together. The essence of every Jew is a soul which is a G-dly spark. Part of Hashem is within us and that is why we are bound to Him. Every Jew shares this infinite and unbound spiritual potential equally and this is why we are bound to each other. This is also why the covenant is established as we stand together. For as we focus on the inner motivation for our relationship with G-d, we realize that this spiritual reality is all-encompassing and joins us with each other. When we stand together as one we generate a climate fit for blessing. Standing before G-d as one on Rosh Hashana will lead to a year of blessing for all mankind, in material and spiritual matters. Q. The conventional translation of Teshuva is ‘repentance’. A more literal meaning of the word, however, is ‘return’. Repentance is a concept understood by Western society. Teshuva, ‘return' is a uniquely Jewish term. What is the difference between the meaning of repentance and return? ​A. Teshuva reflects a radically different approach in our relationship with Hashem. Repentance however, implies a reversal of one’s conduct - a recognition of past shortcomings, and a firm resolution to change in the future. It is the awareness of our imperfections that causes us to improve our ways. ‘Return’ emphasizes the fundamental spiritual potential that we each possess. Every one of us possesses a Neshama, A G-dly soul. The G-dly soul connects us to Hashem. The infinite G-dly spark within each and every Jew represents the core of our beings and who we really are. Evil and sin are superficial elements. They are incidental factors that prevent out true selves from being expressed. Teshuva, ‘return’ means re-establishing an awareness of this G-dly core, and making Torah the dominant influence in our lives. So, seen in this light, it is not our inadequacies which motivate us to do Teshuva. Rather, it’s our positive inner core. Teshuva is a natural expression of the positive spiritual potential which all Jewish people possess. Additionally, repentance is usually associated with sadness. It is generally feelings of regret and remorse that play a leading role in motivating a person to change his conduct. By contrast, Teshuva, ‘return’ is characterized by joy. Through Teshuva, a person renews his connection to Hashem and reawakens his own spiritual potential. These are reasons for happiness. Indeed, if this happiness is lacking, it is a sign for the person striving to do Teshuva that more effort is required for the 'return' to be complete. Defining Teshuva as 'return' also broadens the scope of it applicability. There are many people who feel too estranged from G-d to be prompted to repent. Defining Teshuva as accessing a spiritual potential that exists within each of us, makes this mode of G-dly service relevant to each person; from the most alienated to the most righteous. The Divine potential which we possess is infinite. Every person can do Teshuva. No matter how low a person has descended, there is nothing that can prevent him from reversing his conduct, and establishing a bond with G-d.
Q. The Mitzvah and the highlight of Rosh Hashana is to hear the Shofar, a simple ceremony of sounding a ram’s horn. Even in ancient days there existed fine musical instruments, yet the refined strains of music of all musical instruments will not do. The commandment of blowing the Shofar specifically requires the use of a simple horn, producing simple sounds. Why? ​A. Rosh Hashana is the anniversary of the creation of man, the last of all creatures and the highest in the order of development. Man’s preeminence over beast is in his intellect. One might therefore think that the Rosh Hashana service would be highlighted by intellectual discussions in which man can demonstrate his superiority over all forms of creation. Yet, the highlight of the Rosh Hashana service is Tekiat Shofar, the blowing of the Shofar. There is a profound lesson in this: Rosh Hashana, the beginning and foundation of the whole year, is inaugurated through the sounding of the horn of a beast. This teaches us that although man is an intellectual creature and must use his intellect in his daily life, the basis of his intellectual life must be submission to G-d, with the absolute submissiveness of the intellect-lacking beast. Q. The Mitzvah of Rosh Hashana is to hear the Shofar. The Shofar is not blown on any other holiday. The sages tell us that the Shofar is blown so as to confuse the Satan. Rosh Hashana is judgement day, and on Rosh Hashana Satan acts as accuser. Having seduced man to sin, he then returns to accuse him of the very sin which he incited. But, when he hears the sounds of the Shofar he becomes so confused that he loses track of the proceedings and is unable to prosecute effectively. How could it be that the sound of the Shofar has such a devastating effect upon Satan? All year round, Satan is full of fire and fears no one, and suddenly he trembles on Rosh Hashana on account of a few Shofar blasts? ​A. The sages tells us that Satan is confused by the numerous sounds produced by the Shofar. The Shofar makes three different sounds: the Tekiah is a long blast, the Shevarim is a broken-up blast which is followed by a tremulous sound of the Teruah. The three different sounds of the Shofar represent different types of Jews. The Tekiah, a straight simple sound, represents the Tzaddik who is righteous, uncomplicated and honest. Shevarim, which means broken, represents the evil-doer who is not satisfied with his own evil ways. He is crooked himself and wants to see all that is whole broken and all that is straight made crooked. 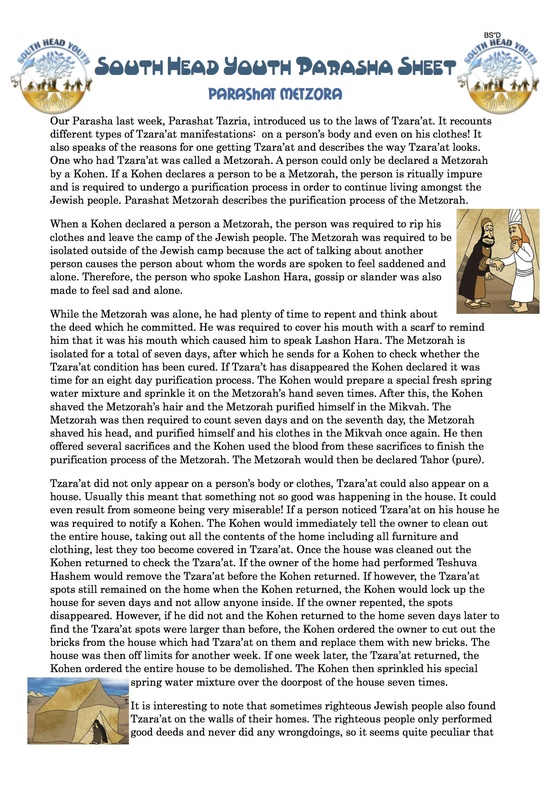 Teruah means torn-apart. It represents the tormented soul of the Ba’al Teshuva who regrets his past and is now struggling to become Jewishly aware. He is not an evil doer, nor does he seek to break. He just knows very little about being a Jew. His soul is torn because of its past. His soul yearns to enter into a better and refined Torah way of life. The Shevarim-Teruah is a mixture of the evil-doer and the Ba’al Teshuva. This person is not committed to one way of life, but fluctuates from one extreme to the other. Rosh Hashana is the judgement day for all Jewish people. The Satan realizes that it’s in his best interest to overlook the Tekiah, righteous Jew. However, Satan anticipates destroying the Jews represented by the other three sounds because they have unfortunately provided him with enough ammunition to prosecute and destroy them. It is for this reason that our Sages devised an ingenious legal procedure for the Judgement day, which the evil Satan himself cannot overcome. They have established a rule that a Shevarim or Teruah or Shevarim-Teruah is never blown alone. Each Shevarim and each Teruah sound is preceded by a Tekiah, Thus, we never see the evil doer, the rent soul or the wavering Jew step up alone before Hashem at the Court-on-High. These Jews know very well that if they were to be judged alone, they would not come off very well. They are fortunate in having two companions, the Tekiot on either side. They all step up to the Court-on-high and say ‘We wish to be judged together. We are brothers, inseparably attached and responsible for one another’. The Satan is now unable to produce a valid case against all the types of Jews. If the Satan accuses Shevarim of a certain ‘break-up’ it is quickly covered by the evenness and straightness of the Tekiot. The same happens in the case of the Teruah and the Shevarim-Teruah. They all come to the Court-on-High with the Tekiot supporting them on each side, and the Satan loses! Therefore, it is understandable that Jews flock to Shule on Rosh Hashana, more than all year round. Jews feel innately that only together do they stand a chance. When all of them stand together, even the crafty Satan cannot prevail. They come to pray together with the great community of Israel and are confident that in their merit, they too will be blessed with a Shana Tova, a Happy, Healthy and Prosperous New Year and will be inscribed and sealed in the Book of Life for a happy and healthy sweet New Year! Q. This Shabbat is Shabbat Mevorchim Elul. Elul is the month immediately proceeding the High Holy Days of Rosh Hashana and Yom Kippur. The month of Elul is compared to a businessman who periodically takes inventory, balances his accounts and determines where he stands financially. How is this so? ​A. The month of Elul is a month of introspection, stock taking and spiritual accounting. Just as the businessman is required to perform regular periodic accounting procedures to keep the business on the right track, we too need to follow similar procedures in our service of G-d, which is our ‘business’. During the 'business year' we ‘deal’ in Torah and Mitzvot, and in the month of Elul we do our general accounting. The businessman spends most of his time engaged in commercial activity. He pauses only to weigh, examine and consider particular transactions that he is considering to see whether they are profitable, and to determine the best approach. Only periodically does he conduct an examination of the overall status of the business. If he were to do so every day then he would have no time to conduct business! For us, the Jewish people, the time for general accounting, for taking stock of where we stand in the overall picture, is during the month of Elul. Throughout the rest of the year we must be pre-occupied with learning Torah and observing Mitzvot, pausing only for short-range stock-taking. Every day, when we recite the Shema before retiring to bed, we sum up the credits and debits, the achievements and deficiencies of that day; before Shabbat we examine the accounts of the past week and before Rosh Chodesh we balance the account for the past month. When Elul arrives, we must examine thoroughly where we stand overall. Q. Parashat Eikev tells us that we should teach Torah to our children. This is a principle with which hardly anyone disagrees. But when should Torah education begin? At what age is the Torah education and Jewish upbringing of our children to start? ​A. Torah education begins before a child is born. When the unborn child is developing in his mother’s womb, the forces that shape and mold his future character and conduct are already operating. Just like the chemical nature of the mother’s diet can influence the embryo’s physical wellbeing, so too, the spiritual nature of her diet (for example, keeping the laws of Kashrut) can influence the unborn child’s spiritual development. Therefore, according to Torah, Jewish education should start before the child is even born. Modern psychology has recently found that the newborn baby in his cradle absorbs certain lasting impressions from his immediate surroundings. Jewish women have known this for years. This is why Jewish mothers soothe their babies and rock them to sleep with Jewish lullabies. Even though the child cannot yet speak or understand, he is still educated in the cradle. Jewish education is very important when a child begins to speak. As soon as a child learns to articulate his first words, his parents should teach him the Hebrew verse; Torah tziva lanu Moshe, morasha kehillat Yaakov, which means 'The Torah that Moshe commanded us is the heritage of the congregation of Jacob'. The child is obviously too young to understand who Moshe was or what the Torah is, yet he should still be taught these words as one of his first complete sentences. The child’s Torah education expands when the child learns to understand and comprehend. Many parents are of the opinion that children’s education cannot start if the child cannot comprehend what he is being taught. Thus, they postpone their child’s Jewish education for a number of years. This is not the view of our Torah sages who say that Torah education begin before the child is even born. Evidently, Jewish education is not a matter of just enrolling a child into Hebrew school. It actually starts long before; while the child is in the womb, when he’s in the cradle, when he’s learning to speak and when he’s learning to understand. Q. This week’s Torah portion contains the Shema, the fundamental prayer of Jewish liturgy. What is so special about the Shema? Why is the Shema prayer the message associated with our people’s martyrs? ​A. When a person recites the Shema, he is not merely declaring that there is only one G-d. He is stating that all existence, everything in the world is one with Hashem! Judaism does not believe that the spiritual and physical can be separated from each other. We do not believe that Hashem sits in the heavens and allows the world to function on its own. Rather, we believe that the spiritual and physical are both manifestations of a single unity. This is hinted to in the word echad, the hebrew word for one. Echad is the last word in the first verse of Shema. The word Echad is made up of three letters. The first letter, alef, stands for G-d’s infinity. The second letter, Chet, is equal to the number eight, referring to the seven spiritual realms and our material earth. The third letter, Dalet, is equal to the number four and it alludes to the four directions of the earth. The word echad teaches us that the letter alef, symbolizing G-d’s infinity, permeates the chet, all eight levels of existence, and more particularly the dalet, the four directions of the world. In other words, wherever we go, there is nothing apart from Hashem. This teaches us why the Shema is associated with our people’s martyr’s. When a martyr gives up his life for the Jewish faith, he is making a statement that he refuses to separate the physical from the spiritual. He will not live a life that does not reflect his inner G-dly essence. If he is forced to sever his connection with Hashem and live a life in contradiction to his Jewish beliefs and what he feels is right, then he would rather give up his life for he cannot live a life that runs contrary to his spiritual core. This emphasizes the fact that the Oneness of Hashem is an actual reality! Q. The Shema commands us to love G-d. But how can the Torah command us to love? Either you love or you don’t. No one can tell you to love! A. The commandment to love G-d follows the declaration of Hashem’s Oneness. When a person understands the Oneness of Hashem and appreciates how Hashem is manifest in all existence, he will be spurred to feelings of love, for intellect gives birth to emotion and our awareness of G-d prompts us to love him. Q. This week’s Shabbat is given a special name, Shabbat Chazzon, which means ‘the Shabbat of vision’. It refers to the Haftorah which speaks about the prophet Isiah’s warning to the Jewish people about impending destruction. The Haftorah opens with the words ‘A vision of Isiah’. Rabbi Levi Yitzchak of Berditchev, a great Chassidic master, would say that on Shabbat Chazon every Jew receives a vision of the Third Beit Hamikdash. This is quite paradoxical! The Shabbat that precedes the saddest day of the year, Tisha B'Av, commemorating the destruction of the Beit Hamikdash, also heralds the ultimate redemption and rebuilding of the Third Beit Hamikdash. What can this mean? ​A. This paradox reflects the unique nature of the Jewish people. The Jewish nation is prone to extremes - whether we are at the highest peaks or lowest depths, the Jewish nation is not ordinary. This is because the Jewish people share a connection with Hashem. Hashem is infinite. The essence of Hashem is not computable. Hashem creates rules rather than conform to rules. That essence was implanted inside of every Jew. Therefore the Jewish people will be exceptional at times sinking to the depths about which Isiah spoke, and at times rising to the peaks that enable us to anticipate the revelations of the era of Redemption. The fact that these two extremes are interrelated is very unique; the descent leads to the ascent. Hashem structured the challenges of exile to compel us to express our deepest spiritual potential. Just as Hashem presented us with these challenges, He gave us the ability to overcome them. Therefore the descent into the deepest Diaspora exile brought on by the destruction of the Beit Hamikdash and commemorated on Tisha B’av, enables the greatest ascent of all to be realized - the building of the third, permanent Beit Hamikdash by Moshiach speedily in our days! We are currently in the period of the Three Weeks. The period began with the Fast of the Seventeenth of Tammuz which commemorates the destruction of the walls of Jerusalem and the capture of the city. This period ends with Tisha B’av, which commemorates the destruction of the holy Beit Hamikdash. Q. The Sages tell us that the Beit Hamikdash was destroyed as a result of the baseless hatred between the Jewish people. Even during the siege of Jerusalem the Jewish people remained divided and had a lack of concern, love and respect for each other. How can we correct this today? ​A. During the period of the Three Weeks we are to take stock of the faults that led to the destruction of the Beit Hamikdash and try to eradicate them from our own conduct. We need to show unrestrained love by reaching out to other people and showing them care and concern. We need to do favours for other people, not because we will receive a reward but because we really care for them. Rather thank think of reasons why you should help another person, use that time to think about how you can help him. By being an initiator of good deeds, you will cause others to do good deeds too. Some might react sooner than others, but eventually everyone will react as ultimately the heart opens to the heart. There is no human being who can see another person continue to shower good upon him without being moved. By reaching out and helping others we are bringing out our inner core, the G-dly soul the lies within us. Reaching out with love and kindness ensures and encourages the goodness and generosity that lies at the core of all others to come to the surface. Such deeds will bring us closer to the Era of Redemption and the rebuilding of the Third Beit Hamikdash. Q. What is the function of Torah and Mitzvot? ​A. The Torah has numerous facets. It may be a means to gain a reward and avoid punishment, or a guide to good living. The world has been created and therefore can have nothing in Common with its Creator. The world consist of a variety of creatures which are generally classified into four categories; minerals, vegetation, animals and mankind. Even if we consider the highest of these groups: man, and the highest individual within this group: a great Torah sage, there can still be nothing in common between him and G-d our Creator. This is because man is a created, limited being, while G-d is infinite. However, G-d has given us the ability to connect with Him and become close to Him. The study and observance of Torah and Mitzvot allows a finite being to reach beyond his limitations and commune with the infinite Creator. This is one of the reasons that some Mitzvot find expression in material things as the laws of Kashrut, Tefillin and Tzitzit. Since our intellect is created it can only deal with the created, within the boundaries of creation. We can have no knowledge beyond those bounds. The Creator alone knows how He can be approached and He has revealed that these avenues of approach are through the performance of Torah and Mitzvot. One may question, ‘what relationship can a material object such as Tefilin have with G-d?’ to which one could also ask, ‘What relationship does the most spiritual being have with G-d?’ To the Creator, all created things - the most spiritual as well as the most inanimate - are equally removed. Q. In Parashat Pinchas, Hashem once again commands Moshe to take a census of the Jewish people. While all the other censuses were counted by Moshe alone, when Moshe took this census he was required to have the tribal leaders assist in the count of the other tribes. Why is this so? ​A. There were two aspects to this census. The singular aspect of the census required the counting of each tribe separately. The leader of each tribe was required to take part in the count of his own tribe. However, the second aspect of this census required the leaders of every tribe to assist in the count of the other tribes as well. The general objective of this census was to count the Jewish people in order to know their overall number. Therefore the census had to be done by someone connected to all Jews equally; Moshe fit the bill perfectly! The census was also performed in order to show Hashem’s love for the Jewish people. The Jewish people are very dear to G-d and by counting the Jewish people, G-d revealed their qualities. The counting gave the Jewish people importance. It made them an object worthy of numeration - which cannot become nullified. The previous censuses counted the Jewish people as one entity. It revealed the Jews’ general qualities and the essential quality of the Neshama. However, the count in Parashat Pinchas was also intended to reveal the Jews’ individual merits. This is why in this count, each tribe is tallied separately, for each of the twelve tribes had its own distinctive lifestyle, characteristics and manner of Divine service. Yet, while considering the particular qualities of an individual, every Jew remains part of a single entity. This indicates that there was an aspect in this count in which all were equal. Hence, although this count was connected with the particular qualities of individual Jews, nonetheless, every Jew was counted as equal to all other Jews. The reason for this is that counting the Jews in order to reveal the particular merits of each tribe, not only served to emphasize individual qualities in and of themselves, but these qualities taken as a whole comprise one totality - the Jewish people. This is why it was necessary for the tribal leaders to be involved in the census of the other tribes as well, for it was necessary to remind them that their individual tribe constituted part of the Jewish people as a whole. Q. The Parasha speaks of three outstanding miracles: the 'Clouds of Glory', the Manna and the ‘Well of Miriam’. What were the essential characteristics of these three miracles? A. The 'Clouds of Glory' protected the Jewish people externally. They protected them from harsh winds, dangerous animals and they cleaned and pressed the Israelites' clothes. The Manna was a wonderful food which would taste according to what the person eating it desired. Food is something that is absorbed internally and provides nourishment and sustenance. The ‘Well of Miriam’ was a source of water. The principal function of water is to act as a medium to carry food to all parts of the body. The different aspects of ‘dimensions’ of Torah are signified and paralleled by the ‘Clouds of Glory’, Manna and the ‘Well of Miriam’. There is an aspect of Torah which is absorbed internally, like the Manna; there is an aspect that provides external protection, like the ‘Clouds of Glory’, and there is an aspect of Torah that carries the ‘external protection’ and ‘nourishment’ to all Jews, like the water of Miriam’s Well. The Manna in Torah: Torah comes from the Hebrew word Hora’ah, teaching, signifying that Torah provides a code and guide for our conduct in life. This guidance must be thoroughly understood and absorbed, so that each person may know exactly how to guide his own conduct as well as that of his family and household. Just as the Manna was presented in different ways to those of different spiritual levels (the righteous finding it ready to eat while others had to grind it) so is Torah ingested in different ways according to the absorptive capacity of the individual. Clouds of Glory in Torah: When we set out of the wilderness in the every day world where evil forces are abound (like the dangers in the Sinai desert) we are protected by the force of Mesirat Nefesh, self-sacrifice, which each Jew possesses through his intrinsic connection with Torah. The ‘Clouds of Glory’ protected all Jews, even those who clung to idol worship. In a similar way this aspect of Torah encompasses each and every Jew, from the greatest to the smallest; it gives us the strength to go through the wilderness, not to fear the dangers, and be constantly inspired with a spirit of self-sacrifice. It is this Mesirat Nefesh which causes even the most remote Jews to cry out Shema Yisrael before their death. Water of ‘Miriam’s Well’ in the Torah: Water has the essential characteristic that it descends from high places to low places. The Torah descends from lofty heights to become clothed in the actual letters and words of the Written Torah and Oral Torah, which are thereby available to everyone. Whoever recites the words of the Torah or learns Torah, even if he understands no more than a simple explanation, receives the nourishment (Manna) and protection (Clouds of Glory) of Torah. Q. Korach’s complaint to Moshe was that the entire nation was holy, with each Jew possessing a spark of G-dliness within them. Since Hashem dwells among all the Jewish people Korach did not believe that one person should be exalted over the holy nation. He questioned, 'why should one person be leader over the entire Jewish nation'? A. A leader empowers people to realize their potential and express it. A leader motivates people and inspires them. Without such leadership, even though people possess positive qualities, it is possible that they might be lazy and fail to manifest them. Although all the Jewish people possess an essential G-dly spark, a Neshama, it was the responsibility of Moshe to bring that G-dliness into revelation. Certainly, they possessed the potential; but as we see from the Torah, there were many occasions when the Jewish people failed to live up to their potential. Moshe’s leadership motivated them to push forward and express who they really were. Moshe was not given the position of leadership to receive honor. He was charged with a mission and he followed it faithfully. Rather than think of himself, he thought of the Jewish people and what he could do for them. This was a full time responsibility! The entire time that Moshe led the Jewish people, Moshe thought about them and always put the Jewish people first. We must take a lesson from Moshe’s leadership in today’s day and age. In every generation we must seek leaders, people who will inspire us to utilize the positive qualities we possess. Rather than fear submission to their authority, we should welcome it, understanding that it will enhance our position and not detract from it. The guidance of a leader enables a person to accomplish more than he could through his own initiative. Leadership positions aren’t restricted to a select few. In our homes, workplaces, social environments and religious circles, we all serve as leaders from time to time. When we are given such a position, we should try to emulate the selfless dedication shown by Moshe. We must try to nurture our followers and assist them to achieve their potential, rather than seeking own personal advancement. The Parasha this weeks relates the story of Moshe sending spies to explore the Land of Israel before the entry of the Jewish people. The spies returned with a frightening report which caused the Jewish people to not want to enter the holy land. As a result Hashem punished the Jewish people by granting them their wish: the Jewish people would not enter the land at this present time. Rather, they would wander in the desert for forty years. Q. Moshe handpicked the spies. The Torah describes these men as men of wisdom and spiritual stature. These were men of faith and understanding. They were righteous men and wise men. How could such people commit such an error? A. The Chassidic Masters explain that this error came about because of the lofty spiritual nature of the spies. In the desert, they did not have to concern themselves with material affairs. They were well isolated from the world of hardships. A miracle fed them manna from the heavens, a miracle gave them water (the miracle of Miriam’s well), a miracle provided them with clothing and miraculous clouds hid them from their enemies. In such a world they did not have to concern themselves with the mundane world. They could focus their entire energy on spirituality. However, upon entering the Land of Israel all of this would stop. The Jewish people would have to work the land and reap its harvest and there would be less time to study Torah. Quite understandably the spies were hesitant to leave the miraculous desert world to enter the material. They knew that once they entered Israel they would no longer be able to devote all their time to Torah study. In contrast, Moshe insisted that the Jews leave the desert and settle in the land of Israel. Firstly he knew that miracles do not last forever and Hashem would not continue to sustain the people in the desert indefinitely. More importantly, Moshe knew that staying in the desert was contrary to G-d’s intent in the creation of the world. The purpose of the world is to create a dwelling place for Hashem. The ultimate purpose and aim of Torah is deed! It is not sufficient to become involved in Torah in theory. On the contrary, the land of Cana’an and all of the cultures within it had to be actually conquered in order to make the land holy. This teaches us two lessons. On the one hand, we must occupy ourselves in the material concerns around us. On the other hand we should not see these material concerns as ends in their own right, but merely as the vessels through which to carry out Hashem’s intent in establishing a dwelling. This approach will prepare us for when we will re-enter the land of Israel, led by Mashiach! Q. At the conclusion of Parashat Behalotecha we read how Miriam, Moshe’s sister, had to live outside of Israel’s tent encampment for seven days. During this time, the Jewish nation did not travel. Two million people with all their leaders, prophets, judges and sages delayed their travels for just one woman! What was so special about Miriam that the Jewish people delayed their travels until Miriam was purified and allowed to rejoin the Jewish camp? A. Amram, the father of Aharon, Miriam and Moshe was the leader of the Jewish people prior to the Exodus of Egypt. 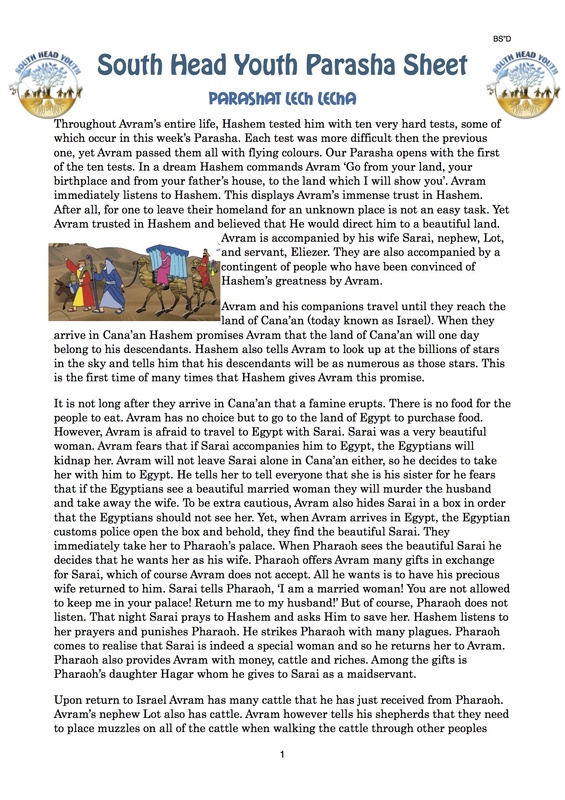 When Pharaoh decreed that all baby boys be thrown into the nile, Amram divorced his wife. He declared that it was useless for the Jewish people to continue having children if they were going to be killed by Pharaoh. As Amram was the leader of the generation, all the Jewish men followed his example, and so, they too divorced their wives. When Miriam saw what was happening she said to her father, ‘your decree is worse than Pharaoh’s! 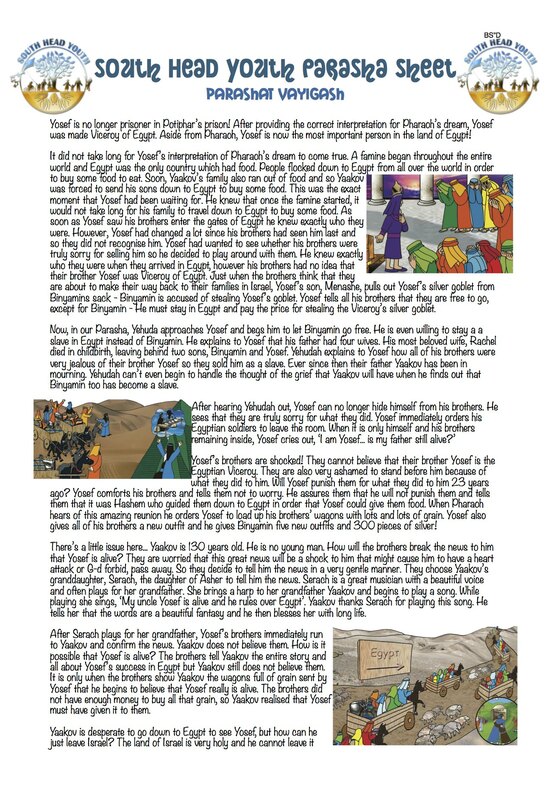 While Pharaoh's decree is only against the boys, your decree is against both, boys and girls!’ Amram saw the wisdom in Miriam’s words and he immediately remarried Yocheved, and all the Jewish men, inspired by his example, remarried their wives. The result of Miriam’s actions was that Moshe was born! When Yocheved placed Moshe in a basket in the river, Miriam stood by the river waiting to see what would happen to her little brother. When she saw Pharaoh’s daughter, Batya, take Moshe out of the nile river and saw that Moshe would not accept the non Kosher milk from Batya, she immediately approached Batya and offered to find her a Jewish wet-nurse to provide milk to the Jewish baby. It was Miriam’s actions, the mere actions of a four year old, that brought about the deliverance of the Jewish people! This is why the Jewish people did not continue their travels without Miriam. The shining example of Miriam shows us what young children can accomplish. Miriam teaches us that even the very young can and should influence their friends and family to study and observe Torah and Mitzvot, thereby bringing deliverance to all our people. Q. 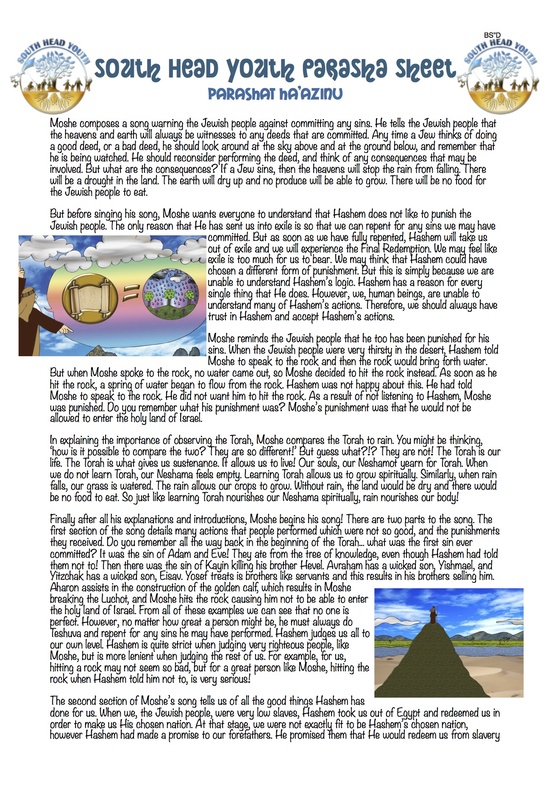 Why did Hashem choose to give the Torah in the desert. Does it not seem strange that such a magnificent, historic event would take place in a desolate desert, rather than a more beautiful, scenic area? A. The Rabbis explain that Hashem wanted the Torah to be given in a desert in order to teach a lesson regarding Torah learning. Just like a desert has no specific owner and everyone is free to use it, so too the Torah has no specific person who can claim ownership over it. Every single Jew has a connection to the Torah, and through studying it, the Torah becomes ‘theirs’. The Chassidic masters expound on this explanation. They state that it should have been enough for Hashem to give the Torah to the Jewish people in any ownerless place. However, the Torah was given in this desert because it was dry and desolate and lacked even the most basic necessities. The fact that the Jewish people needed to depend on Hashem to provide for all their needs, teaches us a very powerful lesson. In order to be considered ready to receive the Torah, one must realize that when he is involved in Torah learning, he must rely on Hashem to provide him with everything he needs. He cannot worry during learning about where his food, clothes or money will come from. He needs to have faith in Hashem and this faith will guarantee him all physical and spiritual blessings required. Often, when it comes to Torah learning, people come up with all sorts of excuses. For example, the businessman says that he doesn’t have time to learn Torah so instead he focuses on giving Tzeddakah. However, we need not worry about our needs. Rather, we should spend our time learning Hashem’s Torah and trust that Hashem will provide us with all our needs, just as He did in the desert. It is interesting to note that when Hashem asked the Jewish people for a guarantor to ensure the Jewish people will always remain committed to Torah and Mitzvot the Jewish people first responded ‘our parents will be our guarantors’. However, Hashem was not satisfied with this response. So the Jewish people said ‘our prophets will be our guarantors’, but once again, Hashem did not accept. Finally, the Jewish people cried out, ‘our children will be our guarantors’ and Hashem finally accepted. The Lubavitcher Rebbe teaches us that the Jewish people are the chosen nation, and have a love for learning Torah. The Torah is our pride and glory! Nevertheless, there could come a time that a Jew will still overlook his commitment to Torah and Mitzvot and it was for this reason that Hashem wanted guarantors who would ensure the Jewish people’s commitment to Torah in all situations. The children are the most suitable guarantors because the commitment of educating the children in the way of Torah, is the best possible guarantee for the future of Judaism. If a child is educated from a young age in the ways of the Torah, when he grows older it will remain with him. The child will be able to have a positive influence on his parents, children, friends and relatives, that they too should become more committed to Torah and Mitzvot. This is commanded of every one of us, that we ensure every child receives a proper Jewish education. Only through educating the youth will we guarantee a strong future for the Jewish people. In return, those children will have a positive effect on their parents. Through our commitment to keep the guarantee that was made at Mount Sinai, we will merit to receive the Torah once again with joy and in an internalised way. The above lesson is based on the teachings of the Lubavitcher Rebbe. Q. Why was it necessary to take a census of the Jewish people? Surely Hashem should have known how many Jews there were in the Jewish nation! A. Our Sages tell us that Hashem loves the Jewish people dearly and therefore He counts the Jewish nation all the time. It is like a rich man counting his gold; Hashem continually counts what is dearest to Him - the Jewish people. Additionally, a census focuses on something that is particularly relevant regarding the Jewish people: their essential equality. For when Hashem commands that a census be taken, every Jew is counted equally. Those with the highest potentials and those on the lowest levels, are all regarded as equals. No one is given greater priority and no one is considered more important or greater than anyone else. Furthermore, every Jew has a spark of G-dliness, a Neshama, inside of him. The Neshama is the essence of our being. At this level, we are all equal. Therefore, when taking a census, every one of us is counted equally. Our Sages tells us that a census has been taken nine times in Jewish history. The tenth and final census will be taken at the time of the coming of Moshiach, at which time the Neshamot of every single Jew will flourish. Then we will be able to bring out the inner G-dly potential in every aspect of our lives. Parashat Bechukotai speaks about the rewards Hashem will give the Jewish people for performing His Mitzvot. There are two kinds of rewards for the performance of Mitzvot, which are discussed below. 1. The reward of the Mitzvah is the Mitzvah itself: Before performing any Mitzvah we recite a standard blessing which begins with the words ‘Blessed are you Hashem our G-d, Creator of the universe, who made us holy with His commandments and commanded us …’ Our ultimate motivation in performing the Mitzvot is not the reward or material benefit we will receive, but simply vetzinvanu, that G-d commanded us. This is more than adequate justification for the fulfillment of the Mitzvot. By performing Hashem’s Mitzvot man creates a bond with Hashem. It connects a finite man to our infinite G-d and a living relationship between man and G-d. Therefore the reward of the Mitzvah is the Mitzvah itself i.e. man’s opportunity to directly relate and connect to Hashem. Q. The Parasha opens, ‘And G-d spoke to Moses on Mount Sinai saying…’ and then continues to describes the laws of the Sabbatical year. Why does the Torah associate the Sabbatical year with Mount Sinai? The Sabbatical year is only observed in the land of Israel so what connection could it have to the Sinai experience? A.The Sabbatical year is proof the Hashem gave the Jewish people the Torah at Mount Sinai. When the Torah relates the laws of the Sabbatical year, it guarantees that although the land may not be worked in the seventh year, the crop of the sixth year will be blessed so that it will produce enough for the sixth, seventh and eighth years. As this guarantee clearly defies the laws of nature it is only possible that Hashem, the Creator of the world, can promise something that transcends nature. Such a guarantee could only be given by Hashem. Therefore the Torah’s inclusion of the laws of the Sabbatical year proves that the entire Torah was given by Hashem on Mount Sinai. On a deeper level, the fact that the Torah makes this association teaches us not only about the Sabbatical year, but about all the Mitzvot. Associating the Mitzvot with Mount Sinai means that every individual Mitzvah a Jew performs, whether it being putting on Tefillin, lighting Shabbat candles or eating Kosher food, is more than an isolated good deed. It is an extension of the revelation at Mount Sinai. 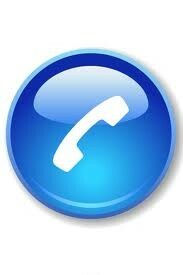 On Mount Sinai every Jew had direct contact with Hashem. Every Jew heard Hashem talking and every Jew felt His presence. When we perform a Mitzvah we may not experience the thunder and lighting that occurred at Mount Sinai, but the fundamental dimension of what happened there, the establishment of a bond with G-d’s essence, continues to prevail. It is important to realize that the Sabbatical year and all the other Mitzvot are not isolated details, but rather integral elements of a larger whole. Each Mitzvah we perform brings us closer to Hashem, creates a closer connection with Hashem and draws His holiness into the material world in which we live. Q. We are currently counting Sefirat Haomer, the period which connects the festivals of Pesach and Shavuot. These 49 days were counted by the Jewish people as they prepared for, and eagerly anticipated, the receiving of the Torah. If G-d chose the Jewish people to be His Holy nation, then why did the Jewish people need preparation for the receiving of the Torah? A. Prior to their departure from Egypt, the Jewish people were in a state of slavery in its lowest form. The Jewish people were slaves in the land which the Torah calls ‘the abomination of this earth’. They were in no state to receive Hashem’s most precious gift, the Torah. Yet, in the course of fifty days the Jewish people rose to the sublimest heights of spirituality. They were worthy of the revelation of G-d Himself at Mount Sinai. The spiritual freedom which the Torah brought the Jews was linked with material freedom. That is, freedom from any material problems. Their material needs were provided for in a miraculous way. 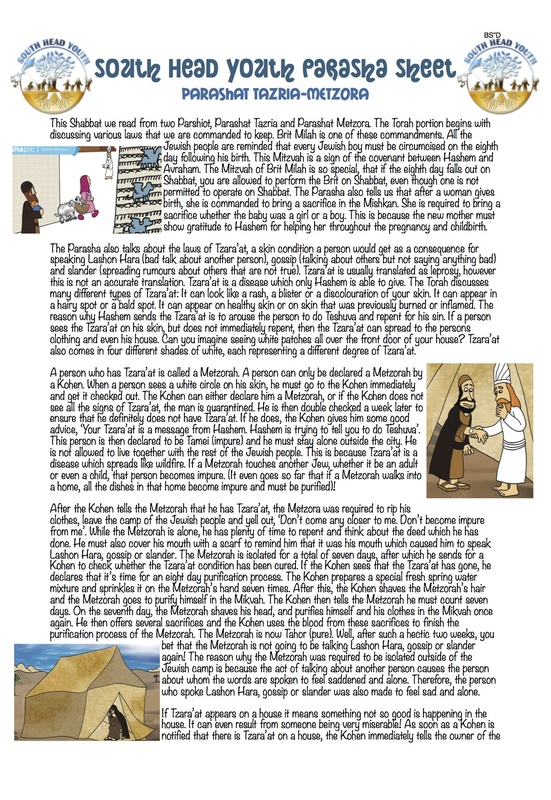 The Jewish people received food daily in the form of Manna which fell from the heavens; the Well of Miriam went with them wherever they travelled and constantly provided water; a Pillar of Fire led them and killed the poisonous snakes and scorpions in the desert; while a Pillar of Cloud surrounded them and kept their clothes clean and neat. While the Jewish people managed to ascend from a very low level to a high level of spirituality in a matter of only 50 days, Jewish people today spend years of study and prayer to achieve even a small betterment in their personality; a small spiritual elevation. It was only possible because of the conditions in which they existed that the Jewish people leaving Egypt were able to ascend to such a high spiritual level in such a short time. The Jewish people left Egypt with complete faith in G-d. They left behind the life they had in Egypt and entered the desert without provisions. They were totally reliant on G-d. If these conditions were duplicated today, we too could expect a most radical change, not only over a period of years, but in the course of days. Pesach is the first Jewish festival. Pesach celebrates the birth of our nation, when we were delivered from slavery under Pharaoh to become servants of G-d.
Q: In the Exodus from Egypt G-d performed many miracles for the Jewish people. What was it about our ancestors that made them worthy of these miracles which brought them triumph over their oppressors? A: Throughout their hardships, the Jewish people in Egypt remained attached to Hashem. They did not forget their ancestral heritage. They did not assimilate with the Egyptians, but continued to speak the Hebrew language, name their children with Jewish names and follow the Jewish dress code. The Jewish parents and children believed and trusted in the G-d of their forefathers. The first Pesach our ancestors celebrated in Egypt was the beginning of a new era. We should take note that every year when we celebrate Pesach it is also like a new era, to reaffirm our faith in Hashem. Every Jew, every year, experiences freedom on the festival of Pesach. As the sages say, "In every generation, and every day, a Jew must see himself as though he had that day been liberated from Egypt". The meaning of ‘liberation from Egypt’ refers to the freedom from the obstacles and limitations which the Jew encounters on his way to self-fulfillment, hindering him from reaching his destiny and from accomplishing what he must. Every Jew possesses a Neshama, a part of Hashem within him. Each day the Neshama strives to rise higher to become closer to Hashem. In doing so it is required to break free from these confining chains in order to rise higher. As the liberation of the Jewish people drew near, the Jewish people received a new command from Hashem: ‘take unto yourselves a lamb and prepare the passover sacrifice’. The lamb was worhsipped by the Egyptians as a god, and the significance of this command was to withdraw from idolatry and cleave to the Mitzvot. As a prerequisite to this Mitzvah every Jewish male was required to be circumsized, showing that his ‘eternal covenant’ with Hashem was not merely in his soul, but also in his very flesh. Upon hearing this command, the Jewish men underwent circumcision. By merit of this Mitzvah and the blood of the Korban Pesach (which they were commanded to put onto their doorposts), the Jewish people were saved from the ‘destroyer’ - plague of the Killing of the Firstborn, when the Angel of Death passed over the homes of the Israelites. Click here for more. Welcome to this week's Parasha Sheet - Tazria. 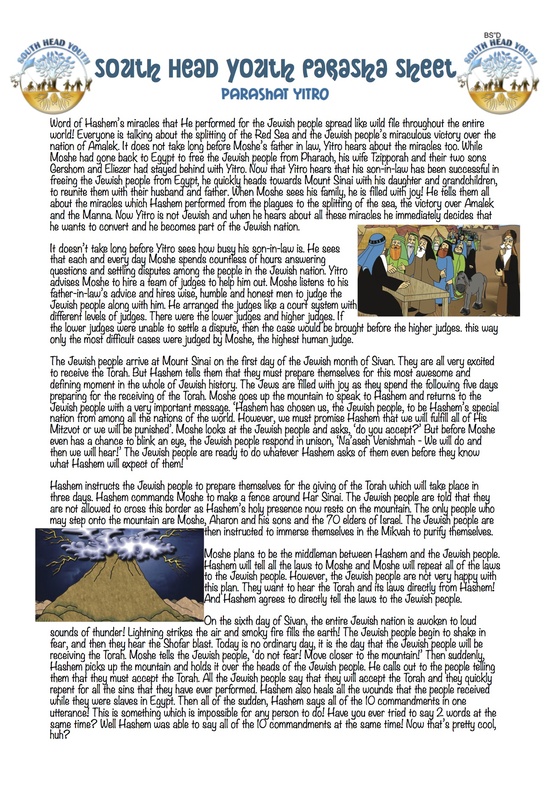 As Pesach is approaching, it is appropriate to review the Haggadah. Q: When speaking of the four sons the Haggadah reads, 'The Torah spoke of four sons, one wise, one wicked, one simple and one who does not even know how to ask a question'. This sequence in which the four sons are listed is quite puzzling. Seemingly the sons should have been listed according to their esteem or the order which is implied in the Torah (wicked son, simple son, son who does not even know how to ask a question, wise son). What is the reason that the Torah elevates the wicked son and places him next to the wise son? A: The Rabbis tell us that even though a Jew may sin he is still a 'Yisrael'. Yisrael does not simply mean Jew. It is an accronym for 'Yesh Shishim Ribooy Oysis LaTorah' which means, 'there are six hundred thousand letters in the Torah'. At Mount Sinai, six hundred thousand Jews were present at the revelation of the Torah and thus each individual Jew is considered as representing one letter of the Torah. In regards to the Torah, if even one single letter is missing or impaired the Torah is considered incomplete and cannot be used for the Torah reading in the Shule until it is repaired. Similarly, if a single Jew is missing from the Jewish nation, the Jewish people are considered incomplete until that individual returns to the Jewish traditions. The sanctity of the entire Jewish people depends upon each individual Jew. Even the 'wicked' or 'rebellious' son represents a letter of the Torah and is essential to its sanctity. 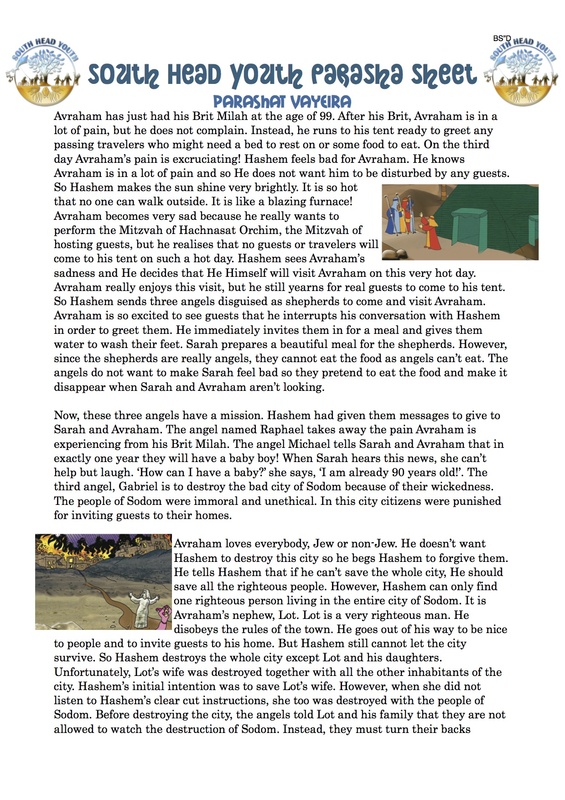 The wicked son is placed next to the wise son in the Haggadah to emphasize our responsibilities to every individual. We have a duty to improve the 'wicked' son's character and to expose his Jewish core. Our responsibility to the rebellious sons of our people is no less than our duty towards our simple sons, ignorant sons or wise sons. In order to elevate our nation we must start with the lowest levels of our people so we can elevate the entire nation. The Jewish core in every individual is indestructible! It is significant to note that when speaking about the four sons the Haggadah repeats the word one in every case (one wise, one wicked, one simple, one who does not know how to ask). This teaches us that in every son of our people, be he wise or wicked, there is a portion of the ONE Hashem, the spark of G-dliness. that the ultimate purpose of creation is to serve Hashem, is this not a vain attitude on the part of our Creator? If we are to give to G-d and serve G-d, then are we not like robots? A: It is against the Jewish religion to believe that all our actions and deeds are governed from above. Man, unlike other creations, has free choice. It would be silly to give man commandments to fulfill and then take away his ability to do them. If all was governed from above then man, indeed, would be like a robot, but G-d has given us the ability to choose; an ability no robot has. Man has the ability to perform Mitzvot with Divine inspiration and the ability to perform Mitzvot because he wants to perform them in order to become closer to Hashem. When Hashem asks us to perform Mitzvot, He is trying to get us to do Mitzvot for our own welfare. For example, Hashem comes to the farmer and tells him, ‘if you fulfill My commandments I will give you rain for your fields’. Of course, the farmer immediately begins to observe Hashem’s Torah and Mitzvot in order that his crop will grow. As he matures, the farmer begins to realize that these Mitzvot he is fulfilling are actually for his own benefit and wellbeing. It is the vehicle by which he is rising to higher levels and creating a greater connection with Hashem. It is the responsibility of a Jew to ascend from level to level and strive to be close to Hashem. Q: The period in which Purim occurred was one of the happiest eras in the history of the entire diaspora. The Jewish people had achieved a significant role in the government. Mordechai was an official of the government and Esther was the wife of King Achashverosh. Yet it was during this period when the Jewish people felt so secure that the harshest decree ever proclaimed against the Jews occurred, ‘to destroy, slay and annihilate all the Jews from the youth to the aged; infants and children all in one day’. How could such a decree be declared against the Jews in an era where they felt so secure? A: The holiday of Purim is a clear indication that Jews and the natural course of events are two distinct realms. Divine Providence, in relation to Jews, is not subject to the laws of nature. Rather, the fate of the Jewish people is totally dependent on their observance of Hashem’s Torah and Mitzvot. Therefore, it is illogical to anticipate the evil decree in the normal order of things - it was a consequence of their special fate that this terrible decree against the Jews was made. Just like the decree was an unnatural occurrence, so was the redemption. The Jews' salvation came about through their repentance and total commitment to Hashem. In the entire year that the decree was pending the Jews remained steadfast in their belief and faith in Hashem. 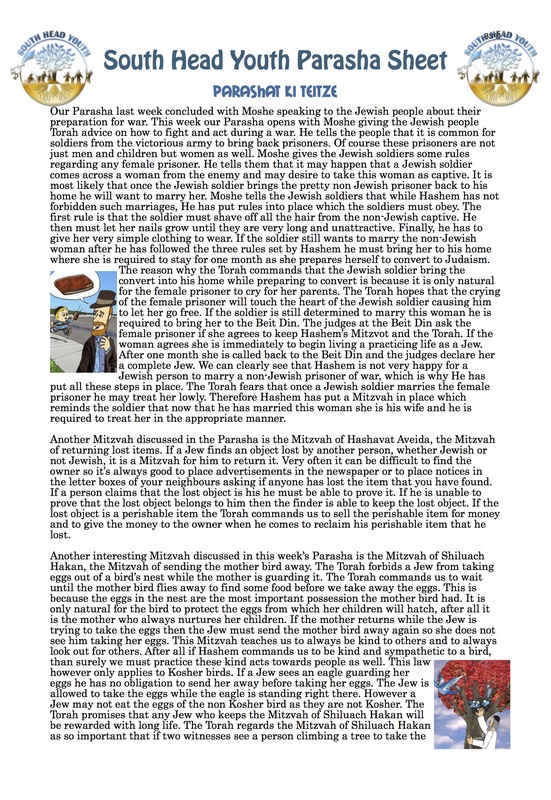 In this time, even though both Mordechai and Esther had high roles in Persia, they did not proceed with a diplomatic mission to sway Achashverosh, but rather Esther asked Mordechai to ‘go and gather all the Jews who are present in Shushan, and fast for me, and neither eat or drink for three days, night and day’. Q: When we look at the word ‘Vayikra’, the very first word in Parashat Vayikra, we can see that the last letter of the word, the Alef, is unusually small and not the same size as the rest of the letters in the word Vayikra. Why is this so? A: Moshe knew that he was a special person. He was the leader of the Jewish people. He was the only person who was able to speak to Hashem ‘face to face’. Yet Moshe felt very humble. In fact, he felt more humble than any other person. Moshe remained humble in his own eyes, in the presence of Hashem and in the presence of the Jewish people. Moshe would say, ‘Hashem has given me a special gift. If Hashem had given these gifts to another person than he would be a much better leader than me’. As you can see Moshe considered himself to be smaller and less important than others. This is why the Alef in the word Vayikra is small. The word Vayikra means and He called. In this instance Hashem is calling Moshe, the leader of the Jewish people, to tell him to command the Jewish people to bring Korbanot to Hashem. Hashem’s calling to Moshe was a sign of love and affection. Hashem loves all of His children, especially the humble. It was because Moshe was so humble that Hashem called to him and showed him special love and affection. It is also interesting to note that Alef is the first of the twenty-one letters in the Alef Bet and is therefore the ‘head’ or the ‘leader’ of all the other letters. So a small Alef which represents leadership and greatness is clearly a contradiction. What we learn from here is that a person’s humility (represented by smallness) should be proportionate to his greatness (represented by the Alef). A person's unique talents should lead him to feel humble so that when he contemplates someone else being given the same talents and abilities as himself, that other person would surely have surpassed his own achievements. We should all take a lesson from the Alef and from Moshe. We all need to act humbly. We should not allow our unique talents and qualities to suspend our feelings of humility, but we should allow them to make us feel even more humble. Q: In giving the Half - Shekel donation the Torah explicitly states, ‘the rich shall not give more, and the poor shall not give less’. Why was it so important that every Jew took part in the giving of the half a shekel equally? A: A half-shekel coin is an insufficient sum of money to pay for even one sacrifice and it certainly does not cover the sacrifices offered every day of the year. Yet, by contributing this amount, even though it was a very small amount, every Jew became a full partner in every one of the congregational sacrifices offered throughout the year. Therefore, in order to become a partner and obtain his share in the congregational sacrifices, a Jew had to join in with other Jews. One Jew’s half-shekel coin alone would not suffice to purchase even one sacrifice. The half-shekel coin therefore emphasizes the importance of the commandment, ‘Love your fellow as yourself’, for a Jew himself is only a half and is incomplete. He only becomes whole when united with another Jew. And this was also the only way the congregational sacrifice could be offered - it was offered by the entire nation as one entity, not as a grouping of individuals. Q: "In six days the work shall get done", says the second verse of Parashat Vayakel. In describing the Mitzvah of Shabbat, would it not have made more sense for the Torah to say, "In six days you shall do work”? Hashem wants us to work for a living. We work at our jobs in order to earn money to purchase the things we need to live and to serve Hashem. But Hashem wants us to remember that it is really He who blesses us with all of our needs. He sends us His blessings through our jobs. Some people may think that they themselves are the ones who earned their jobs, but this is not so. We need to realize that the money we have comes from circumstances controlled by Hashem, and He can change them at any time! Through the words ‘In six days the work shall get done’ the Torah is teaching us that we need to do whatever we can to make sure the week's work is accomplished during that week, knowing all the while that in this way Hashem’s blessings will come. Getting it done is totally different from putting yourself totally into the work. When a Jew comes to Shabbat knowing that Hashem is the One who provided for him during the week, he keeps Shabbat in an entirely different manner. He feels that all of his weekday work has been accomplished and so he does not think about his work on Shabbat. When one thinks this way, then even during the week he will do all he can to serve Hashem by even bringing holiness into the workplace e.g. encouraging a Jewish co-worker to light Shabbat candles, put on Tefillin or place a Mezuzah on the office door. It is through these acts and through constantly thinking about Hashem and the importance of the Shabbat that we can bring Hashem’s holiness into the world through our jobs. Q. 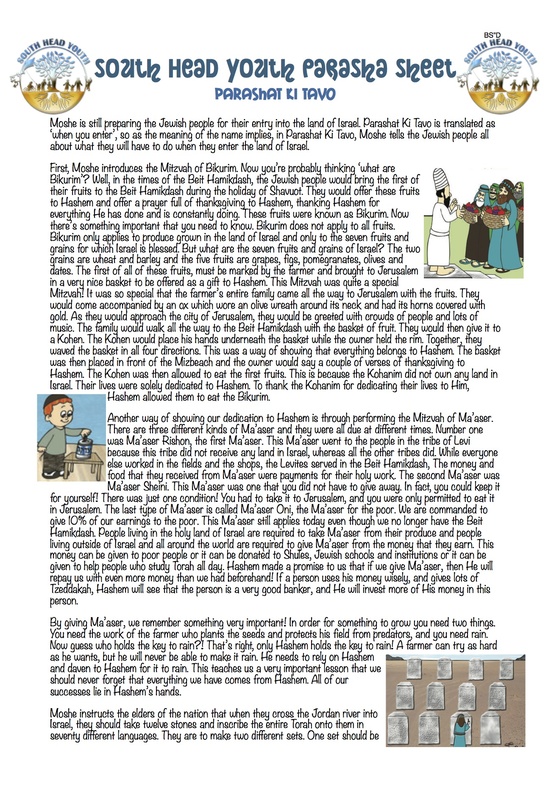 Our Parasha this week speaks about Moshe’s brother Aharon. The Great Torah commentators say about Aharon and his students, "..be like the students of Aharon - loving peace and pursuing peace, loving your fellow creatures, and drawing them close to the Torah." What can we learn from this? A. Two lessons are contained in this statement. First, the use of the unusual word ‘creatures’ rather than ‘people’ implies that we are to positively approach and love all people, even those corrupted by negative influences. Aharon treated all men with love, including those of questionable character for the simple reason that we are all Hashem’s creations. Although Aharon was the High Priest, he did not consider it beneath him to reach out to a fellow Jew, a mere ‘creature’ and bring him close to Torah. The second lesson concerns the way in which we are to approach others. Each of us has an obligation to bring our fellow Jews closer to a complete, perfect and uncompromised Torah. In doing so however, we need to be aware of being drawn away from the staunchness of our own position in Judaism. In approaching others, we also need to ensure that we do not compromise the Torah and Mitzvot. Of course if someone is ‘drowning’ we must come to his aid, yet we must also be careful that in the process of rescuing him, we do not ‘drown' ourselves. You should not allow your love for you fellow ‘creatures’ to cause you to manipulate the Torah to suit their needs. We need to bring them close to Torah, not bring the Torah close to them! Don’t water down the Torah to their level, but present the Torah in its pure form without compromise. ​The above lesson is based on the teachings of the Lubavitcher Rebbe. Q. Parashat Tetzaveh is the only Parasha where the name of Moshe is not mentioned from the moment he was born until his passing. The Parasha opens with the words V’Atah Tetzaveh - and you shall command. 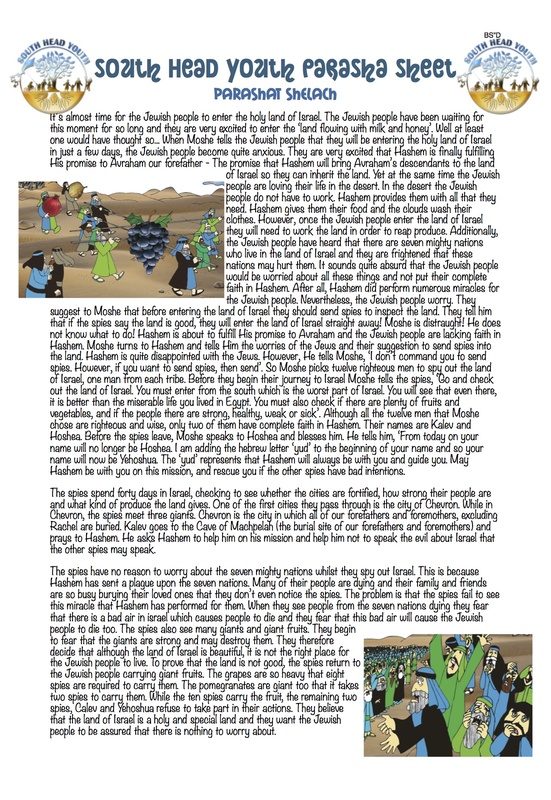 (The you is referring to Moshe and Hashem is telling Moshe to instruct the Jewish people). Why is this so? A. A simple explanation is when the Jewish people sinned with the Golden Calf, Hashem was ready to wipe out the Jewish nation and begin a new nation from Moshe. Moshe defended the Jewish people and begged Hashem to forgive the nation. Moshe was so strong in his defence of the Jewish people that he himself told Hashem that if He was not willing to forgive the Jewish people, then He should erase his name from the Torah. The words of all righteous men are eternal and leave an impression and so therefore, the effect of Moshe’s words had to be somewhere in the Torah, seemingly in this week’s Parasha. Parashat Tetzaveh usually coincides with the date of Moshe’s passing , Adar 7 and so in the week that we remember Moshe’s passing, his name is erased from the Torah. The Chassidic commentaries however, explain the absence of Moshe’s name on a deeper level. They explain that a name is merely a vehicle for other people to attract a person’s attention or identify the person. A name is secondary to the essence of an individual. The essence of every individual is beyond his name. The Chassidic commentaries further explain that Moshe's most glorious moment on earth was when he, as a leader, stood up for his nation, when he put his name on the line and told Hashem that if He did not forgive the Jewish people then he did not want his name to be written in the Torah. Moshe was a true leader. He was not interested in power, but rather he was prepared to sacrifice himself for his people. And this is why his name is absent from the Parasha! Rather than saying Moshe’s name, Hashem says You, speaking to Moshe in the second person. The you represents something deeper than a name. The you represents the self-sacrifice that Moshe was prepared to make for the Jewish people. His commitment to his people. Please share our Parasha sheet around your Shabbat table and let your family and friends explore the Parasha of the week together with you. Q. 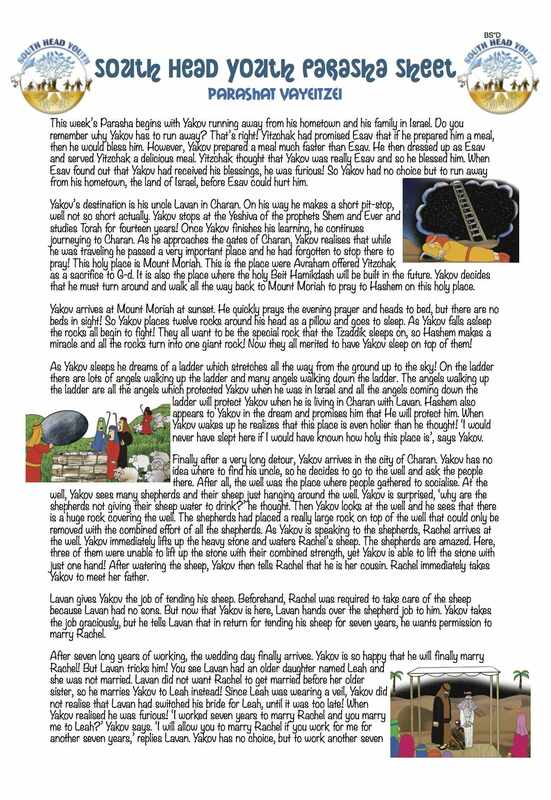 In this week’s Parasha we read about the building of the Mishkan and all the different materials that were used to make it. However, the Beit Hamikdash was built only from stone. Why is that? A. 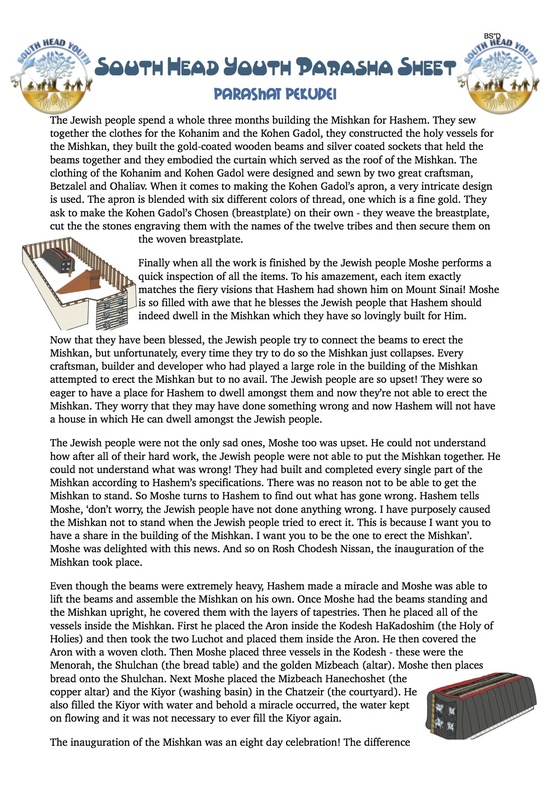 The Mishkan was meant as a temporary dwelling place for Hashem. The roof was made from animal hides and the walls from cedar wood. Even the mirrors that women used to beautify themselves with were used for the building of the Mishkan. The Mishkan was made from items that encompassed everything to do with human life. By using elements which make up the world, Hashem’s holiness comes down and is revealed in this world. While the Mishkan stood, the place on which it stood was considered holy. Once the Mishkan was packed up and removed, the place was no longer considered to be holy. This is because the Mishkan was not meant to be a permanent dwelling because the holiness of the Mishkan was revealed from above, and did not come about as a result of the Jews’ service to Hashem. In contrast, the Beit Hamikdash was a permanent structure. Even though the the actual Beit Hamikdash is no longer standing, the ground on which it stood is still holy. In the Beit Hamikdash, Hashem’s presence was revealed in a way that made the mountain itself holy. Once that holiness was revealed it would never depart. (This is the reason why many Jews do not climb the Temple Mount. Nowadays, we are considered to be Tameh, and we cannot step on the holy ground of the Beit Hamikdash until we purify ourselves with the ashes of the Parah Adumah, the Red Heifer). This is the reason why different materials were used when building the Mishkan and Beit Hamikdash. 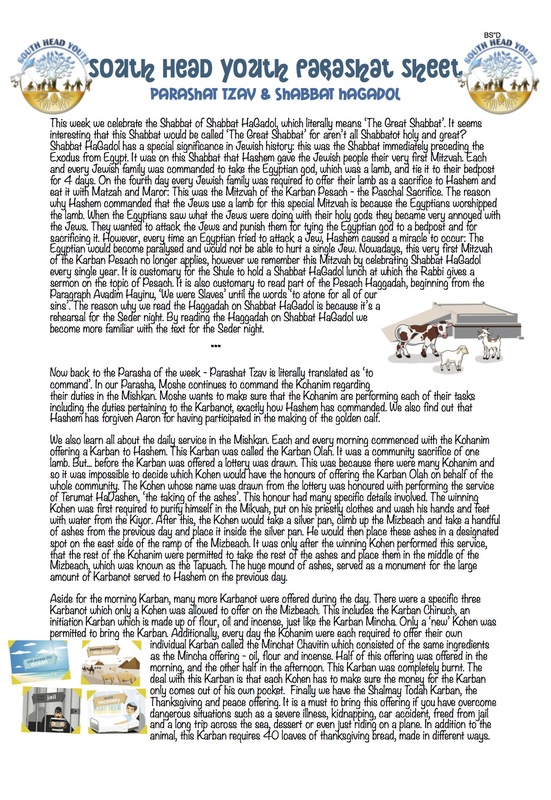 The Mishkan teaches us how Hashem brings His holiness down into this world. 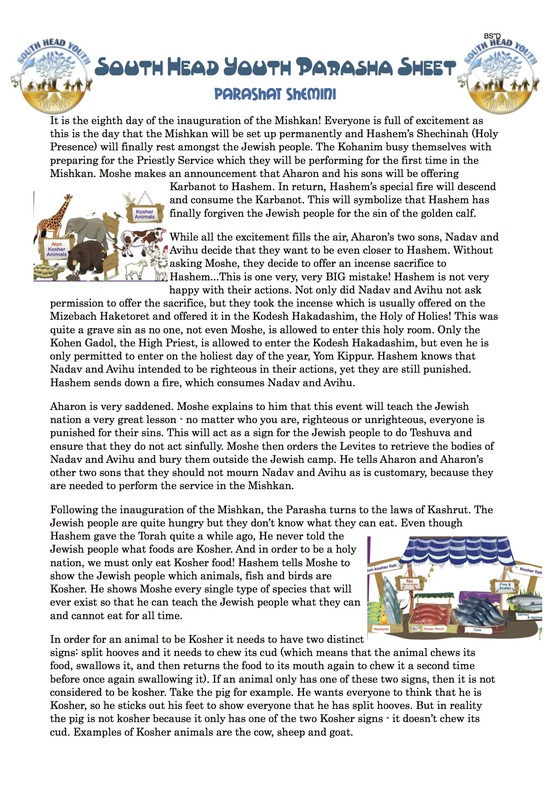 The roof of the Mishkan was made from animal hides, the walls from wood, and the sockets from metal, teaching us how Hashem’s holiness comes down, first to the level of animals, then lower to the level of plants, and finally to the lowest level, to things which have no life. The Beit Hamikdash, however, shows us the power of man’s G-dly service. Man is able to take a stone, an inanimate object, an object with no life at all, and make it part of Hashem’s dwelling. The entire Beit Hamikdash was made of stone, because its holiness did not come from above, but was brought about through man’s G-dly service. This teaches us that man has the power to take any object and make it holy by using it to do good deeds. Q. When speaking about the passing of our forefather Yakov, the Torah does not state that 'he died'. The Rabbis have declared that Yakov did not die, 'just as his children are alive, so is he alive'. What can this possibly mean? A. It is the spirit of man which forms the basis of love between two friends; a husband and wife and between family members. Although these feelings are expressed through our physical body, they are the characteristics of our spirit, of our soul, that are the true essence of man. Our limbs merely act as tools designed to help communicate the thoughts and feelings of our soul to others. A bullet or sickness can damage the physical body, but they cannot hurt or affect the soul. They can also cause death, but death is only a separation between the body and soul. After death, the soul continues to live. It continues to have a connection with the family, particularly those who were especially dear. It shares in the distress of the family and rejoices at every joyous event of the family. It derives pleasure from seeing the members of his family recover from the tragedy and make every effort to continue on with their lives, acting as an inspiration and with encouragement to others. Although the living members of the family cannot physically see the departed, for the physical connection has been broken, the soul of the departed family member is still there together with the family, watching them and caring for them from above. The soul, the Neshama particularly derives satisfaction from seeing his children, grandchildren and all of his descendants being educated in a Torah way and through their performance of good deeds. Q. 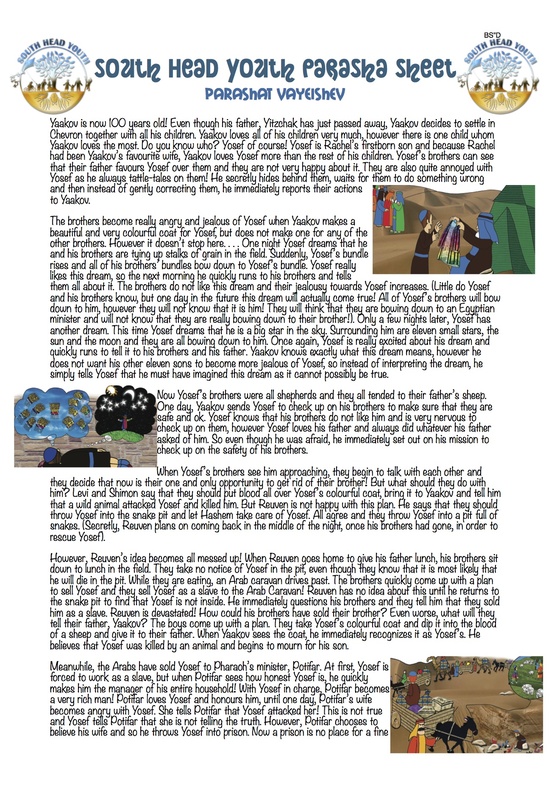 When Yakov and his family descended to Egypt, Yakov sent Yehudah ahead of the rest of the family. Why did he do this? A. Yakov sent Yehudah ahead of him and the family to establish a Yeshiva in Egypt. Yakov knew that upon entering the land of Egypt and exposing the younger generations to a hostile culture and a new environment, the very first essential, necessary to Jewish survival, was to establish an educational facility, an institution of learning for his children and grandchildren. Yakov's emphasis on Torah education carries an important message for our own day and age. Educating our children is vital and its importance cannot be overemphasized. In fact, educating our children is a Torah Commandment which is repeated twice in the Shema prayer which we recite daily, morning and evening. The education of children should not fall squarely upon the schools, or only upon the parents of the children. Rather, the education of children must be a joint effort of both, the school and the Jewish home. In today's day and age where we are unfortunately exposed to negative influences, it is even more important to stress the importance of Judaism to our children and ensure that they are educated in a Torah way. Maimonidies explains, 'Every Jew desires to be a Jew; and to do all the Mitzvot, and to keep far away from sin. However, sometimes the Yetzer Hara (evil inclination) prevails over his better judgement and prevents him from doing what he has to do in accordance with the Torah'. This teaches us that, essentially, every single Jew has a desire to perform all the Mitzvot of Hashem. However, sometimes the Yetzer Hara may convince a Jew to do something which he should not necessarily be doing. By educating our children in the Torah way and by educating our children to do Mitzvot, we are not creating a new desire within them to perform Mitzvot, but rather we are releasing them from the compulsion which had paralyzed their desire and hence enabling the child to express their true self. A. Chanukah celebrates two miracles. Firstly, the Maccabee's victory over the mighty Greek army. The Maccabees demonstrated that they would not allow anyone to dictate their relationship with Hashem. They were prepared to give up everything and anything in order to serve Hashem. The Maccabees had great Mesirat Nefesh (self sacrifice) and were willing to even give up their own lives for the sake of preserving their Judaism. The second miracle was the discovery of the flask of pure oil and its ability to burn for eight consecutive days. The core dynamics of this holiday have been repeated throughout Jewish history such as in the story of Purim, the Spanish Inquisition and the Holocaust. In all of these times, at great personal risk, the Jews succeeded in maintaining their beliefs against the attempts of others to forcibly change them. A. Even while Yosef was in the most miserable of places, he was able to focus on others rather than on himself because he realised that everything that happens comes from G-d. Yosef realised that everything that occurs is Divine Providence. Even though he was suffering in the prison cell and even though he yearned to be reunited with his family he realised that Hashem had caused him to be imprisoned for a reason. Yosef knew that while he did not currently know the purpose of his imprisonment, and even though his present imprisonment did not seem to be such a good thing, ultimately his imprisonment was for the good. This is what enabled him to offer the chief butler and chief baker hope even when he was in the most miserable of places. It was his faith in Hashem that allowed him to put his own problems aside and focus on others and help them in their distress. Very often we get caught up with ourselves and our problems. Our problems, whether real or imaginary are sometimes blown out of proportion and often take over our lives. However, we should not allow this to happen. We should be like Yosef. We should realise that everything that happens is Divine Providence and is ultimately for the good, even if we cannot see the revealed good. Having this faith in G-d is what will allow us to move further and help others rather than focus on our own small problems. Having faith in G-d and believing that everything happens for the good will bring true happiness to yourself which you in turn will be able to share with others. A. When Hashem created the world and when Hashem gave us the 613 Mitzvot to perform, He gave us the ability to perform the Mitzvot under all circumstances. Hashem also gave us the ability to overcome obstacles such as the challenge of working on Shabbat. Every Jew has the full capacity to be able to perform the will of Hashem. However, every person has free choice. It is therefore a matter of will and determination on the part of each Jew whether he will perform the commandments Hashem has given us. Living a Torah way of life is the only true way of life for a Jew and the only way for a Jew to be truly happy, materially and spiritually. Q. Our Parasha this week begins by telling us that Yakov left the land of Be'er Sheva for the land of Charan. This statement is seemingly redundant as it was just at the end of last week's Parasha that the Torah told us that Yakov fled the city of Be'er Sheva for Charan (He fled from his brother Esav who wanted to kill him). However, we know that everything written in the Torah is written for a purpose, so what could the reiteration of this statement possibly mean? A. Yakov was the first of the forefathers whose children all followed the ways of Hashem. In order to accomplish this, Yakov needed to leave the comfort of Be'er Sheva and overcome the struggles that were found in Charan. Particularly, through entering a situation that would endanger his ability to serve Hashem and persevering in that type of environment, Yakov was able to build his family and the foundation for the future of the Jewish nation. Yakov knew of all of these dangers that awaited him in Charan and so he made a pit stop at the Yeshiva of Shem and Ever for fourteen years before carrying on to Charan. Before arriving in Charan Yakov also went out of his way to pray to Hashem. He knew that he was about to build his own home and he knew that before doing so it was necessary for him to strengthen his relationship with Hashem and the way to do this was through prayer. This is an important lesson for us, living in the twenty-first century. When a Jew is beginning to build a home he may think that although up until this point he dedicated his whole life to Torah study, now he can put his Torah study aside and spend his time working in order that he can 'make it' in the 'big' world. This is why the Torah stresses that Yakov left Be'er Sheva for Charan and he spent time davenning to Hashem before going to Charan. There are many obstacles that distract our observance of Hashem's Torah and make serving Hashem quite difficult. But, like Yakov we need to overcome these struggles and distractions. 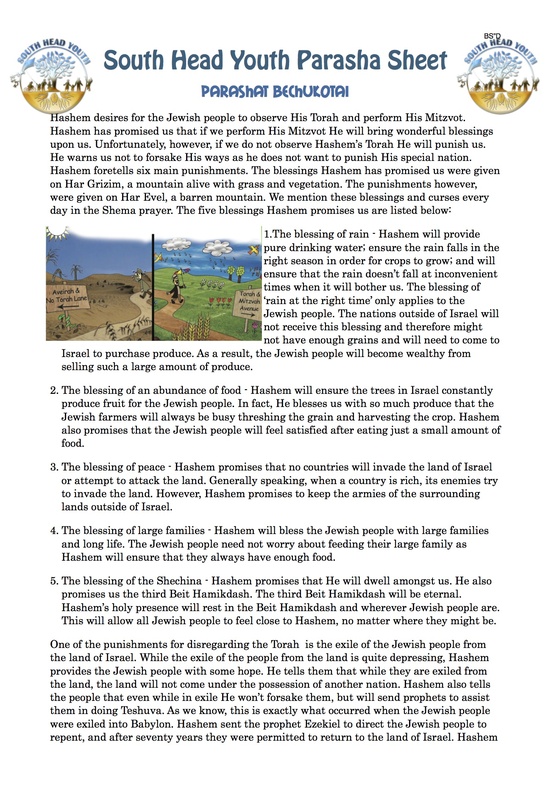 It is only through overcoming these that we are able to build a stronger connection with Hashem. This in turn produces a stronger Jewish home filled with light and warmth. Before starting to build a home it is important to strengthen both our relationship with and commitment to Hashem as this will provide the strength needed to overcome the obstacles and struggles you may face. And these obstacles will be far greater than anything experienced beforehand so it is very important to first strengthen our connection and relationship with Hashem. Q. Our Parasha this week tells us of the many wells that Yitzchak dug. Why does the Torah find it important to tells us about the wells Yitzchak dug? What is their significance? What can it mean to us today? A. Yitzchak's digging of wells during his life is not only to be understood in the physical sense, but also in the spiritual sense. Digging a well involves removing the many layers of the earth. One is required to penetrate beneath the external, earthy surface until the source of life-giving water in that place is uncovered. In every single being there is such a fountain. This idea is represented in the body of a Jewish person and the G-dly soul, the Neshama hidden deep within the body. Each and every single Jew has a Neshama inside of him. The Neshama is an actual part of G-d. It is our job to look deep down into our own Neshama and the Neshamot of every single Jew and to discover the good which is there. Every Jewish Neshama is good because it is a part of Hashem. Even if G-d forbid, a Jew has strayed from the path of Torah and does not do good deeds, the goodness of his Neshama is still there. The Jew will still be able to penetrate the goodness of his Neshama. Nothing can stand in the way of his Neshama. Yitzchak knew this and this is why he wanted to give the birthright blessings to Esav. Yitzchak was a righteous man and a great Torah sage. He knew that Esav did not devote his time to Torah study. But Yitzchak was 'digging wells'. He was able to find water where others couldn't i.e. he was focused on G-dliness and he could discover the G-dly soul, the Neshama in every being. As Esav's father, he was trying to penetrate Esav's Neshama, to bring out the goodness within him. He was trying to help Esav fulfill his spiritual potential. 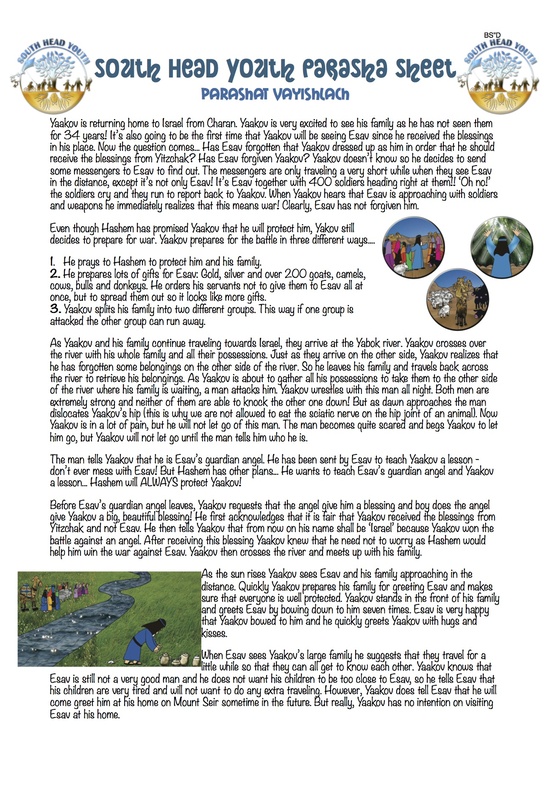 Yitzchak was hoping that the blessings would help to bring out the goodness in Esav's Neshama which would ultimately lead him to do good deeds. Q. Some of my friends do their best to discourage me from observing the Mitzvot in the Torah. It is becoming a difficult situation for me. There are times when I become very discouraged. What can I do about it? A. Jewish people observe the Torah and perform the Mitzvot in the Torah simply because Hashem commanded us to. We should not seek approval from our friends or family when it comes to our own observance of the Torah. Rather when difficult situations arise, it is necessary to look at them as challenges and a test of one's devotion to the Torah and Mitzvot. Instead of being discouraged, you should do your utmost best to encourage those who put you in a difficult situation to perform Hashem's Torah and Mitzvot, and to teach them that each Mitzvah we perform will lead us to perform many more Mitzvot, which in turn will bring lots of spiritual light into the world. Each of our foremothers grew up in homes of idol worship and trickery. Yet each of them, of their own accord left their homes of idol worship for a life devoted to Hashem. They did not blindly follow the beliefs of their families, but stood up for what they each believed in. They did not allow the negative influences of their parents' homes to influence them. Each one had a moral compass within them that helped them keep their values intact. Likewise, each of us has a moral compass inside of us, which tells us if something is wrong when our values are tested. Like our foremothers, we should not be discouraged by the negative influences around us. We should not be discouraged by family or friends who might try to persuade us against our observance of the Torah. Rather we need to accept this as a challenge and allow it to make us feel stronger in our beliefs. Q. What makes a Jew, a Jew? A. The Jewish people became Hashem's special nation through Hashem's covenant with Avraham. However, the Jewish people have never been a 'nation' in the regular sense of the word. Other nations share a special land, but the Jewish people are dispersed all over the world and throughout the Diaspora, living in diverse conditions and speaking different languages. Yet, they are all Jews. Although certain Jewish characteristics unite Jewish people i.e. observance of the 613 Torah commandments, a Jew who does not observe the Mitzvot is still a Jew! A person who is born Jewish is a Jew! A person's Jewish identity is so strong that a Jew can never renounce it. Hashem's covenant with the Jewish nation is much deeper than a friendly relationship with His people. It is not like the relationship that two friends have with one another, which is subject to change based on certain conditions. Hashem's love and covenant with our forefather Avraham was an essential love of a father and son - a love which is not evoked within the father as a result of his son's qualities, but because he sees his son as part of his own self. This type of love cannot lessen with the changing of circumstances. Hashem's love for the Jewish people is not dependent on whether an individual Jew is deserving or not, it is dependent on the fatherly love that Hashem has for each and every single Jew. The love that Hashem has for every Jew is so strong, that a Jew himself cannot hide his attachment to his people. Jewish identity is a matter of fact and not a matter of opinion! Welcome to this week's Parasha Sheet - Lech Lecha. Q. In Jewish tradition who has the naming right, the father or the mother? 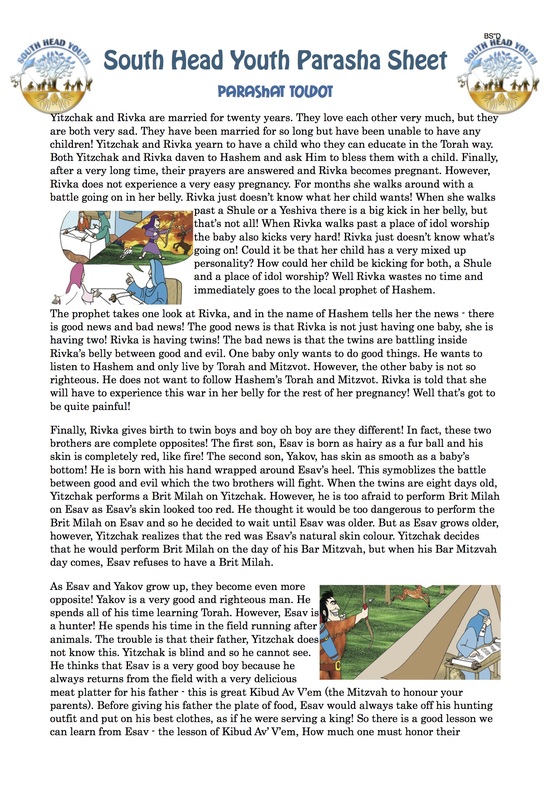 In this week's Parasha we read that Avram named his son Ishmael. Later on in the Torah however, we find that Rachel and Leah named all of the twelve tribes, except for Binyamin. So who has the naming rights? A. Kabblah explains that the name given to a child at birth is very important as one's life-force and the blessings one receives are channeled through one's Hebrew name. Therefore when a child is born, the parents experience a minor prophecy and Hashem puts into the mouth of the parents a name that is essential for that particular soul. This name becomes the Jewish identity of the child. It is what connects the child to his/her Neshama and to the entire Jewish nation. The sages tell us that Hashem endowed our foremothers with a greater measure of prophetic vision than their husbands. This is why Leah and Rachel were the ones to name their children. The custom of naming rights that is most commonly followed is that the father has the naming rights to the first child, the mother chooses the name of the second child, and then they continue to alternate. 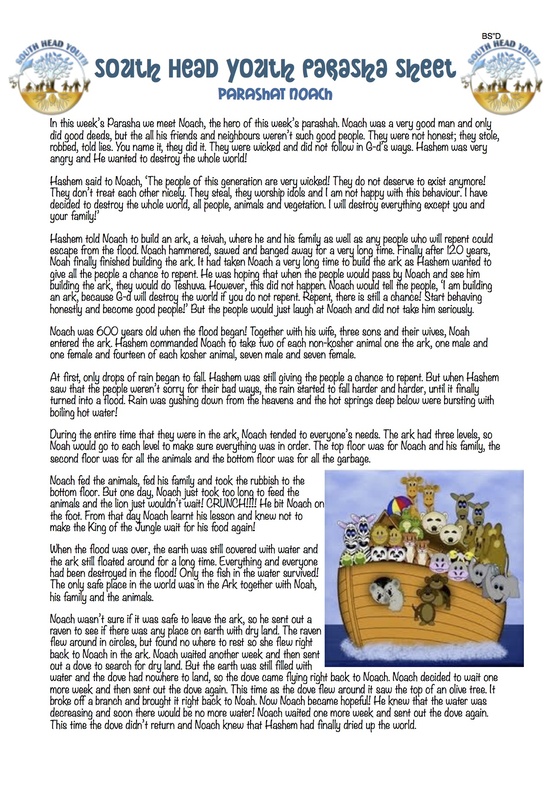 * Hashem tells Noach to that He is going to destroy the world. * Noach is told to build an ark. * The flood destroys the entire world. 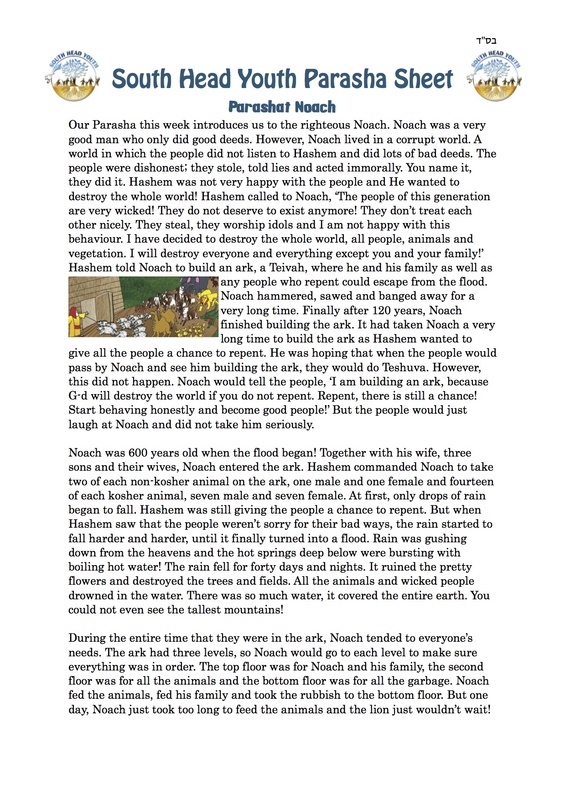 * Noach has to rebuild the world from scratch. * Avraham is thrown into a fiery furnace. 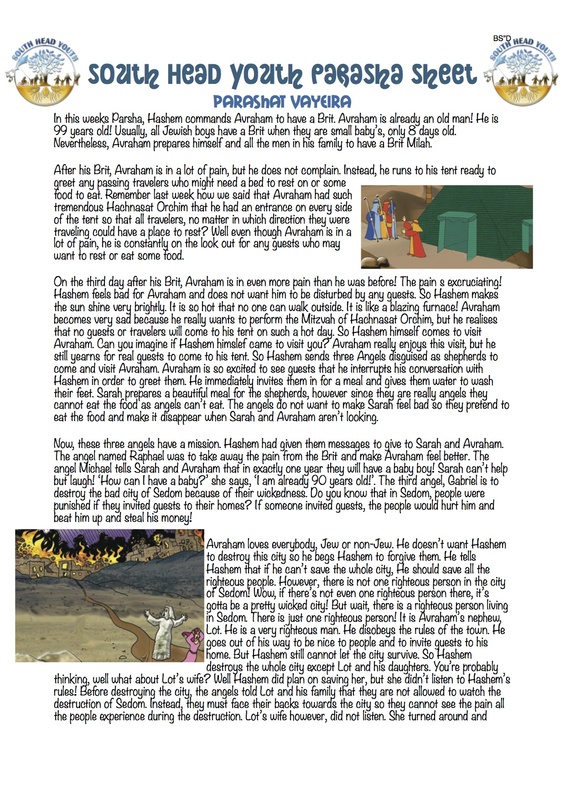 Hashem performs a miracle and Avraham is not injured from the fire. 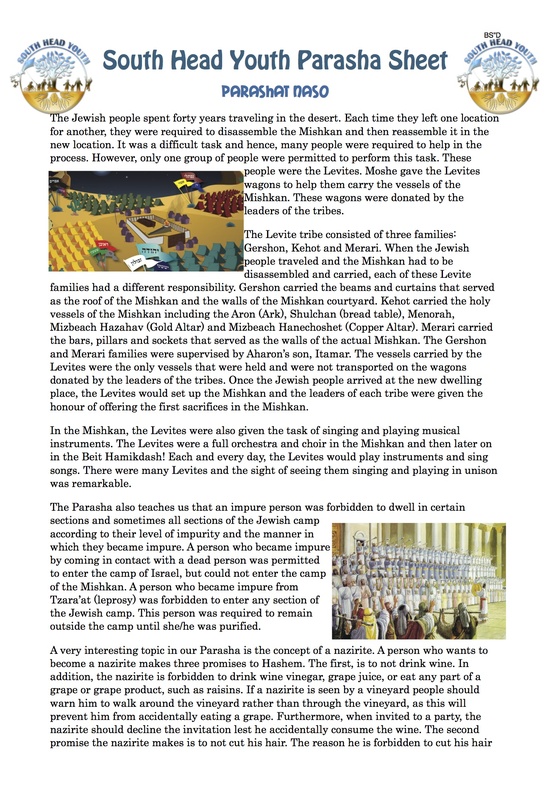 To learn about the Parasha in more detail, download our Parasha sheet! * Hashem creates the world in six days and rests on the seventh. * Adam and Eve sin by eating from the Tree of Knowledge. * Adam and Eve are banished from the Garden of Eden. * Kayin kills his brother Hevel. * Moshe composes a song warning the Jewish people against committing any sins. The first part of the song speaks about some of the not such good actions performed by people in the Torah. The second half of the song speaks of the good things Hashem has done for us. * Moshe tell the people that Hashem does not like to punish the Jewish people. Rather the punishments are to guide us and help us to repent and do Teshuva. * At the conclusion of the song Moshe climbs Mount Navo. From this mountain he is able to view the entire land of Israel. 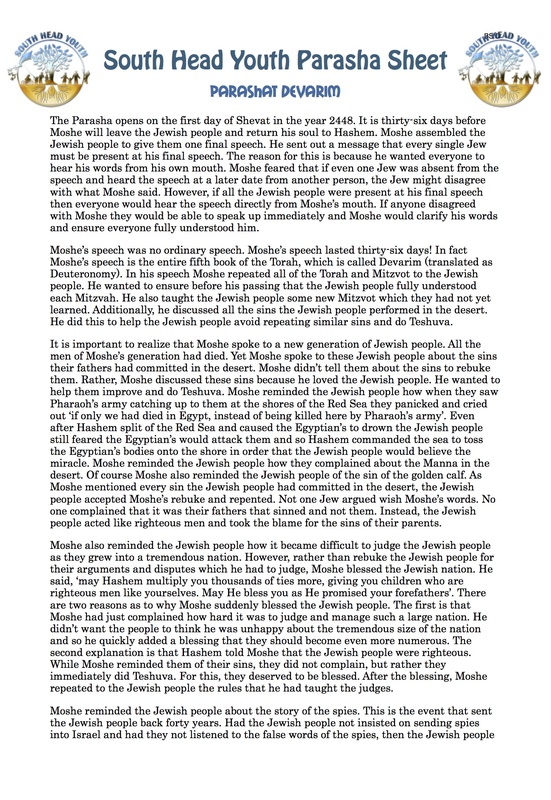 * Moshe tells the Jewish people that he is about to pass away. The Jewish people will enter the land of Israel under the leadership of Yehoshua. * Moshe informs the Jewish people that he will be making a new treaty between the Jewish people and Hashem. * Moshe reminds the Jewish people of the importance of the second commandment - 'Do not serve idols'. * Moshe tells the Jewish people that they need to overpower their evil inclination and do as many Torah acts as they can! 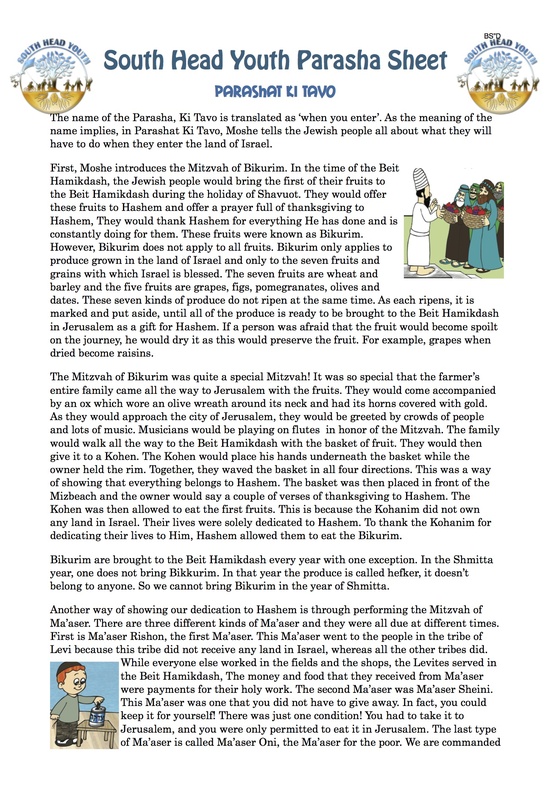 Moshe teaches the Jewish people about the laws of Bikurim. 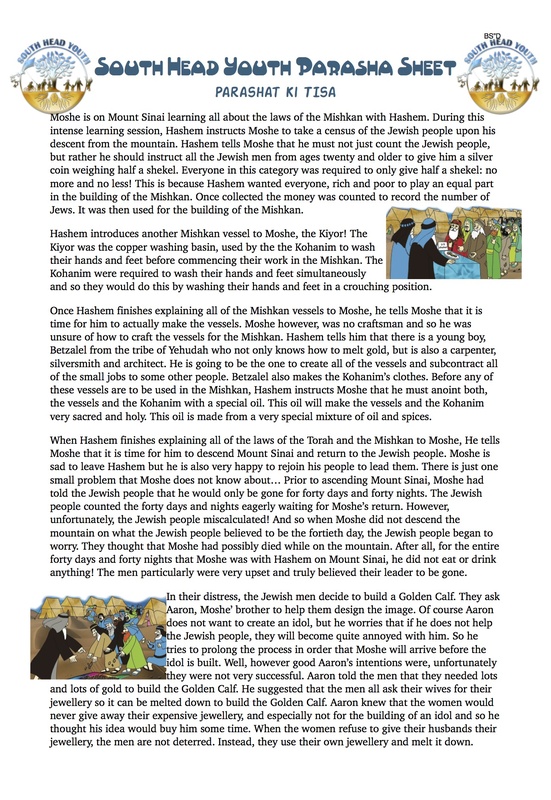 * Moshe explains and teaches the three forms of Ma'aser to the Jewish people. * Moshe instructs the Elders of Israel to take twelve stones and inscribe the Torah onto them in seventy languages when they enter the land of Israel. * The Mitzvah of Hashavat Aveida and many others. 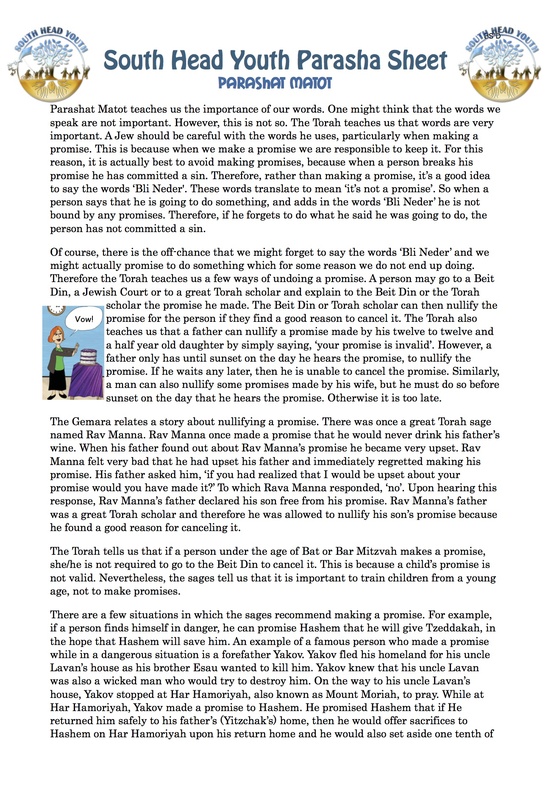 To read about the Parasha in more detail click here. 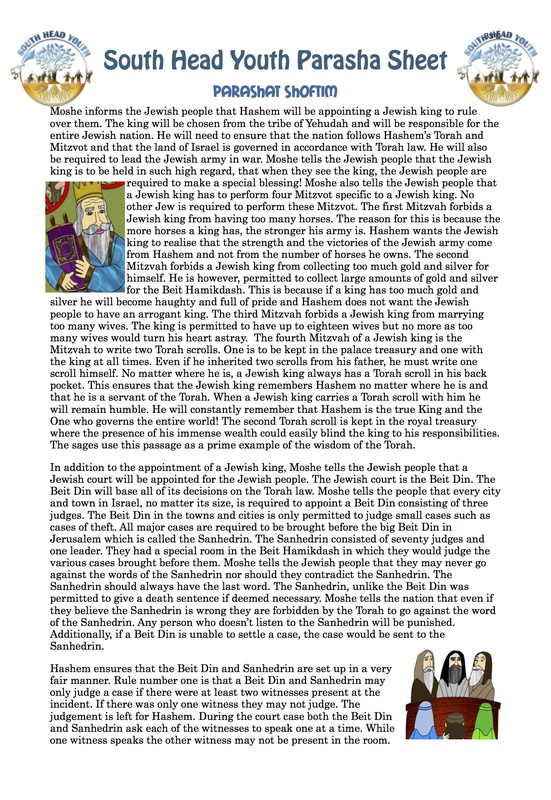 * Moshe informs the Jewish people that Hashem will be appointing a Jewish king to rule over the Jewish people. * Moshe tells the Jewish people that a Jewish court called the Sanhedrin will be appointed to judge all cases presented by Jewish people. 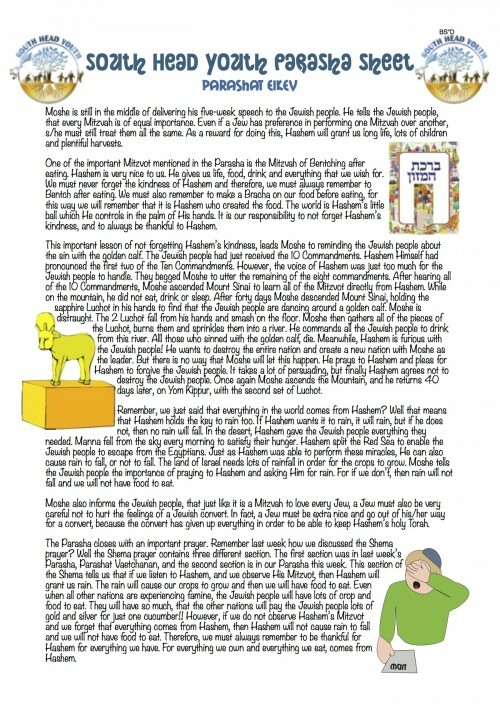 * Moshe warns the Jewish people against being superstitious. * Moshe speaks to the Jewish army about their preparation for war. To learn about the Parasha in more detail click here. * Moshe gives over fifty-five Mitzvot to the Jewish people including the laws of Kashrut, Shechitah and Tzeddakah. * The Jewish people are told that by keeping Kosher they are showing their unconditional love for Hashem. * The Jewish festivals and all the Mitzvot performed on the festivals are discussed. * Moshe warns the people against listening to false prophets. * Moshe continues his five-week long speech to the Jewish people. * Moshe tells the Jewish people of the commandment to Bentch after eating. He also tells the Jewish people that they need to say Brachot on their food before eating. * Moshe reminds the Jewish people of their sin with the golden calf. * Moshe reviews the second paragraph of the Shema. * Moshe warns the people against embarrassing another Jew, particularly a convert to Judaism. * Moshe continues his five-week long speech to the Jewish people. In his speech he reviews many Jewish laws. * Moshe calls out the 10 commandments for all the Jewish people to hear. * Moshe tells the Jewish people that a Jewish boy is commanded to wear Tefillin from the time he turns Bar Mitzvah. * Moshe tells the Jewish people to place Mezuzot on their doorpost. Both, the Tefillin and the Mezuzot serve as a reminder of Hashem. * Moshe tells the Jewish people 'you are a holy nation. Hashem has chosen you as His special nation'. * The wicked King Balak of Moab wants to destroy the Jewish people. He hires the false prophet, Bilam to curse the Jewish people. * Bilam tries to curse the Jewish peoples three times. However, each time he tries to curse them, Hashem makes a blessing come out from his mouth instead. 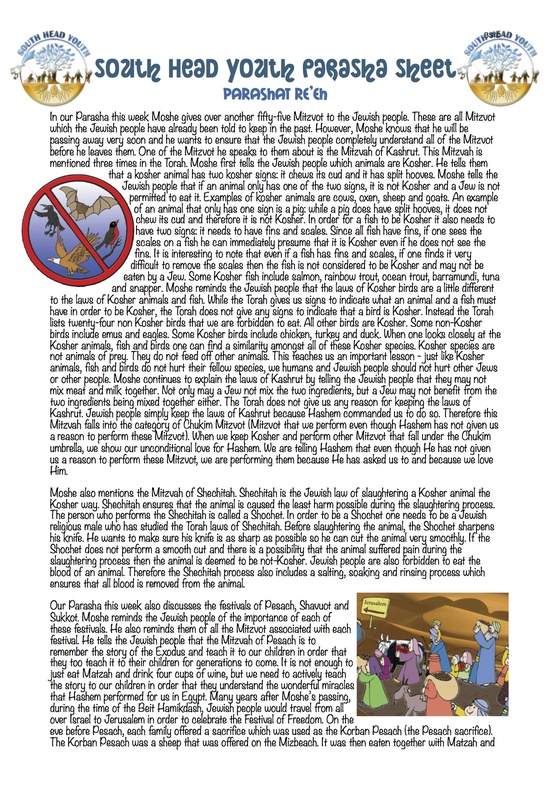 * A number of Jewish men sin with the women of Moab and Midiyan, and they are punished for their actions. 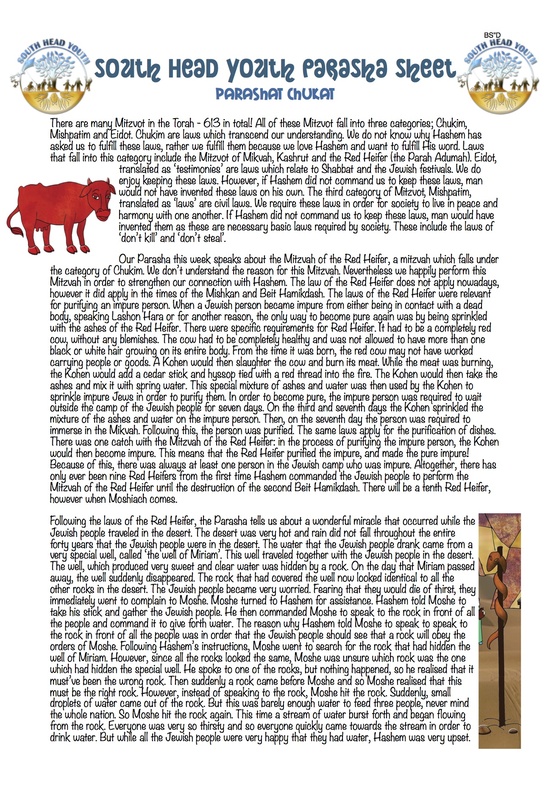 * We are taught about the Mitzvah of the Red Heifer. 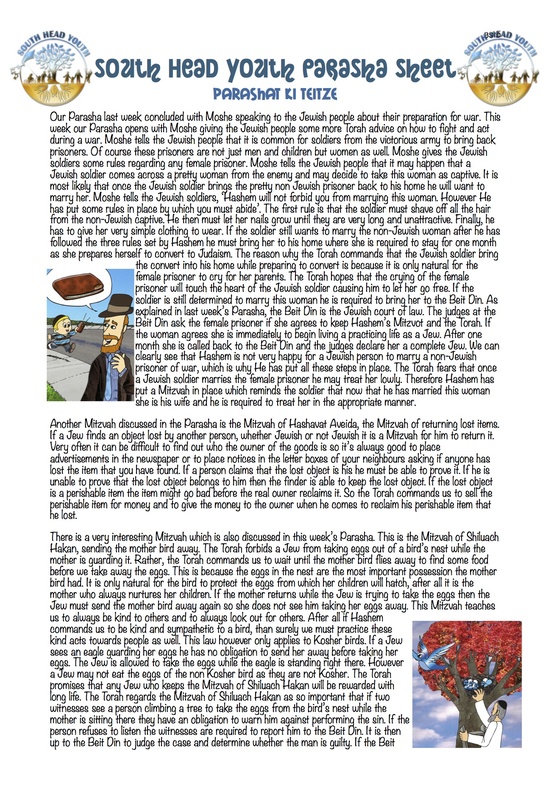 * Moshe's sister, Miriam passes away. When she passes away, the well that accompanied the Jewish people in the desert in Miriam's merit, disappears. * The Jewish people complain about the food in the desert. They are punished with a plague of snakes. * Moshe's brother, Aharon passes away at the age of 123. * The Emorites plan to attack the Jews. 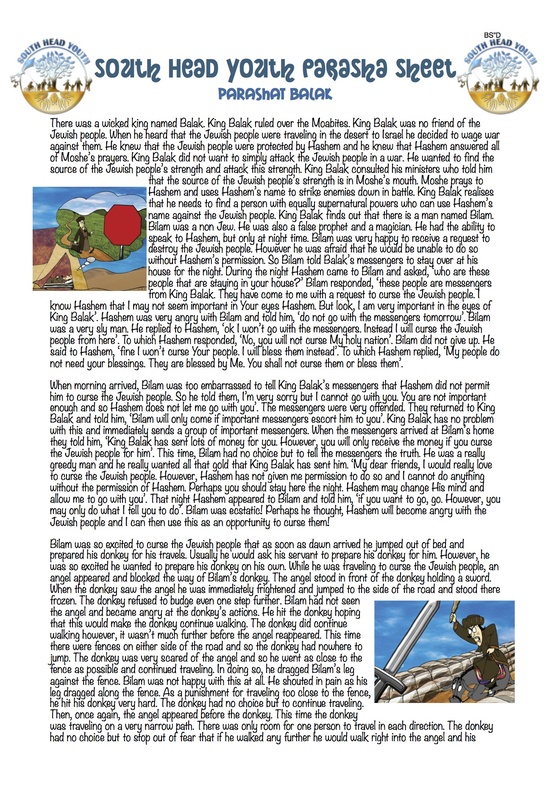 Hashem foils their plan and kills them. 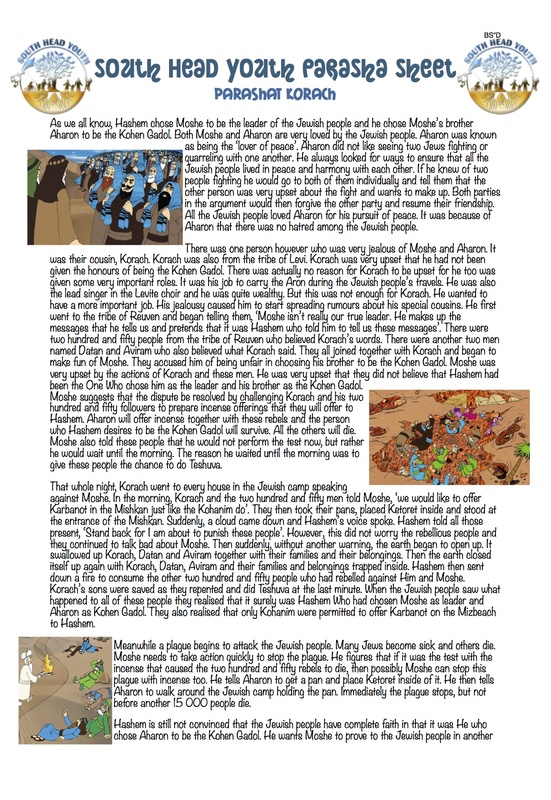 * Moshe's cousin, Korach is jealous that he wasn't chosen as Kohen Gadol and so he spreads rumours about Moshe and Aharon. * Korach is swallowed up by the ground. His followers are consumed by a fire sent down from heaven. * A plague breaks out and 15 000 Jewish people die. 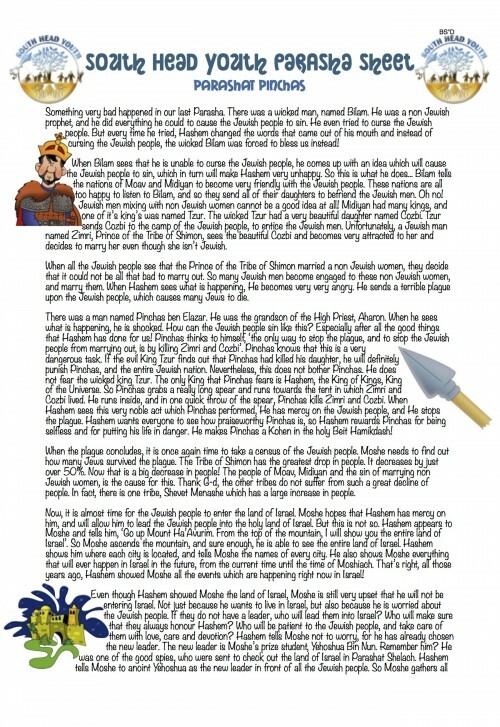 * The Jewish people realise that it was Hashem Who chose Moshe to be the Jewish leader and Aharon to be the Kohen Gadol. To learn about the Parasha in detail, click here. * Moshe tells the Jewish people that they are about to enter the land of Israel. The Jewish people become anxious and request to send spies to inspect the land first. * Ten out of twelve spies return to the Jewish people with a bad report about the land. 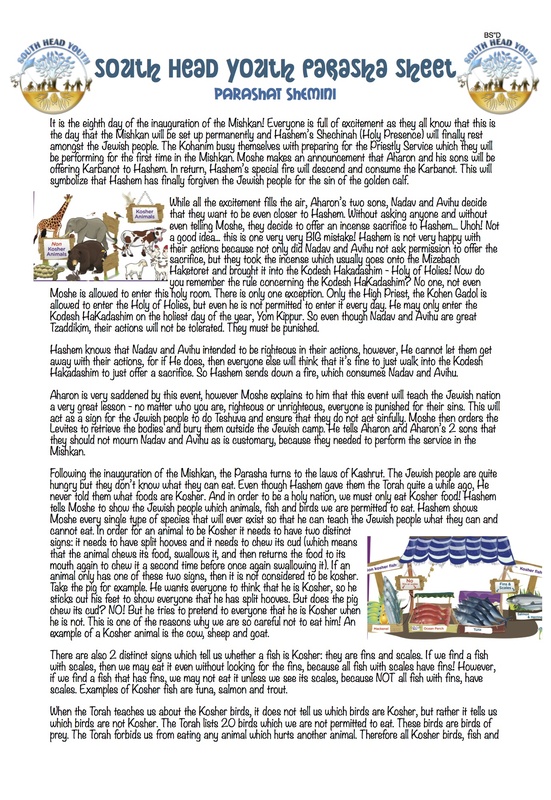 * Hashem teaches Moshe about the special Mitzvah of separating Challah. * Hashem teaches Moshe about the important Mitzvah of wearing Tzitzit. * Aharon is given the important Mitzvah of lighting the Menorah every morning and every evening. 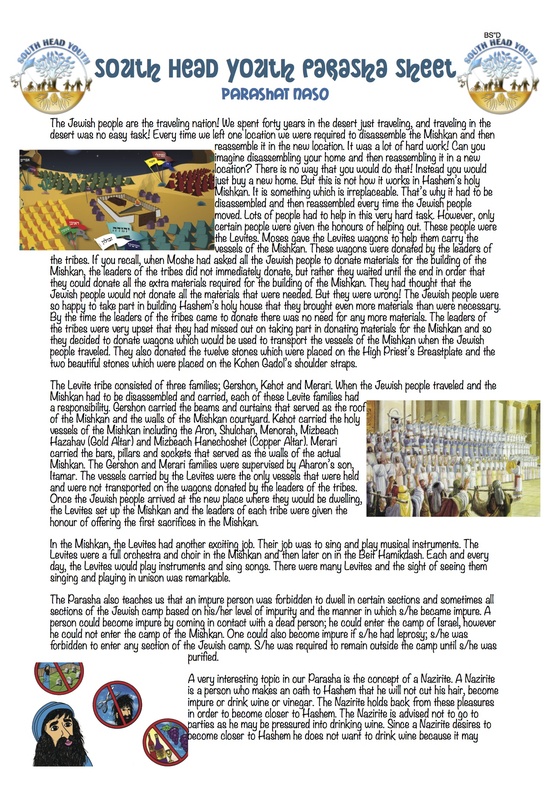 * The Levite tribe is initiated into its service in the Mishkan. * The Jewish people offer the Pesach sacrifice on the first anniversary of the Exodus of Egypt. * Pesach Sheini, 'the Second Passover' is instituted. * Quail rains down from the heavens for one month. 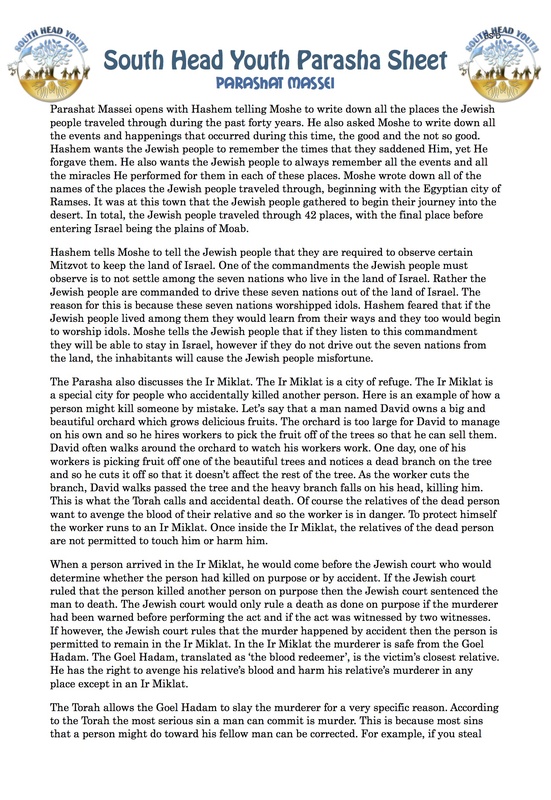 * Miriam is punished with Tzara'at for speaking Lashon Hara about Moshe to their brother Aharon. 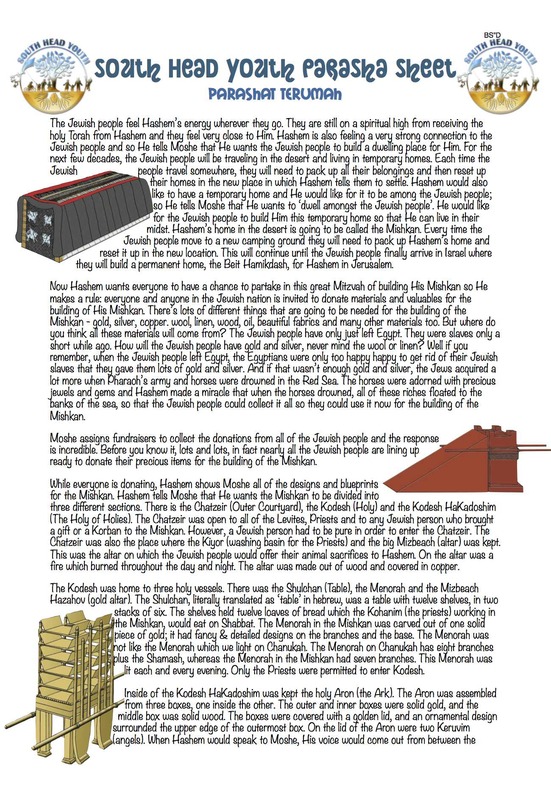 * We are told that every time the Jewish people traveled in the desert the Levites had the important task of transporting the holy vessels of the Mishkan. * We are told that the Levites had the very important job of playing instruments and singing songs in the Mishkan. * The laws forbidding an impure person from dwelling in the Jewish camp are explained. * The laws of the Nazirite are discussed. * Hashem gives the Kohanim the special task of blessing the Jewish people with the Birkat Kohanim Blessing. * Hashem commands Moshe to take a census of the Jewish people. 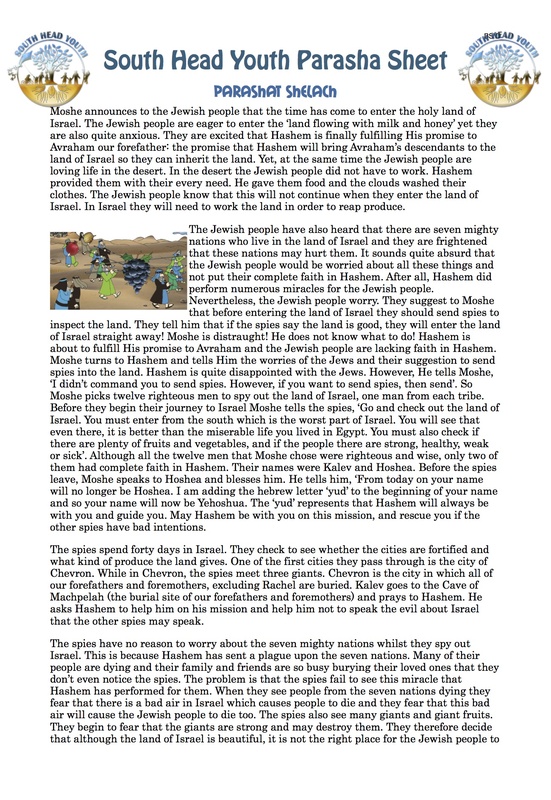 * The formation in which the Jewish people camped in the desert is described. 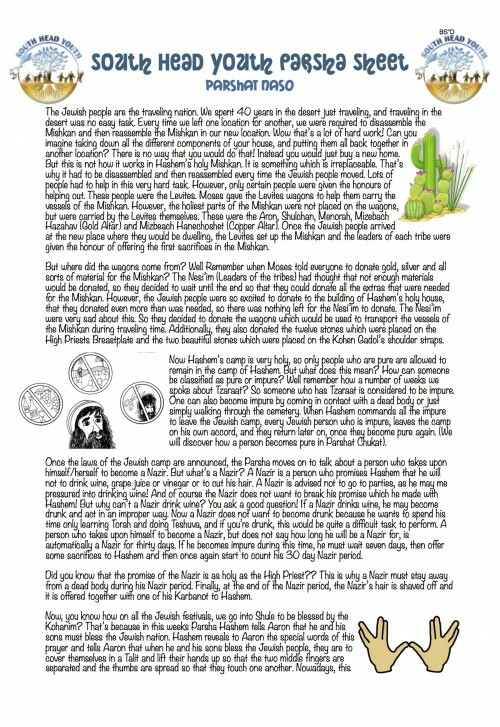 * The reason for the Pidyan Haben ceremony is explained. * The manner in which the Jewish people traveled in the desert is described. To learn more about the Parasha download our Parasha sheet! * The laws of the Shmittah cycle and Yovel (Jubilee) year are explained. * The importance of giving Tzeddakah is stressed. * The Parasha concludes by telling us of all the rewards we will receive if we keep Hashem's Torah and some of the not such good things that will happen if we don't keep the Torah. 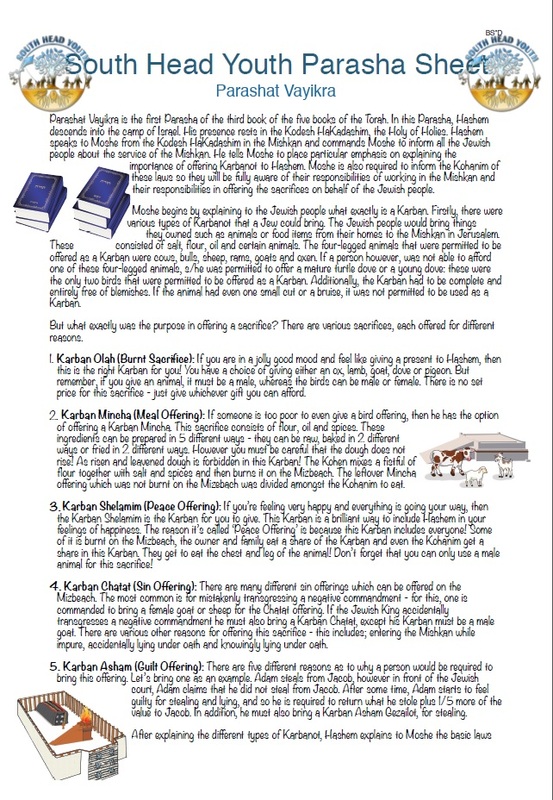 * The Torah lists the acts that a Kohen may and may not perform. * The Torah reminds us of the requirements of an animal that is to be offered as a sacrifice. * The Jewish festivals are discussed. This Sunday we celebrate Lag B'Omer. 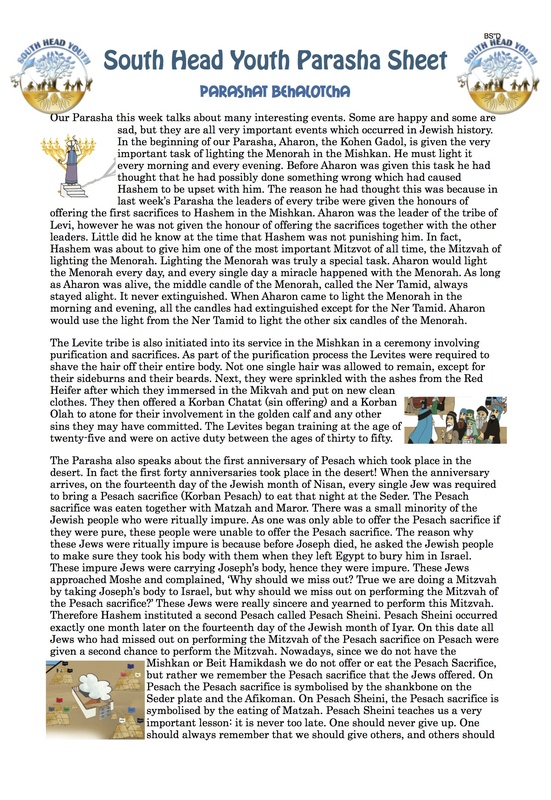 A brief summary of the festival is included in the Parasha sheet. * The Avodah service of Yom Kippur is discussed. 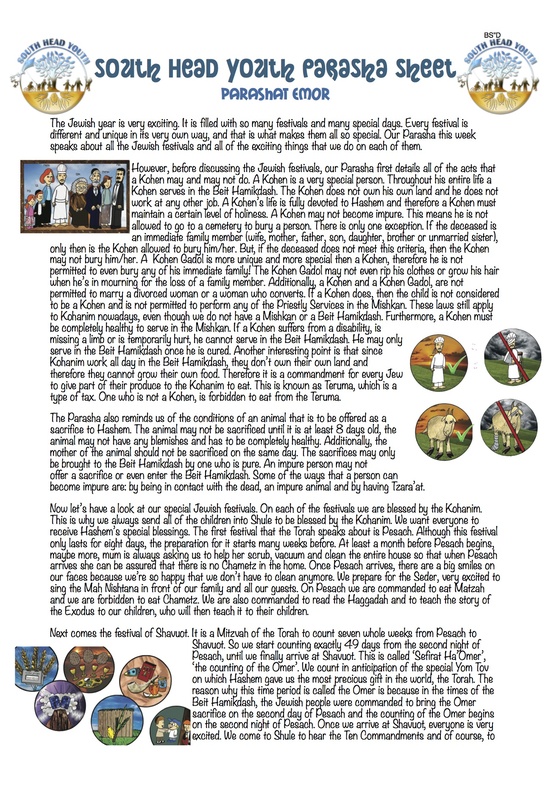 * We are commanded to be a holy nation. * Laws prohibiting us from eating the blood of an animal and tattooing our bodies, and laws teaching us to behave in a moral way are discussed. * The importance of the Mitzvah of Ahavat Yisrael is learnt from this week's Parasha. 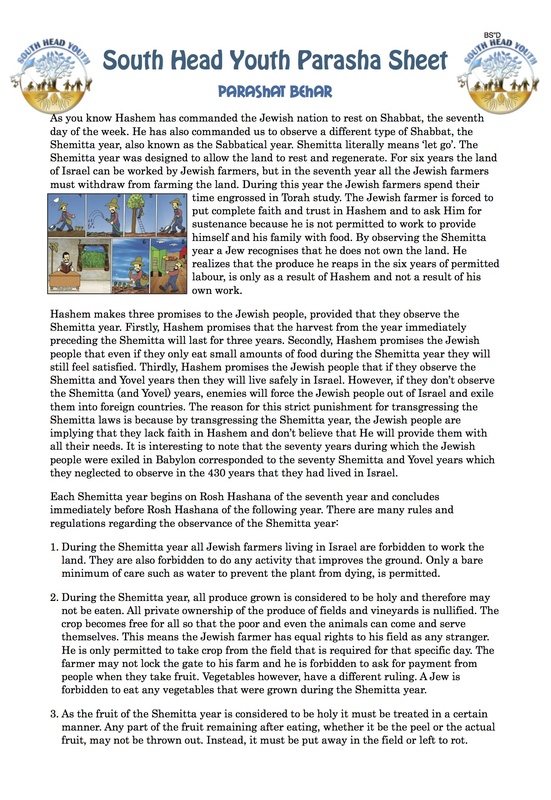 To learn about the Parasha in more detail, download our Parasha sheet. * The laws of Tzara'at are discussed. * Torah teaches us not to speak Lashhon Hara, gossip or slander about others. We are taught to only say nice things about other people. 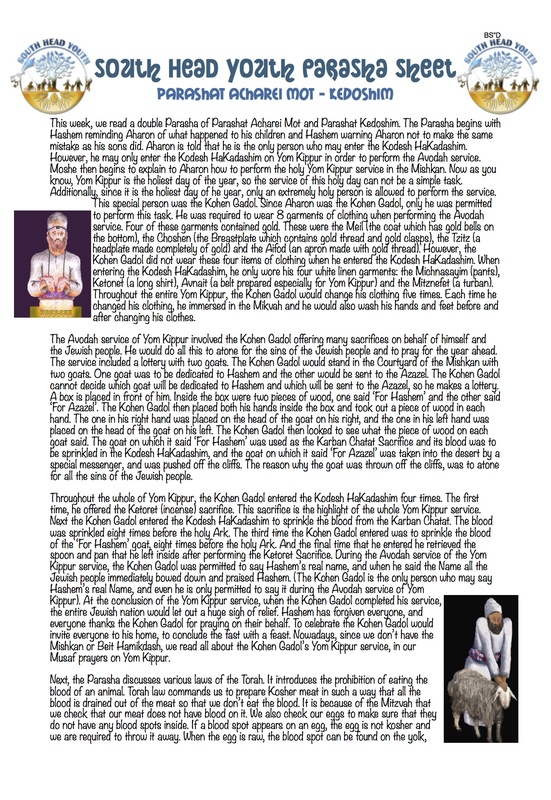 * Moshe continues to command the Kohanim regarding their duties in the Mishkan. 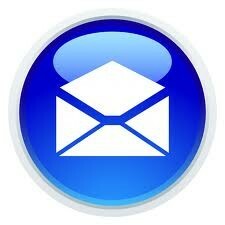 * We are taught about the daily service in the Mishkan. * We learn about the Thanksgiving Offering which we are required to bring after overcoming a difficult situation. Nowadays, we say Birchat HaGomel if we overcome a dangerous situation. *Moshe performs the priestly service for 7 days whilst the Kohanim observe. On the 8th day, the Kohanim begin their priestly service in the Mishkan: This is the day on which the Mishkan is inaugurated. This week we also celebrate Shabbat HaGadol, 'The Great Shabbat'. This is the Shabbat on which the Jewish people received their very first Mitzvah, the Mitzvah of the Karban Pesach. Shabbat HaGadol, always falls out on the Shabbat immediately preceding the festival of Pesach. * The inauguration of the Mishkan takes place. * 2 of Aharon's sons, Nadav and Avihu, are punished for entering the Kodesh HaKadashim to offer sacrifices. 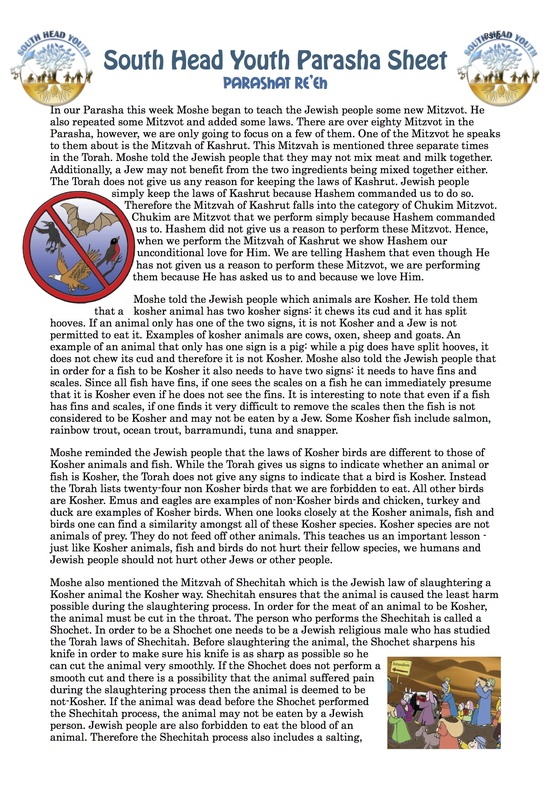 * Hashem tells Moshe the signs of a Kosher fish and animal. He also tells Moshe which birds are not Kosher (all other birds are Kosher). * We are given the law forbidding us to mix milk and meat together. * We are taught that Kosher food is food for our soul. Through eating Kosher food we strengthen our relationship with Hashem. * Vayikra is the first Parasha of the third book of the five books of the Torah. 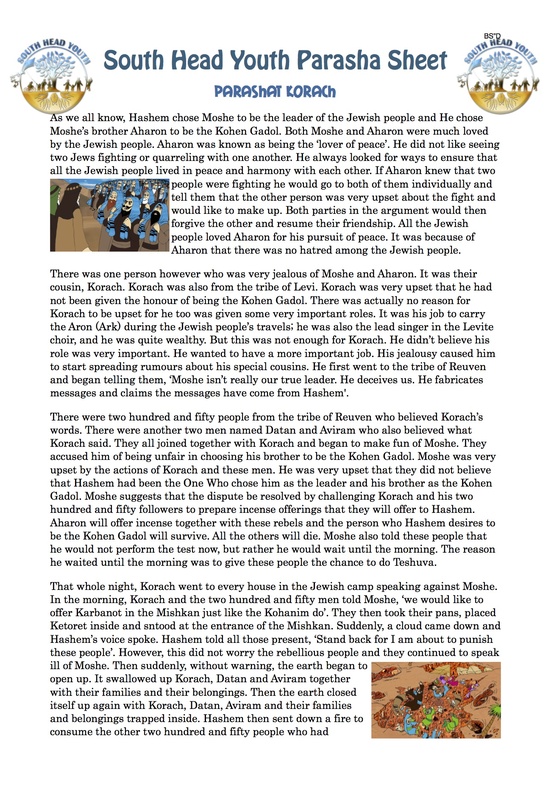 * Hashem descends into the Jewish camp and speaks to Moshe from the Kodesh HaKadashim in the Mishkan. 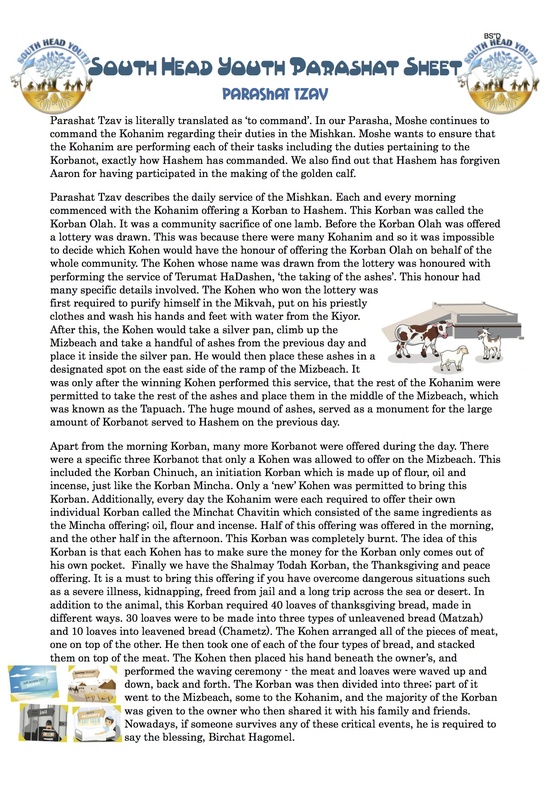 * Moshe explains to the Jewish people what a Karban is. He also tells them all the laws concerning the different Karbanot. * This week we read 2 Parshiot: Vayakhel and Pekudei. 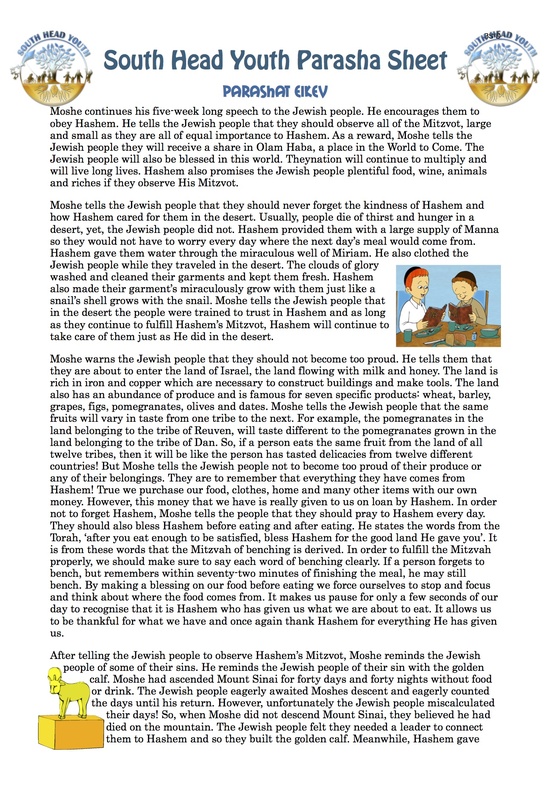 * Moshe tells the Jewish people that Hashem wants them to build him a Mishkan. 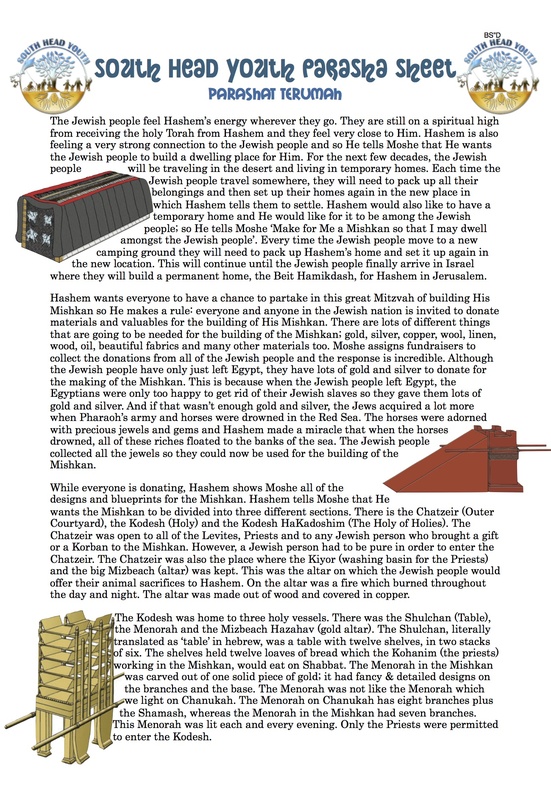 * The Jews immediately donate all the materials needed for the building of the Mishkan. 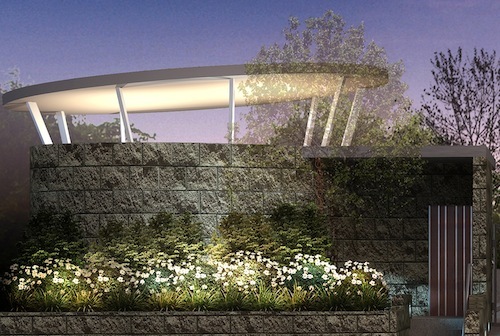 * Betzalel is assigned as project manager of the Mishkan. He hires an assistant, Ahaliav to assist him. He also takes assistance from any man or woman who have the required skills for building the Mishkan and its vessels. 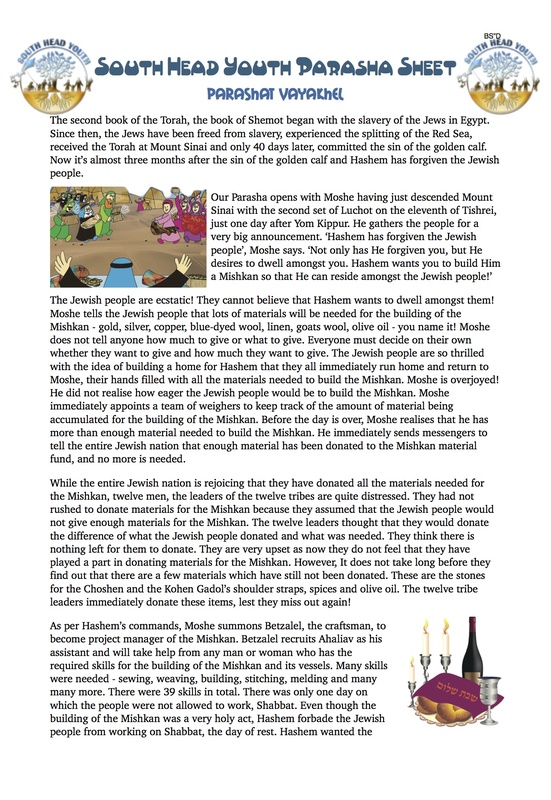 * Moshe tells the Jews they are not permitted to build the Mishkan on Shabbat. * Moshe assembles the Mishkan on the inauguration day. This week we will also be reading the Torah portion of Parashat Hachodesh, the Parasha in which Hashem tells us to establish the Jewish calendar by the monthly new moon. In this Parasha, Hashem also instructs us to bring the Paschal offering and to eat it with Matzah and bitter herbs. We are also told not to eat Chametz for 7 days. * Hashem instructs Moshe to take a census of the Jewish people. 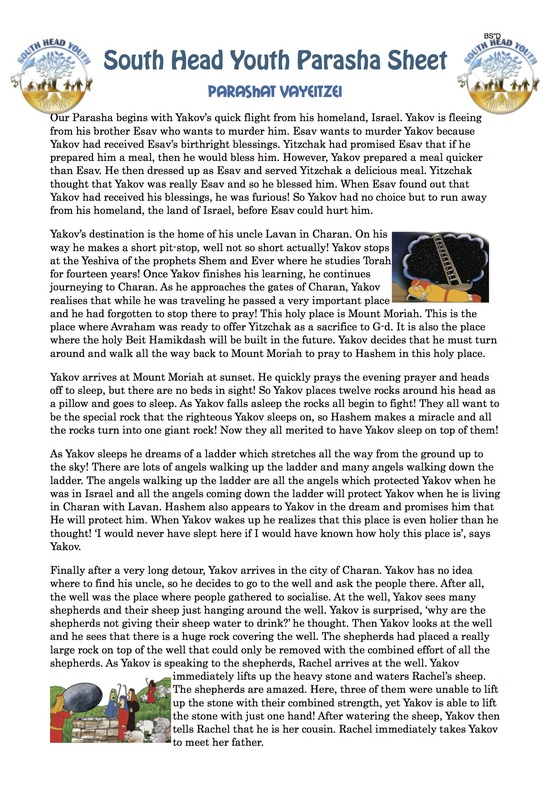 * Hashem introduces the Kiyor, the final vessel of the Mishkan, to Moshe. * Hashem instructs Moshe to hire a young boy, Betzalel from the tribe of Yehudah, to create the vessels for the Mishkan and the clothing for the Kohanim. * The Jewish people miscalculate the days that Moshe is on the mountain and fear Moshe to be dead, so they create the golden calf. * Moshe sees the Jewish people dancing around the golden calf and drops the holy Luchot (tablets) on the ground and they shatter to pieces. This week we will also be reading the Torah portion of Parashat Parah, which details the laws of the Red Heifer and the process by which an impure person was purified. 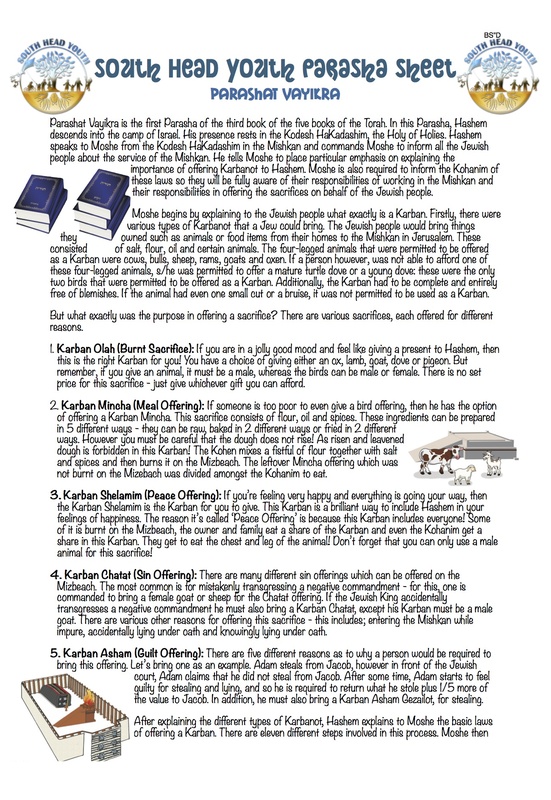 * The Kohanim are given the important task of performing all the work in the Mishkan. 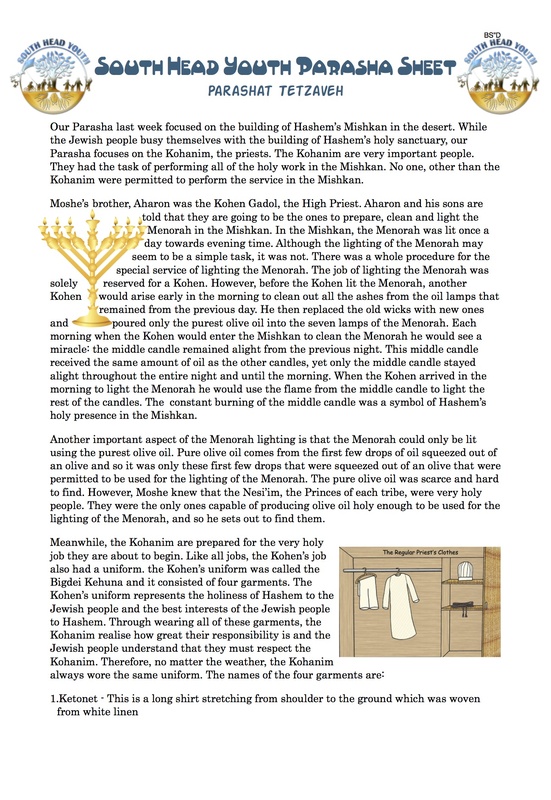 * The Kohanim are given a very detailed process on how to light the Menorah. 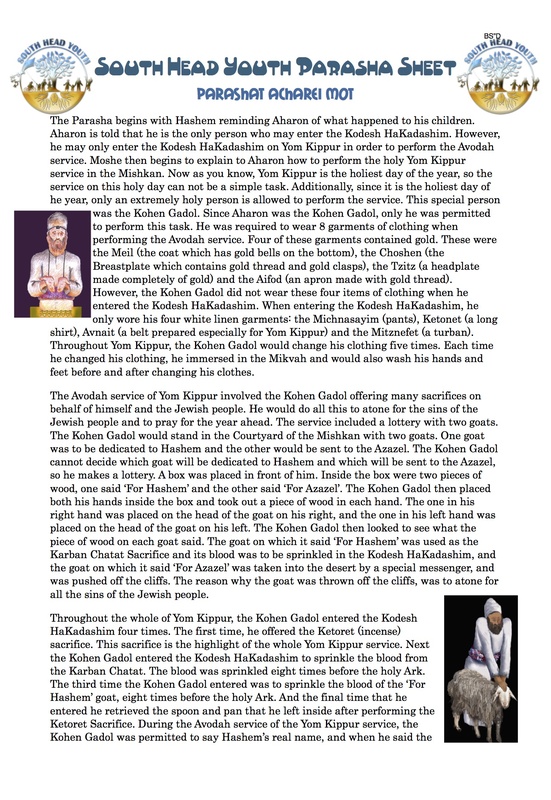 * The Kohanim are given a four-garment uniform to wear. 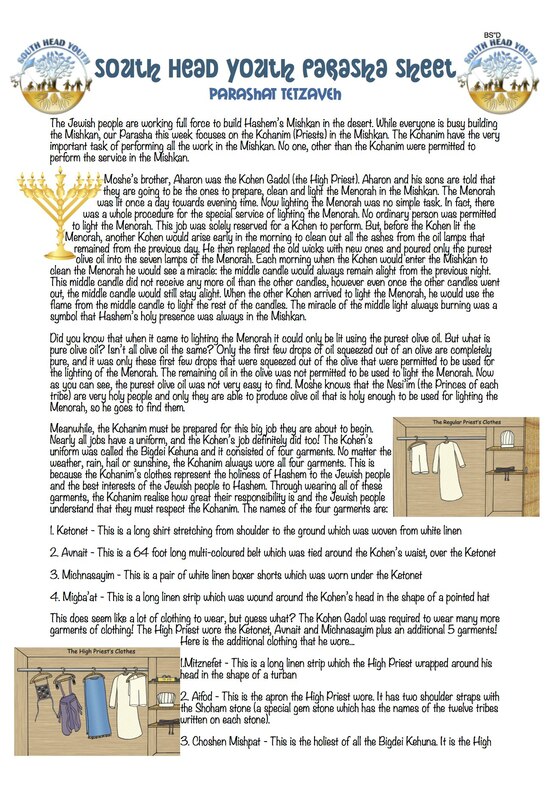 * The Kohen Gadol is given an eight-garment uniform to wear. This week we will also be reading the Torah portion of Zachor, which reminds us of the deeds of the nation of Amalek who tried to destroy us shortly after our freedom from Egypt. * Hashem tells the Jewish people to make Him a home so that He can live among them. This temporary home is called a Mishkan. * Hashem shows Moshe all the designs and blueprints for the Mishkan . * Hashem shows Moshe a fiery vision: in this vision He shows Moshe exactly how to design each and every vessel of the Mishkan. * Moshe begins to explain the 613 Mitzvot in detail to the Jewish people. * The Jewish people are taught all about the civil laws that they are required to keep. * Some of the Mitzvot which the Parasha talks about are keeping Kosher, telling the truth, not accepting bribes and a the laws of how to deal with a Jewish slave. Encourage your children to perform the Mission of the week and they will receive 5 Torah dollars! * Yitro, Moshe's father-in-law, converts to Judaism. 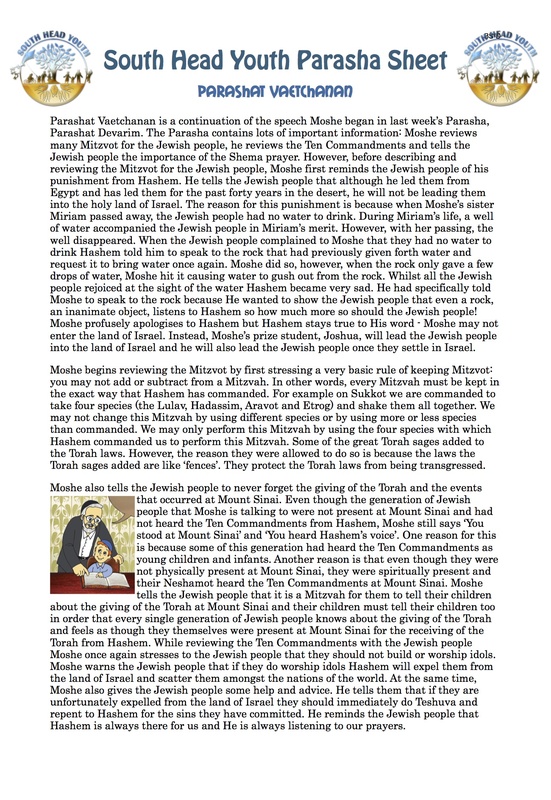 * Moshe hires a team of judges to assist him in answering questions and settling disputes that any Jewish person may have. * The Jewish people receive the Torah from Hashem!! * Yosef reveals to his brothers that he is their long lost brother. * Yakov and Yosef are reunited after 23 very long years of separation. 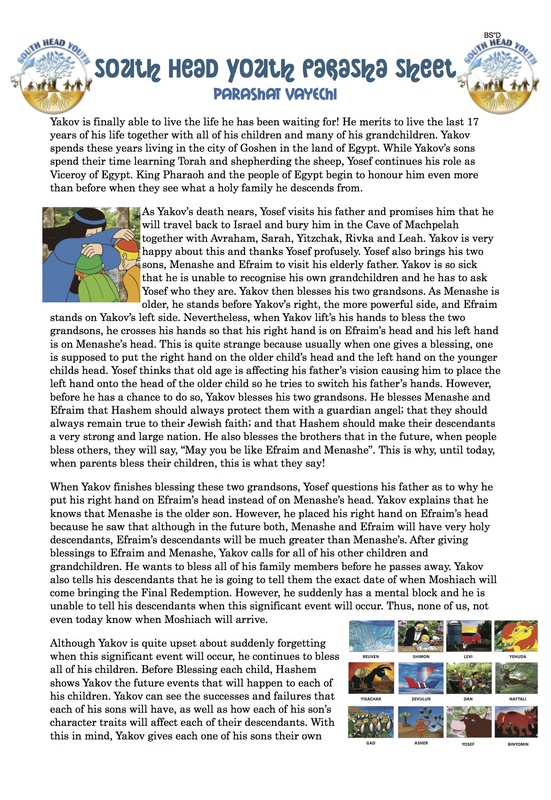 * Yakov and his family settle in the land of Egypt in the city of Goshen. * Yakov prays to Hashem asking Him to stop the famine. Hashem listens to Yakovs prayers and the famine stops. 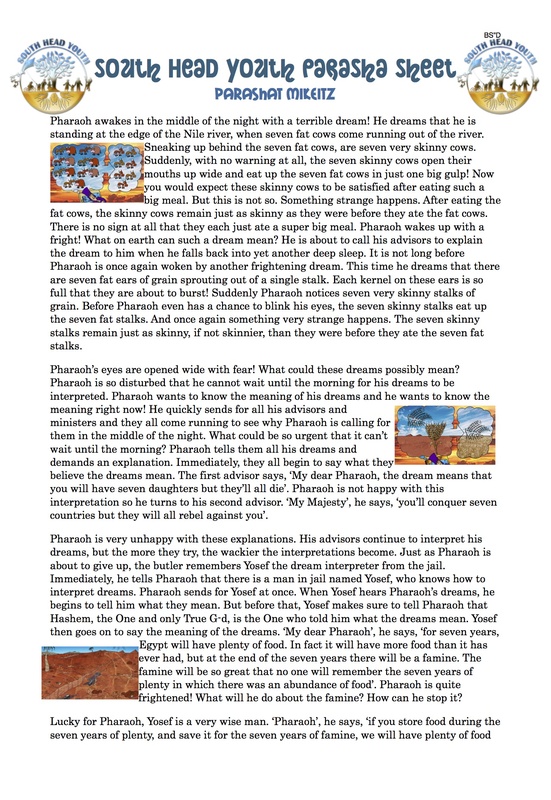 * Pharaoh has 2 frightening dreams in the middle of the night. He is greatly disturbed by these dreams and so he sends for his advisors to interpret the dreams for him immediately. 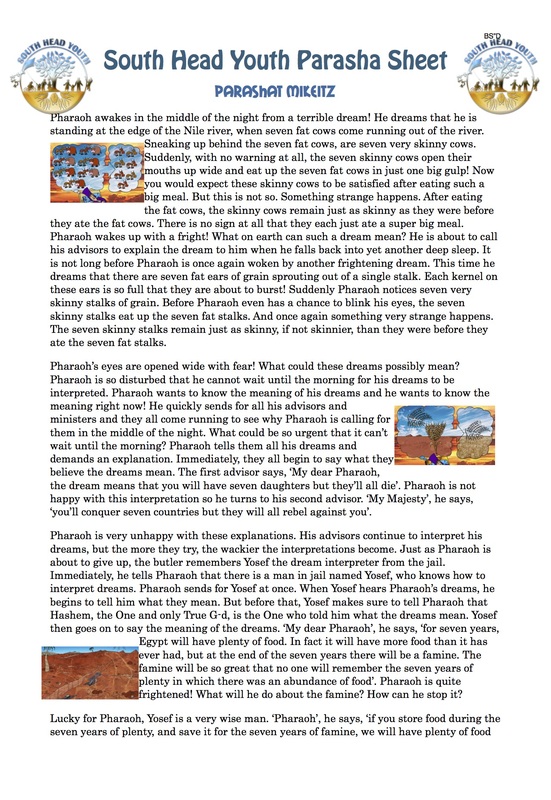 * Yosef is summoned from the jail to interpret Pharaoh's dreams. * Yosef is appointed viceroy over Egypt. * Yosef's brothers travel down to Egypt to buy some food. 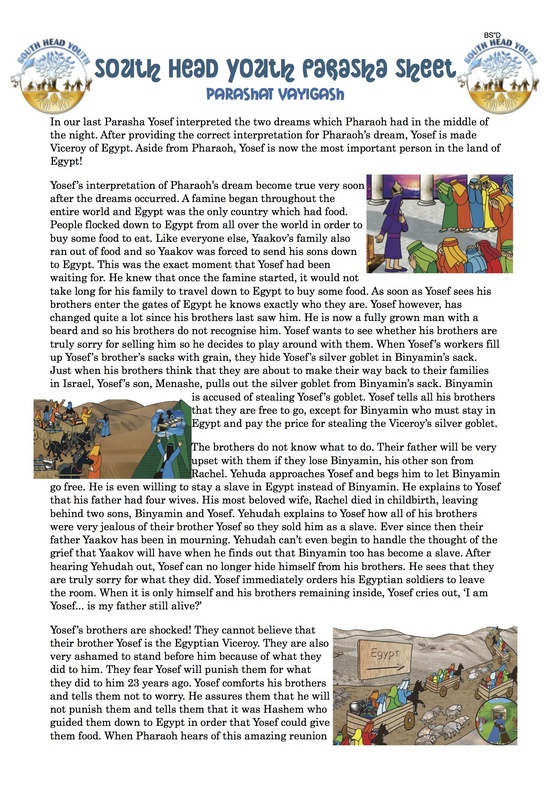 Yosef immediately recognises his brothers, however they do not recognise him. Yosef does not tell his brothers who he really is. * Yaakov loves Yosef even more than he loves his other children, so he makes Yosef a beautiful colourful coat. This causes Yosef's brothers to become very jealous. 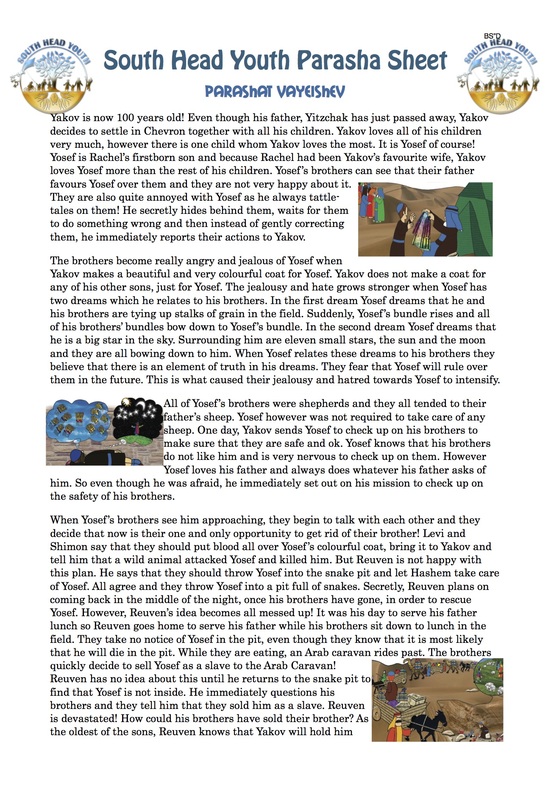 * Yosef has 2 very interesting dreams which he shares with his family. Yosefs brothers do not like this dream and their jealousy towards Yosef increases. * Yosefs brothers plot to kill him. * Yosefs brothers first throw him into a pit with snakes. They then sell him to Arab merchants. * Yosef is thrown into jail by his master Potifar. 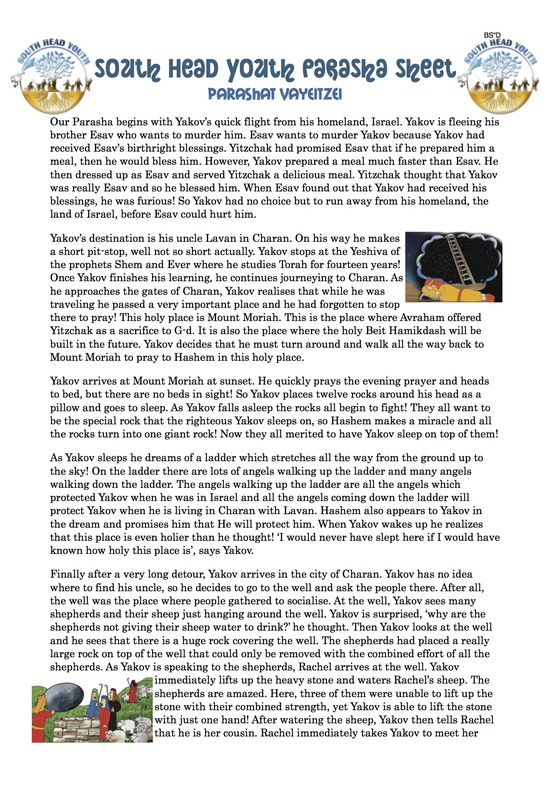 * Yosef interprets the dreams of the butler and baker who are also thrown into jail. * Yaakov sees Esav for the first time in 34 years. He does not know whether Esav has forgiven him and so he prepares for this meeting in three different ways. * Esav's guardian angel attacks Yaakov and wrestles with him all night. the angel eventually dislocates Yaakov's hip. * Binyamin, the last of the twelve tribes is born. His mother, Rachel, Yaakov's most beloved wife, dies in childbirth. * Rivka and Yitzchak pass away. 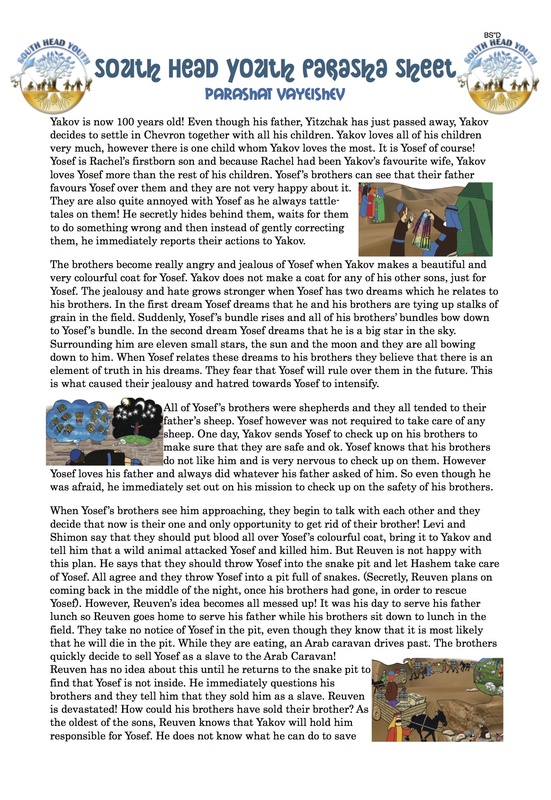 * Esav is very angry with Yakov and so Yakov is forced to run away from his home to his uncle Lavan in Charan. * Yakov prays to Hashem at the holy site of Mount Moriah. He then falls asleep and dreams of a ladder which stretches from Mount Moriah all the way to the sky. * The twelve tribes are born. * Yakov and his family flee from Lavan and return to Israel. 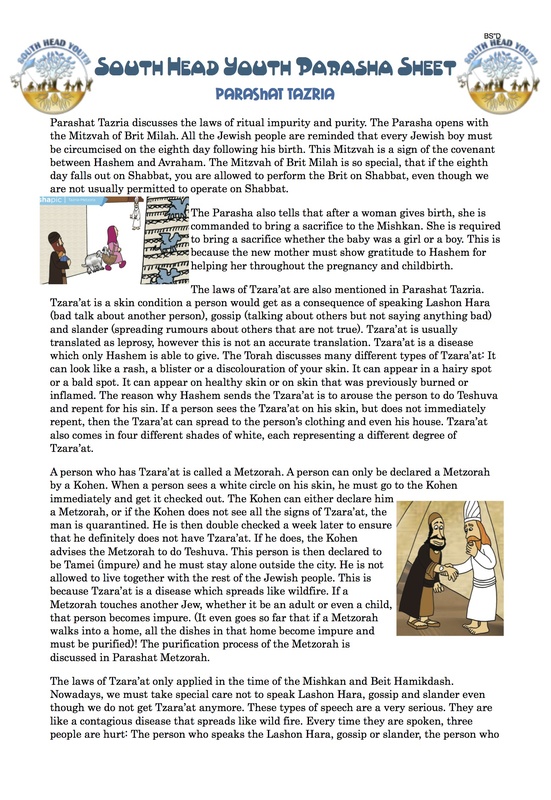 To learn about the Parasha in more detail,download our Parasha sheet! Welcome to this week's Parasha Sheet - Parashat Toldot. * Yakov dresses up like Esav in order to receive Esav's blessing's from their father Yitzchak. 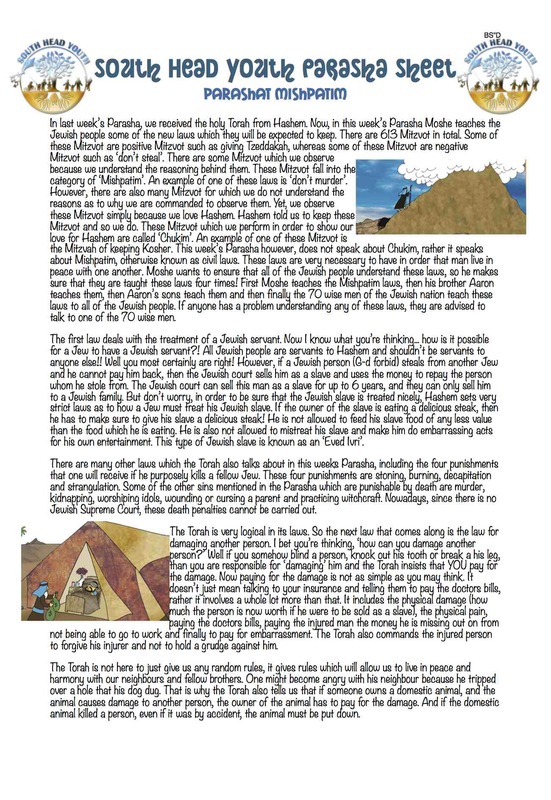 Download our Parasha sheet to read the Parasha in more detail! Dont forget to do the mission of the week! * Avraham has his Brit Milah at 90 years old and Hashem comes to visit him to cheer him up. * The city of Sedom is destroyed and Lot's wife turns into a pillar of salt. * Avraham and Sarah are blessed with a beautiful son, Yitzchak. * Hashem commands Avraham to offer Yitzchak as a sacrifice on Mount Moriah. 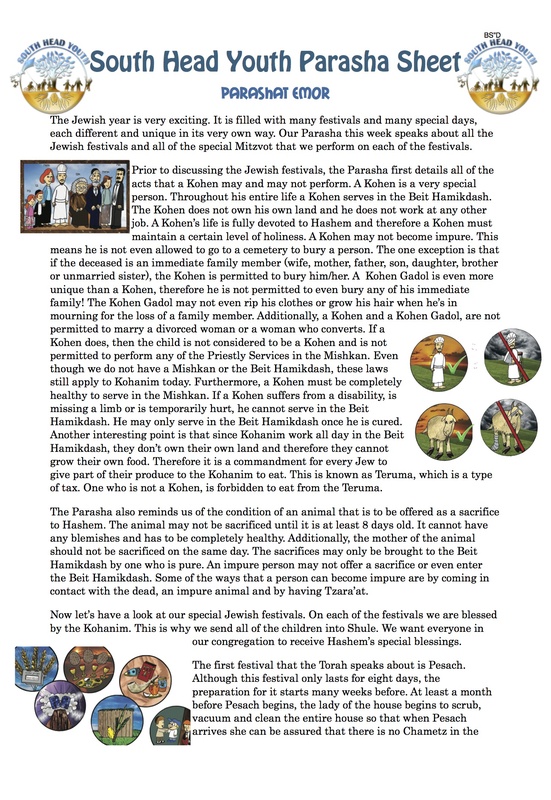 Download our Parasha sheet to view the Parasha in more detail. Avraham is born into a world in which everyone serves idols. He is dedicated to teaching everyone about the glory and the Oneness of Hashem. 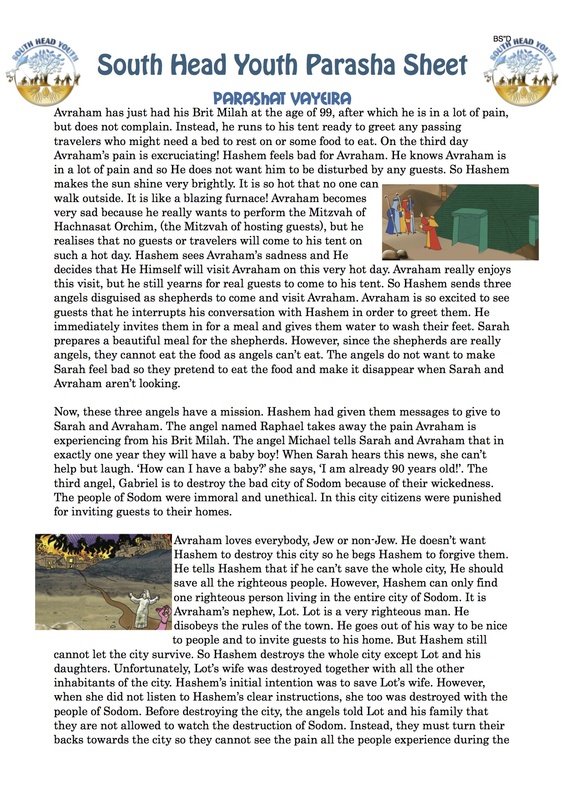 Together with his wife Sarah, he follows Hashem's command and departs for an unknown location which turns out to be the land of Israel. Avraham sets up a tent with four entrances in the middle of the desert so that all travellers will be able to stop by his tent for a meal. 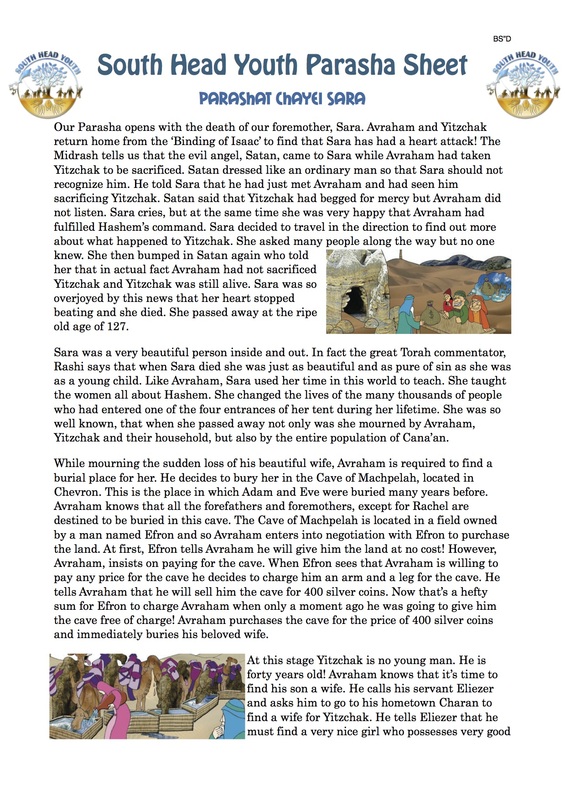 For more details, download our Parasha sheet! The world is corrupt and immoral, no one is nice to each other and so Hashem has decided to destroy the world with a flood. 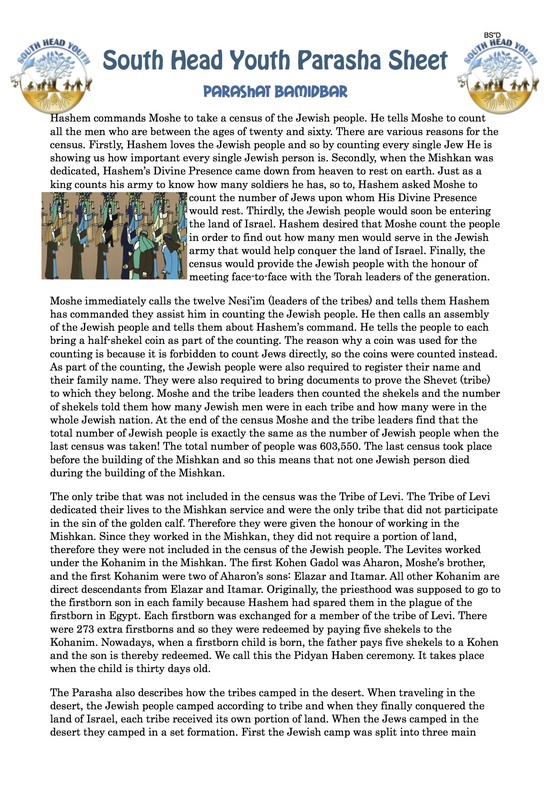 Read more about the flood in our Parasha sheet! 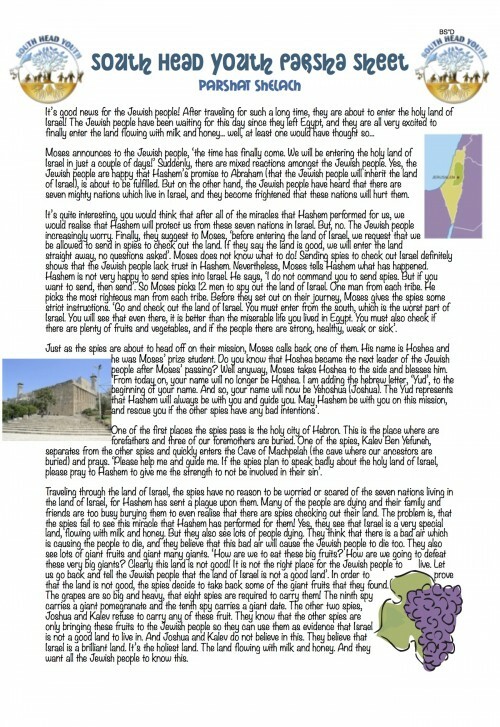 All new to our Parasha sheets is the Mission of the week which directly relates to the weekly Parasha. Encourage your children to perform the Mission of the week and they will receive 5 Torah dollars! Moshe reminds the Jewish people that Yehoshua has been chosen as the new leader to rule after him. He organises a communal gathering at which Yehoshua will address the people for the very first time. Additionally, Moshe introduces the very last Mitvzah in the Torah - the Mitzvah for every single Jew to write a Sefer Torah! But what happens if one is unable to write his own Torah? Read our Parasha sheet to find out! Moshe composes a song for the Jewish people, warning them against committing sins. He tells them that because he sinned, and hit the rock instead of speaking to it, he has been punished - he will not be entering the land of Israel together with the Jewish people, but will pass away in the desert. Our Parasha this week takes place on the seventh of Adar, the day of Moshe's passing. Moshe tells the Jewish people a fest last words before he returns his holy soul to Hashem. He reminds the Jewish people that they must observe Hashem faithfully and they should not serve idols. 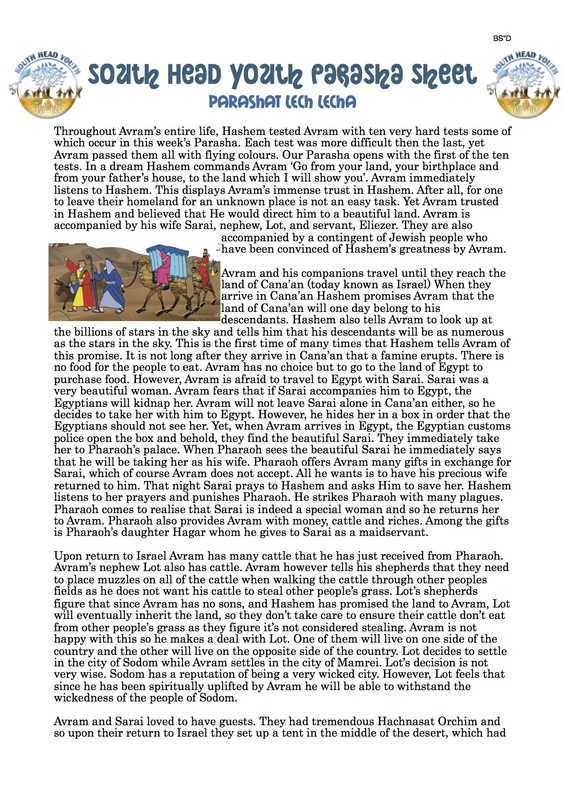 For more information on the Parasha, download our Parasha sheet. Moshe is still explaining many different laws to the Jewish people. Some of the laws which we discuss in this week's Parasha sheet are the Mitzvot of Hashavat Aveida, Shiluach Hakan and Tzitzit. For a more detailed understanding of these Mitzvot, and many others, please read our Parasha sheet. Our Parasha this week teaches us about the Mitzvot of Bikurim and Ma'aser. The Performance of both these Mitzvot, shows the dedication and love that the Jewish people have for Hashem. For a more detailed understanding of these Mitzvot, please read our Parasha Sheet! 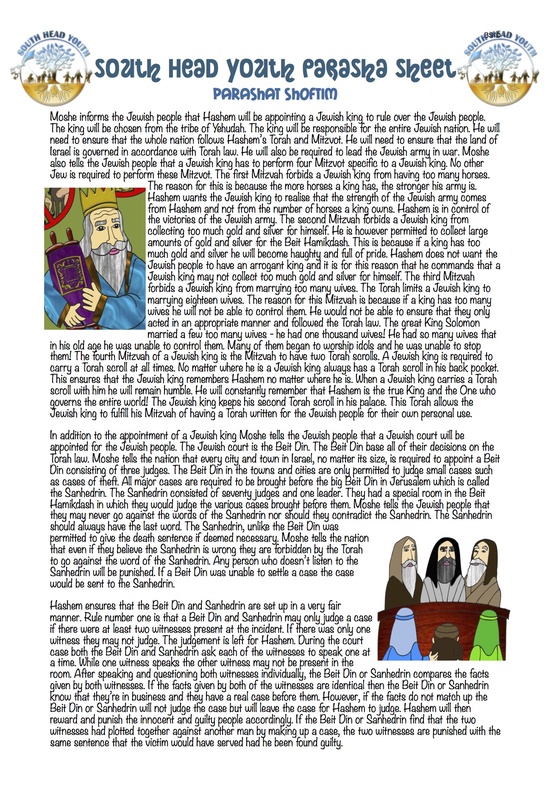 In this week's Parsha Moshe tells the Jewish people that Hashem will be appointing a Jewish King to rule the Jewish nation. The Jewish King will be G-d fearing and he will ensure that the land of Israel is governed in accordance with the Torah law. Moshe also tells the Jewish people that a Jewish court will be appointed to judge all of the cases that might arise between Jewish people. Please share our Parsha sheet around your Shabbat table and let your family and friends explore the Parsha of the week together with you. In this week's Parsha Sheet Moshe explains and details an additional fifty-five Mitzvot to the Jewish people. Among these Mitzvot, are the Mitzvot of Keeping Kosher, destroying idols, keeping and observing the Jewish Festivals, giving Tzeddakah and many more. Read our Parasha sheet to find out more about these Mitzvot. Our Parasha this week is a continuation of Moshe's 5-week long speech to the Jewish people. Moshe teaches the Jewish people of the importance of Bentching, he reminds them of their sin with the golden calf and informs them that it is Hashem who holds the key to rain. Our Parasha this week contains many important passages which are central to our Judaism. 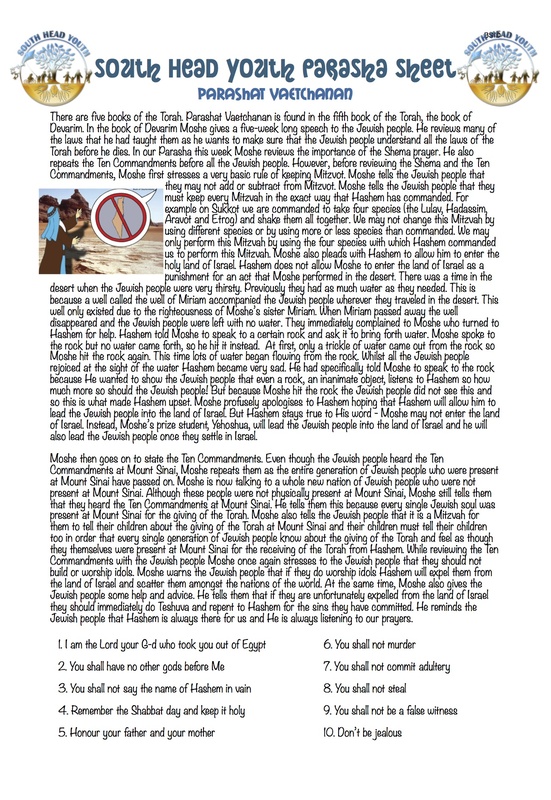 Moshe reviews the 10 Commandments with the Jewish people, in order to instil the commandments in their hearts. Moshe also teaches the Jewish people the Shema prayer, one of the most important prayers on Judaism. But why does Moshe review the 10 Commandments, and teach the Shema prayer now? Read our Parasha sheet to find out! The Jewish people have just defeated the nation of Midiyan, yet they are very sad! Do you know why? Additionally, Moshe begins to review all the laws and Mitzvot n the Torah to all of the Jewish people. He also reminds them of all the miracles that Hashem performed for them. This is one very long speech!! It is stretched all throughout the fifth book of the Torah, Sefer Devarim. 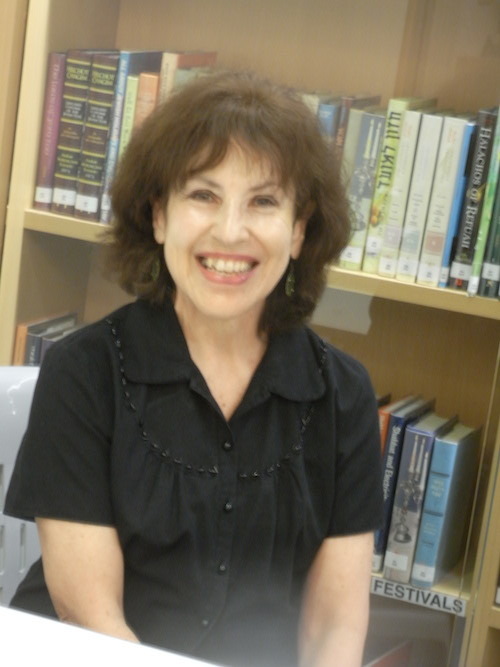 This week we have a double Parasha, filled with lots of interesting information and events. Did you know that it is forbidden to make a promise? 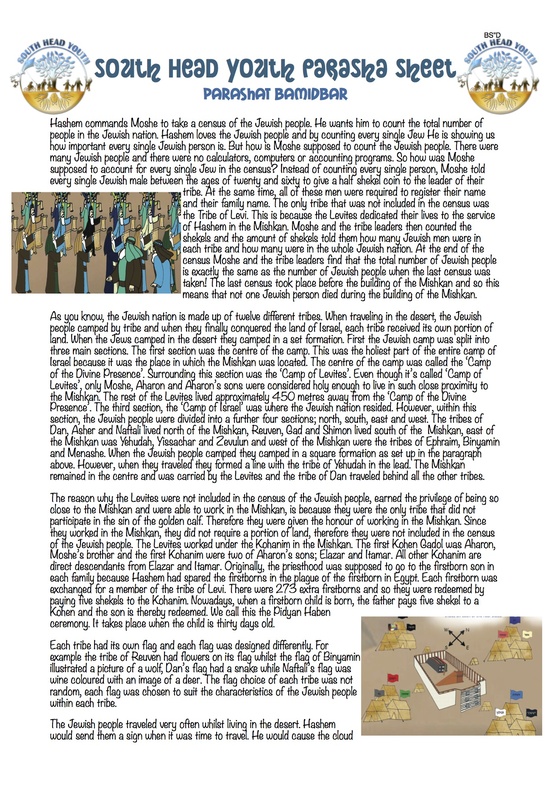 Did you know that the Jewish people won a war against Midyan, even though the army was not made up of trained soldiers? Did you know that you have to Toivel all of your dishes, before using them in your Kosher kitchen? Did you know the details of Aharon's passing? Did you know that an 'Ir Miklat' - 'City of Refuge', protects one who accidentally killed someone else? 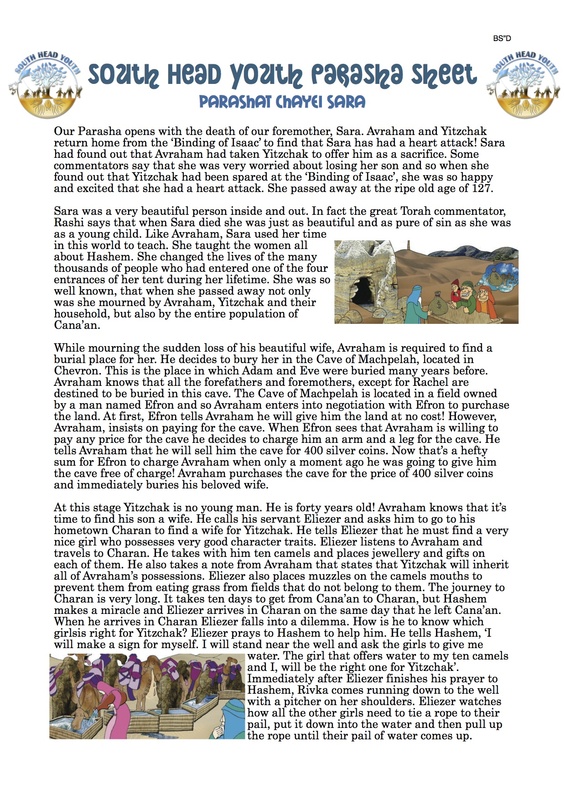 Read our Parasha sheet to find out all the details! Many Jewish people are marrying out, and Hashem is NOT very happy about this. One man stands up for the Jewish faith, and decides to put a stop to this. 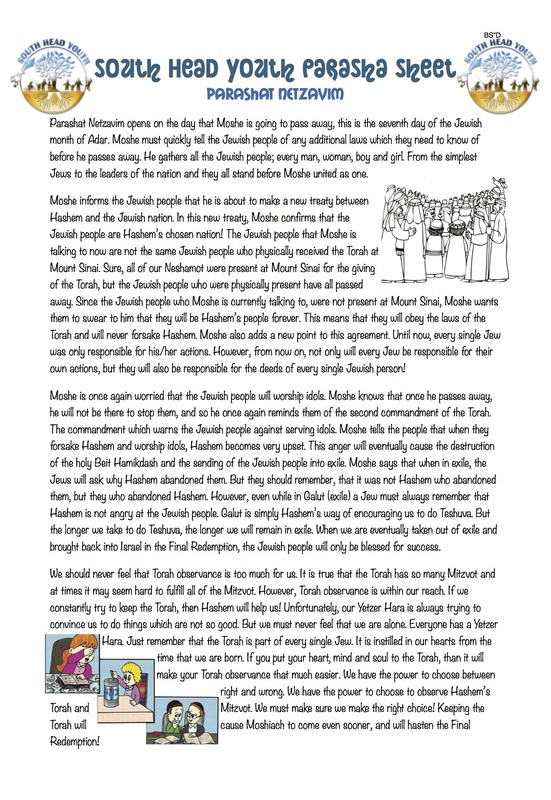 Also in this week's Parasha, Hashem shows Moshe the land of Israel, and all of the future events will occur in Israel from the current time, until the time of Moshiach. Read out Parasha sheet to find out more! 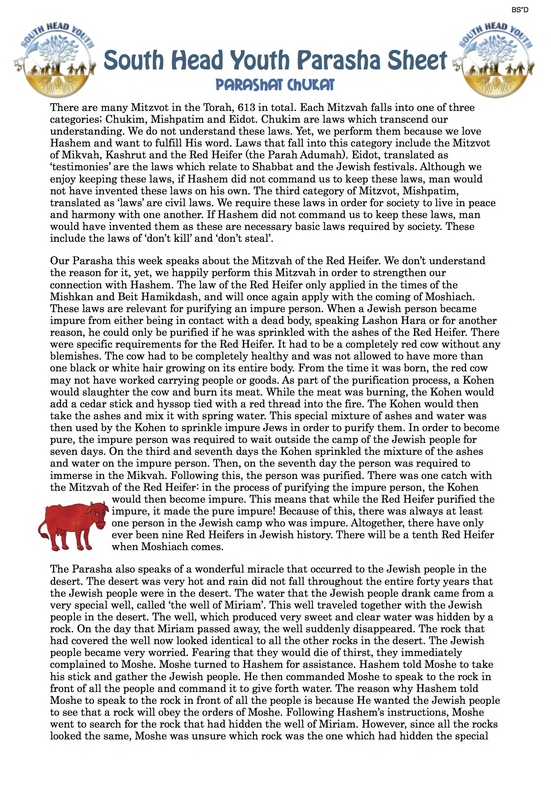 Learn about the important Mitzvah of the Parah Adumah (Red Cow). Why do we observe this Mitzvah? Find out what happens when Miriam pass away. Discover the miracles which Hashem performed for the Jewish people. Moshe's first cousin, Korach becomes jealous that he was not made the Kohen Gadol. 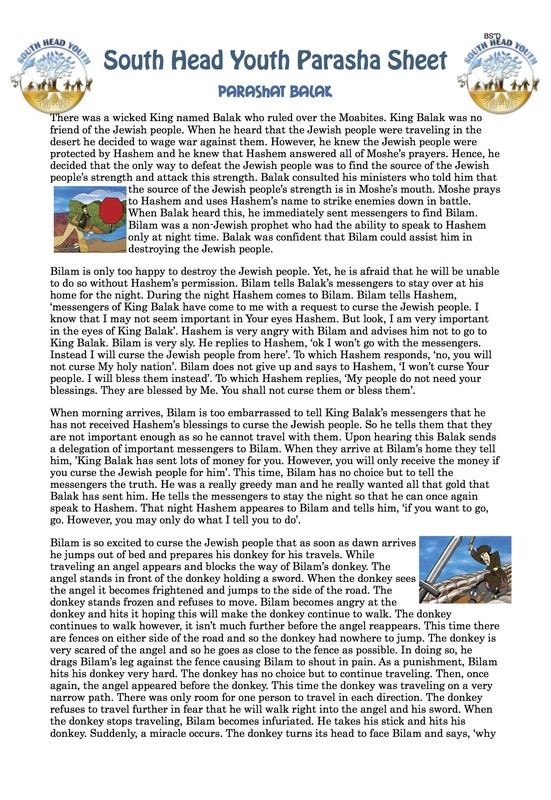 In his rage, he causes a rebellion against Moshe. 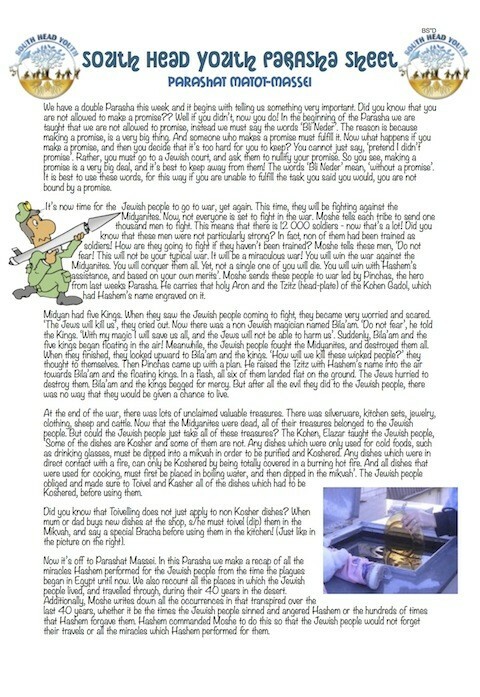 But will Hashem let Korach fight against Moshe? What will Korach's punishment be? Read our Parshat Korach Parsha Sheet to find out! The Jewish people are just about to enter the land of Israel, when suddenly they have a dip in their faith. * What if the land of Israel is not good enough? * What if the giants living in Israel crush us? * What if the seven nations living in Israel destroy us? The Jewish people become very nervous and decide to send spies to check out the land of Israel before they enter… a decision which leads to a disaster! Also in this weeks Parsha is the Mitzvah of Tzitzit and the Mitzvah of Hafrashat Challah - one of the 3 Mitzvot given specifically to the Jewish women. Parshat Behalotecha speaks about many interesting events which occurred while the Jewish people were living in the desert. Who was given the honours of lighting the Menorah every day in the Mishkan? What is the significance of Pesach Sheni? What were the Levites required to do in order to commence their holy work in the Mishkan? Were the Jews happy to just eat Mann in the desert, or did they want other food? Which righteous person is punished with Tzara'at and why? Read our Parsha sheet to find out! 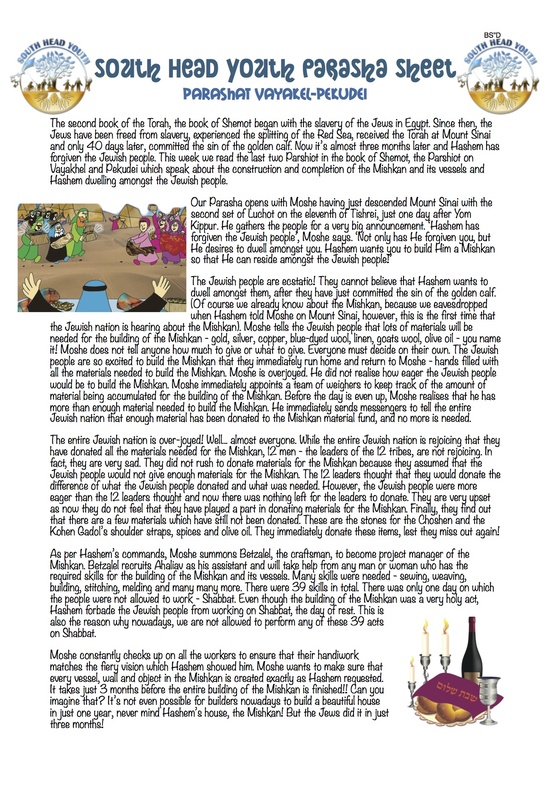 Parshat Naso speaks about the Mishkan and the laws of the Nazir. It is also the very first time that Hashem tells Aharon and his sons to bless the Jewish people, and reveals the words of the Priestly Blessings to Aharon. Since then, the Jewish people around the world are blessed by the Kohanim on the Jewish festivals. In Israel however, the Jewish people are blessed by the Kohanim more frequently. 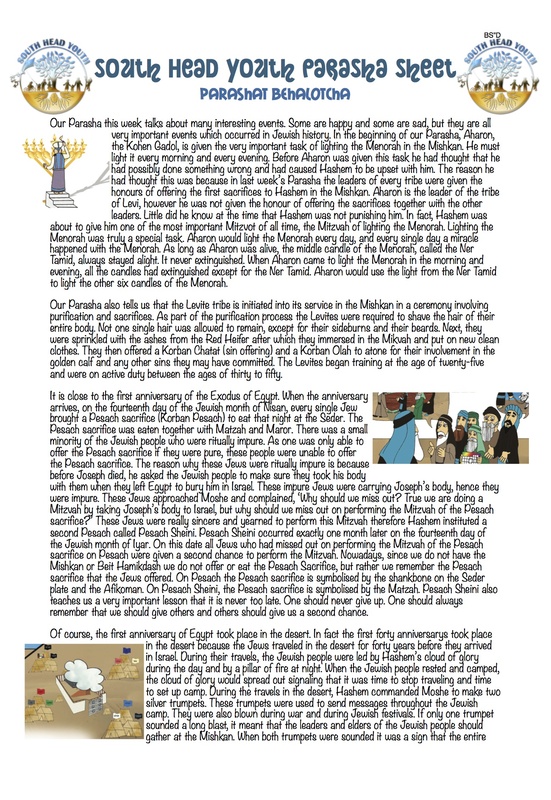 With the festival of Shavuot coming up this Saturday night, we are very happy to present our very own Shavuot story sheet. Learn all about this very important historic event in Jewish history. When did we receive the Torah? What occurred while we prepared for this special event? Who was present at Mount Sinai for the receiving of the Torah? 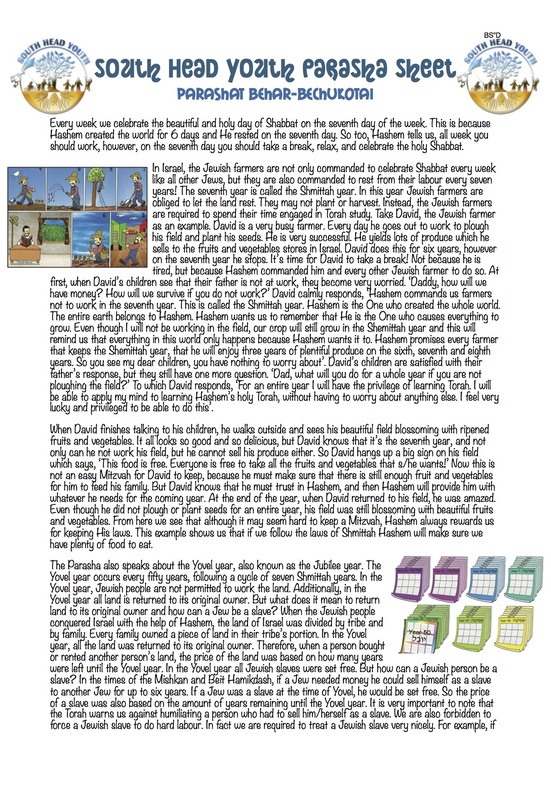 Read our Shavuot Sheet to find out! Read our Parsha sheet to find out more! Once again, we have a double Parsha this week! Parshiot Behar and Bechukotai teach us all about the Shemittah year. Just like we celebrate Shabbat every week on the seventh day, every seventh year we are commanded to observe the Shemittah year. Jewish farmers may not plough their fields or plant their seeds. Find out more about the Mitzvah of Shemittah by reading this weeks Parsha! And one of the most important elements of education and especially Jewish education, is the home. Children look up to their parents and follow their cue. The more involved in Judaism you are, the more involved your children will be too. So we have decided to help you! Undoubtedly, you celebrate Shabbat every Friday night and have a Shabbat meal with the family. 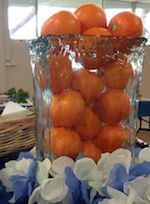 But what is there to talk about at the Shabbat table? How can we make sure that our children understand that Friday night is quite different to any other dinner night? The answer is through sharing your Jewish interest with your children on Shabbat! And we are here to help you do that! 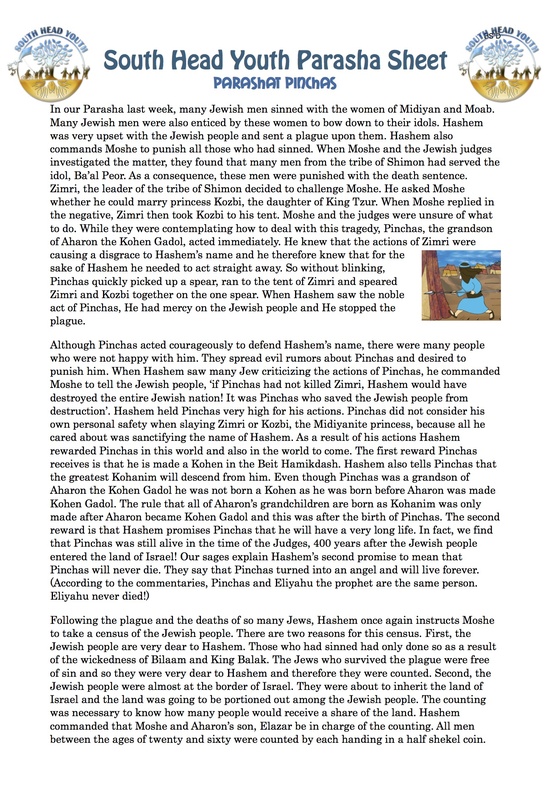 Every week, we prepare a Parsha Sheet on the weekly Parsha which includes fascinating facts about the Parsha. The Parsha has been watered down to its simplicity so that even a small child can understand it. 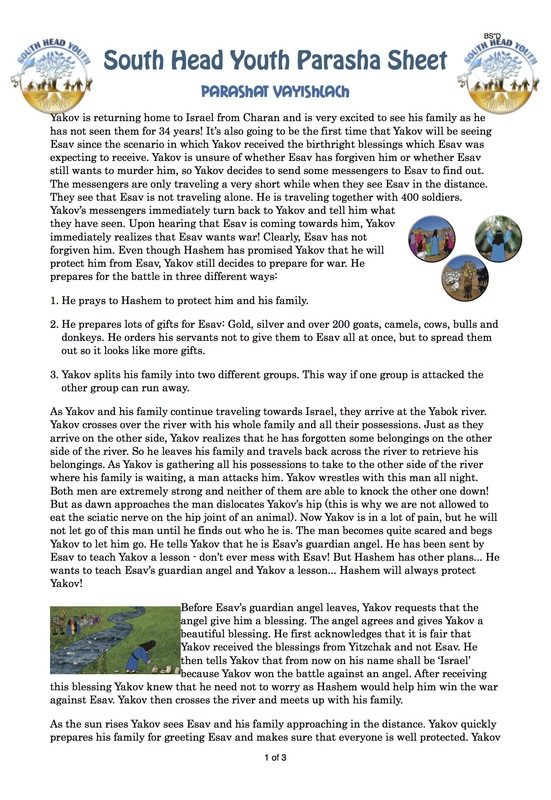 It also includes Parsha questions which you can use to interact with your child/ren. Make sure to check this spot weekly, so you can download the Parsha Sheet every single week before Shabbat!